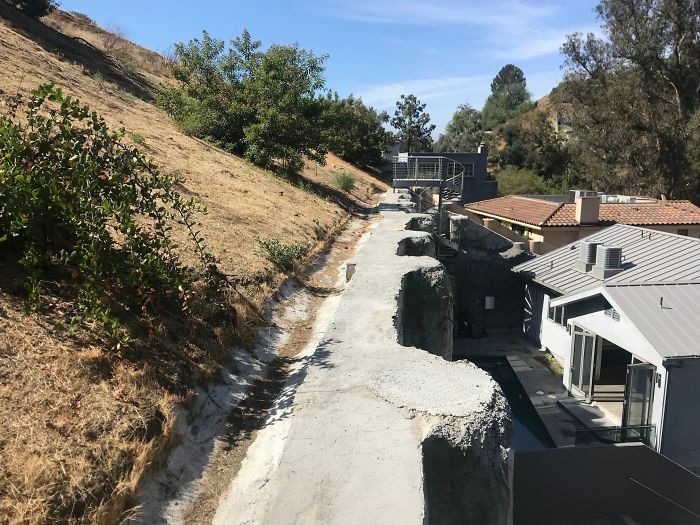 Alpha Structural, Inc. presents itself as the only company in Los Angeles County licensed to engineer and build any type of foundation or hillside repair. 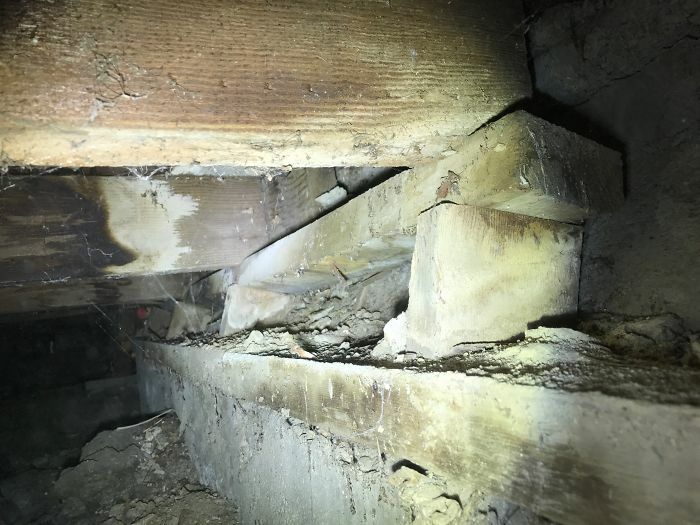 For its 25th birthday, the organization has decided to share some of the craziest structural inspections they’ve done over the years, making many internet users question the sanity of some contractors. 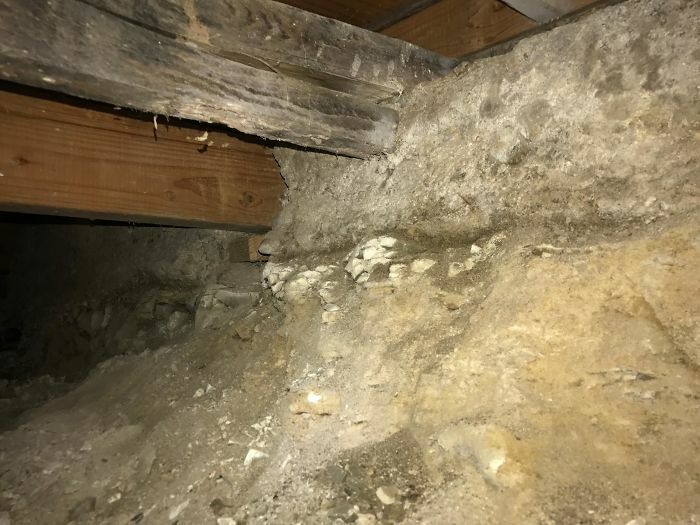 Incompetence aside, their posts also include skulls and other weird finds. You never know what these guys will show you next, and that’s one of the reasons why everyone likes them. 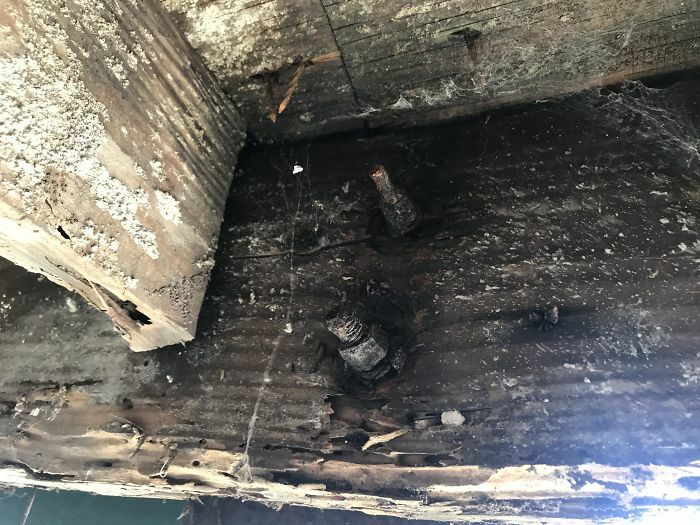 A post that’s barely resting upon a concrete pier. This one really makes me chuckle because it looks like the feds are using a spotlight to catch a felon (Dasani bottle) on the ledge of a skyscraper. 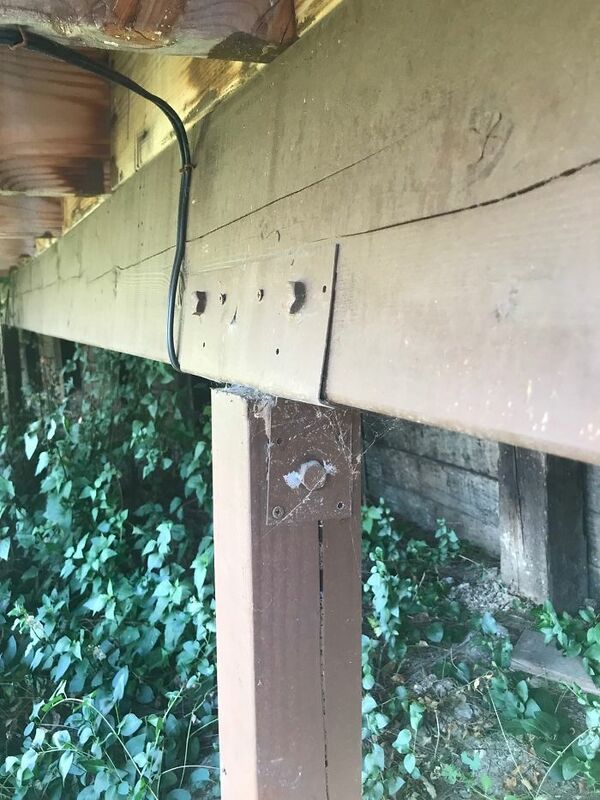 This is the same property with a different post & pier. 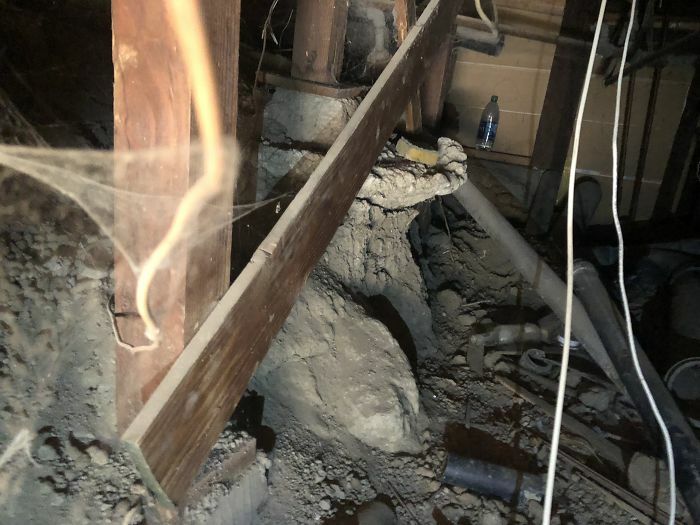 This one is undermined and probably one good shake away from collapsing. 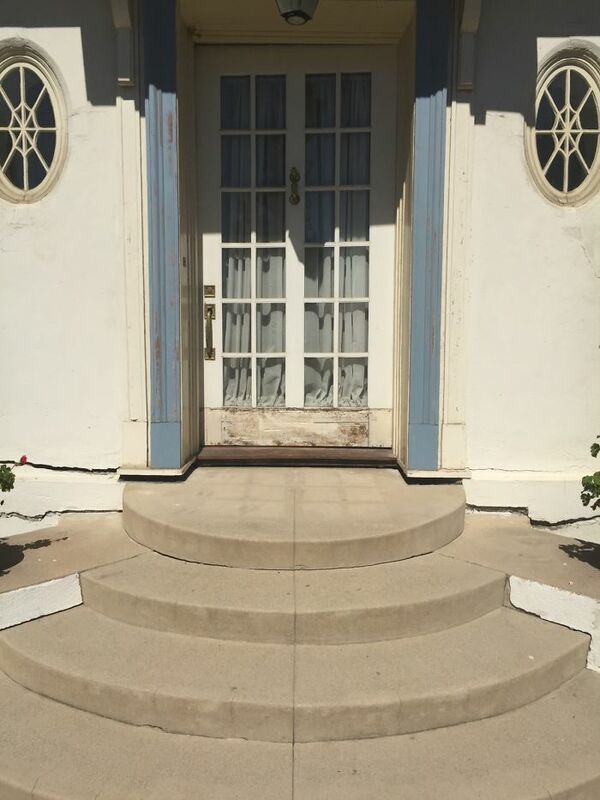 This is a look at an 1885 home in Los Angeles. 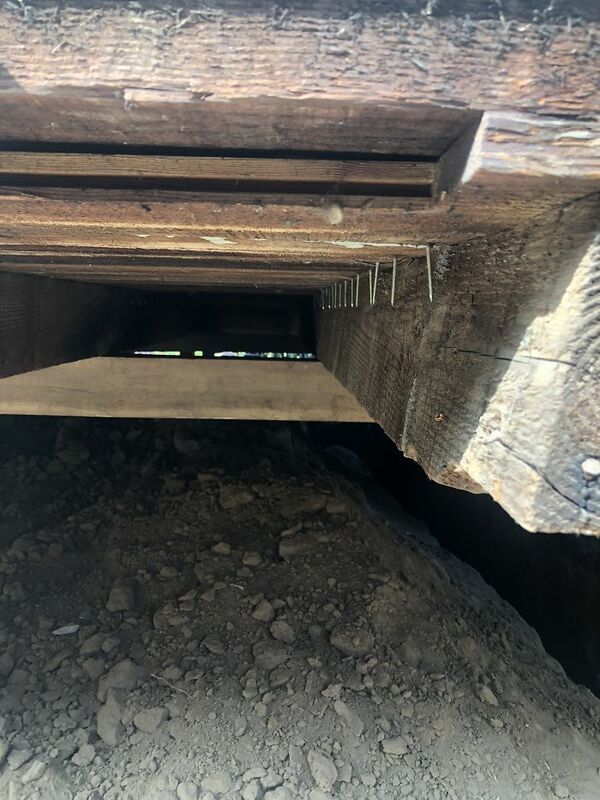 The “posts” are 2x8s with little to no concrete pier to rest on. 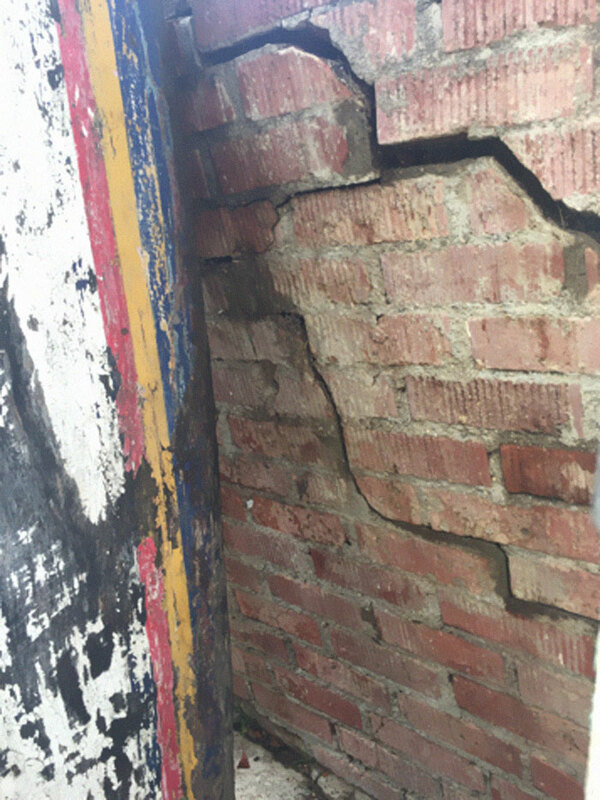 The brick foundation is crumbling and falling apart more and more every year and needs to be entirely replaced. It’s lasted this long, but it wont last for much longer. First of all, I want to start off by saying this is a special ”Halloween” edition simply because of this picture. 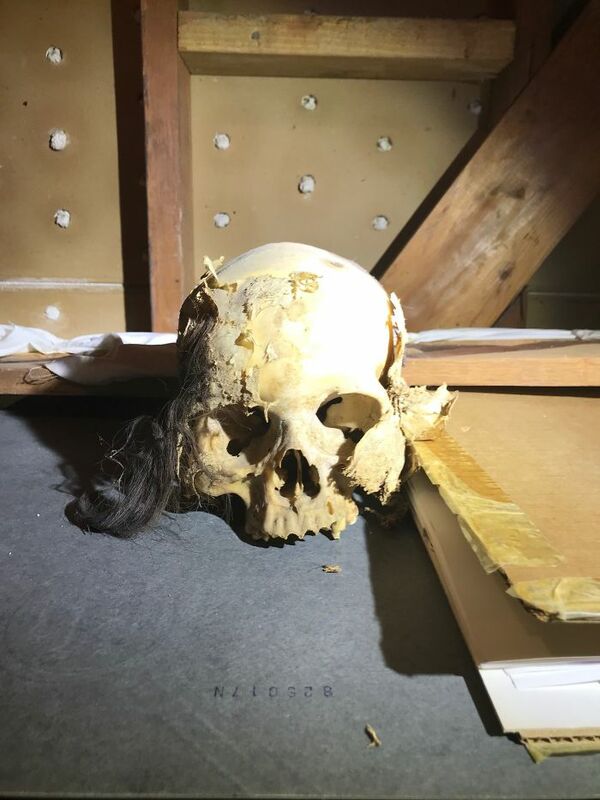 YES, this is a real skull & YES it was called in to the police and YES it was confirmed by a detective coroner. 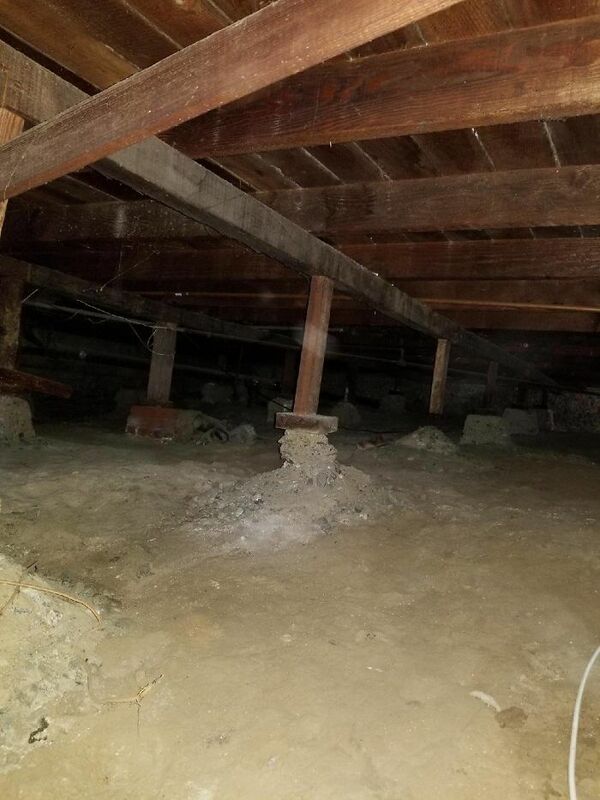 While doing a real estate inspection in the valley, one of our assessors came across the above skull. 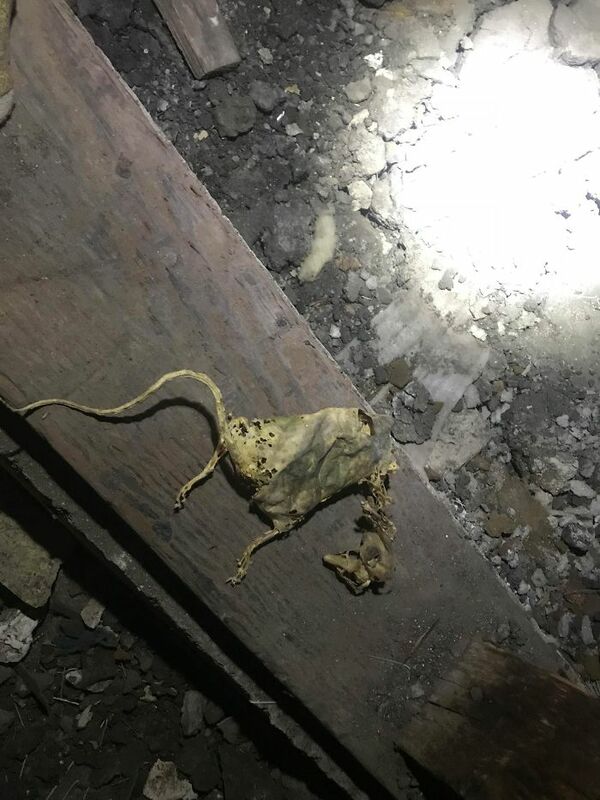 It was said to be found in Peru by the previous owners. Apparently, they brought it back in their luggage when returning from their vacation in Peru. Why they would do this is beyond me. 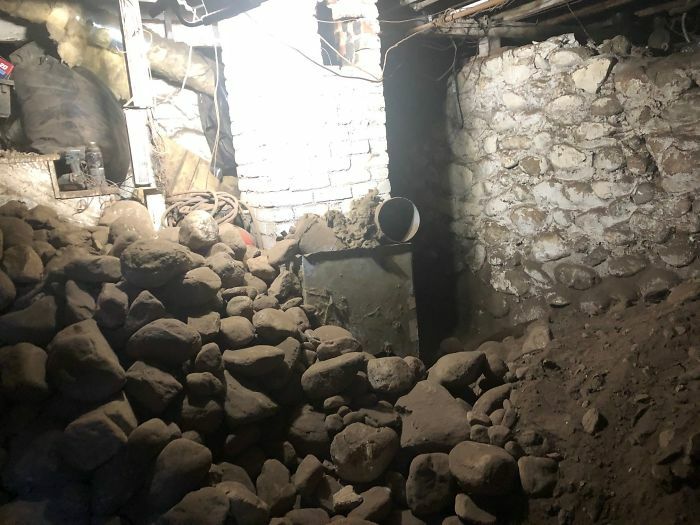 This was later confirmed by the sellers of the property that it was in fact brought back over to the states from Peru. 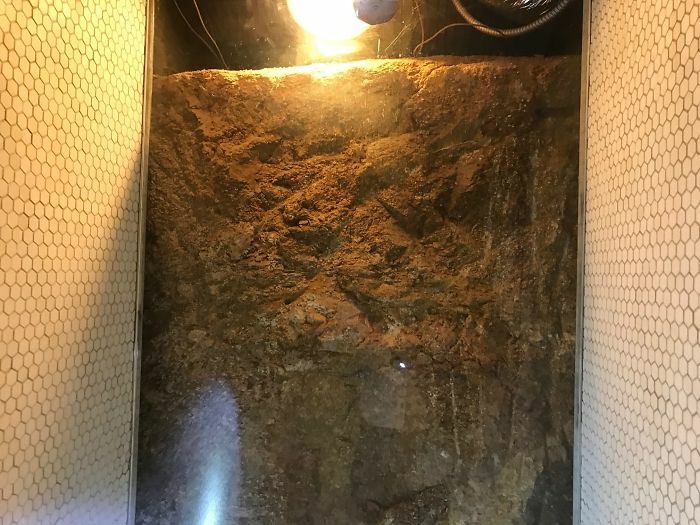 The skull, which was studied by the coroner, was roughly 1,000 years old. 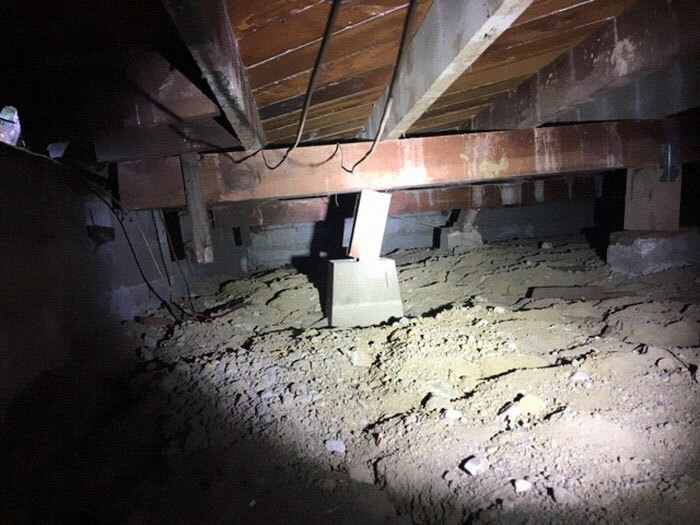 This is by far one of the craziest things we’ve seen doing foundation inspections in Los Angeles. 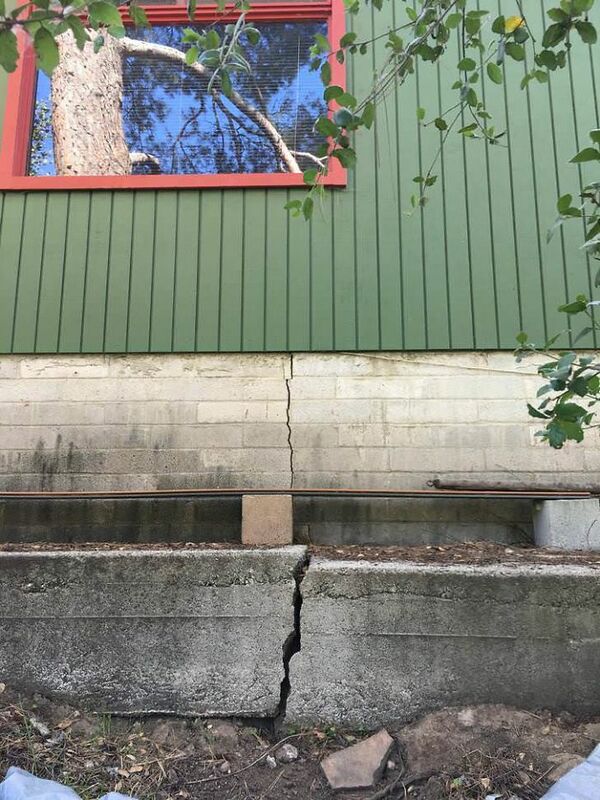 This is a pretty severe crack in the concrete foundation of a hillside home. 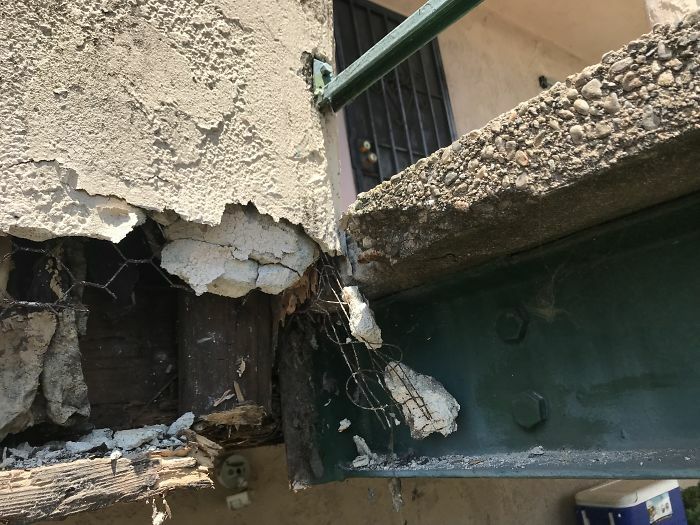 Metal strapping is one solution to this, though it’s never recommended because the problems will persist and show up again in a few years. Replacing this section would be the correct action. 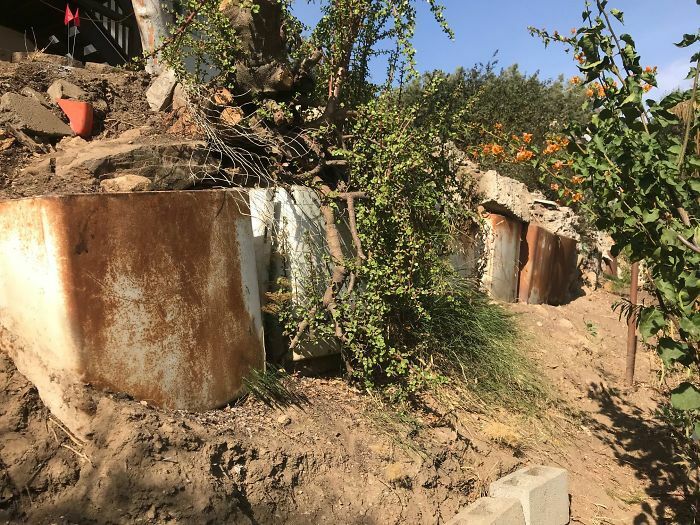 A deteriorating river rock foundation in Pasadena. There’s a bunch of those out there and almost all of them need work! 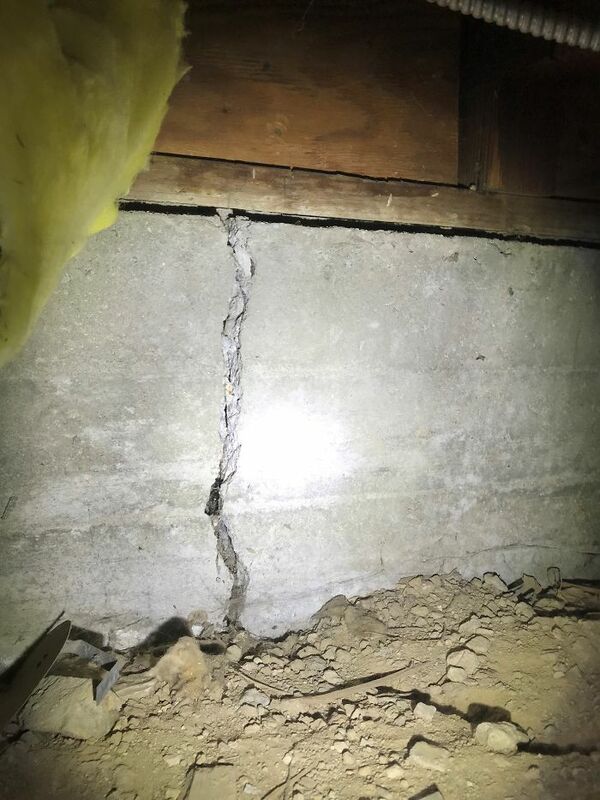 Another large, vertical crack that is displaced. 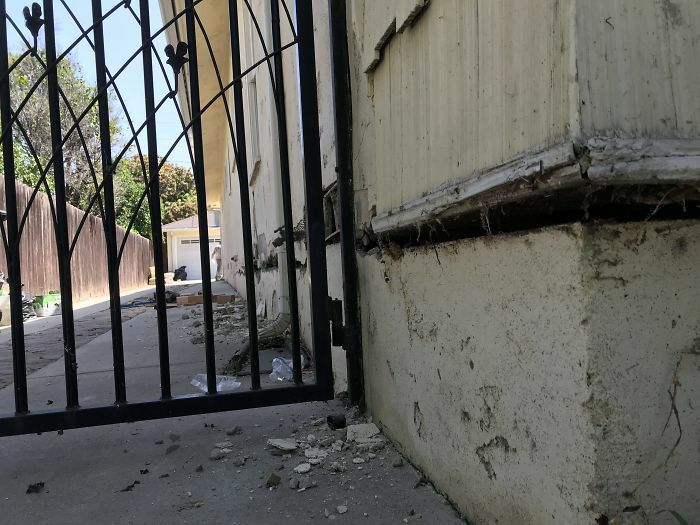 Though it is a newer looking foundation, there was no reinforcement bar and a small earthquake hit the area. Snap. 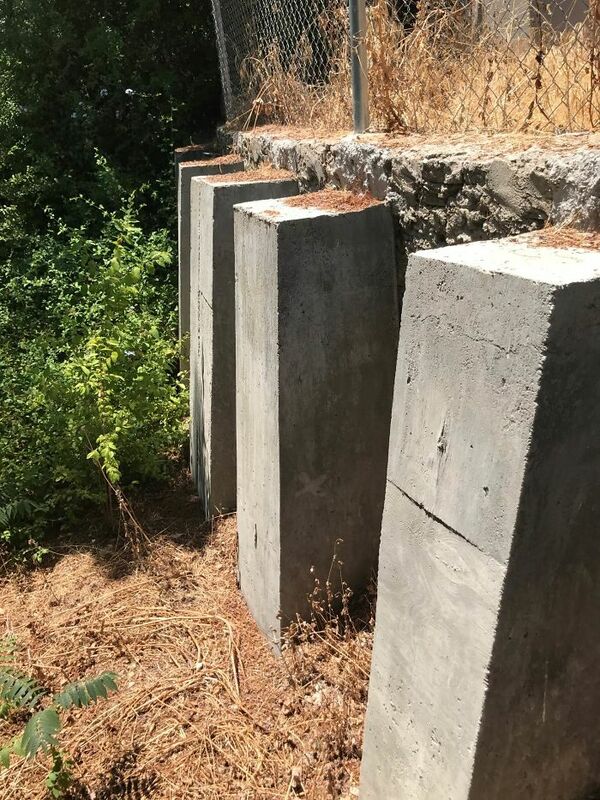 These are just some very odd concrete support pillars. 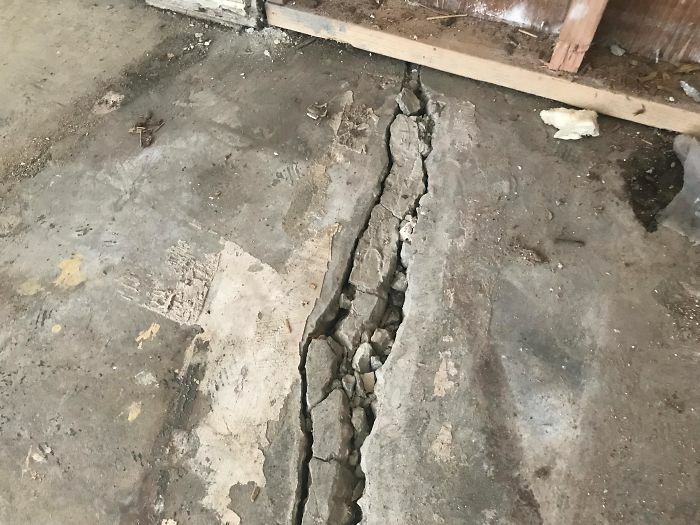 We did this inspection of a house with a “broken slab” in the garage. 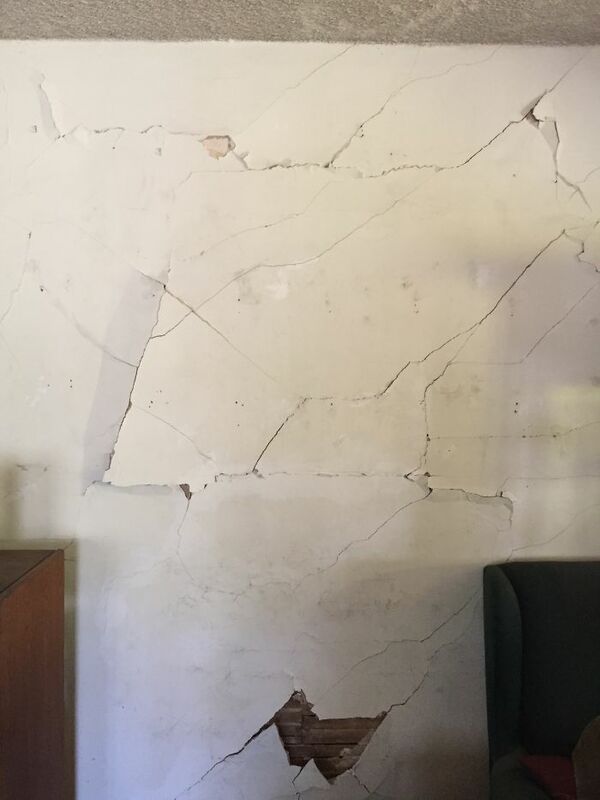 Our assessor arrived thinking it would be a cracked slab or maybe some chipping and settling. 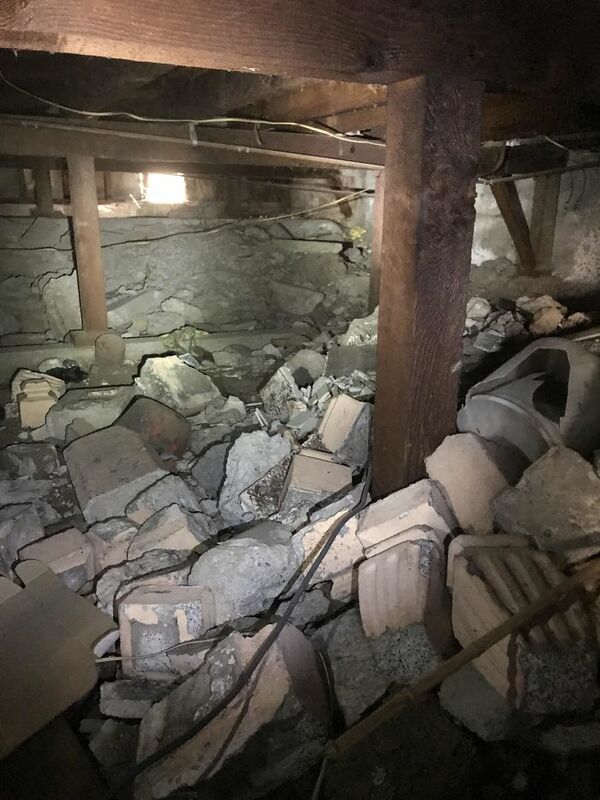 Well…The sub floor completely collapsed and the result was a bit more extensive than we thought. Yikes! 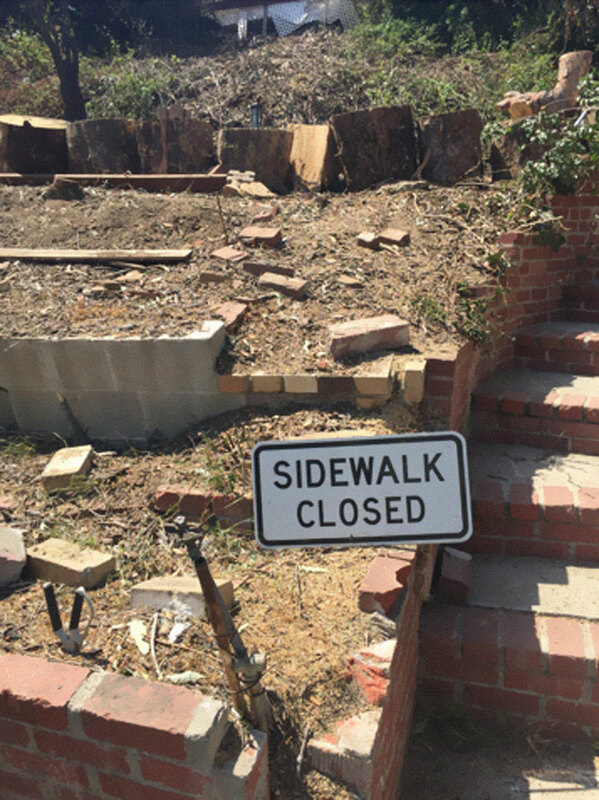 Yeah, that’s gonna need some work. 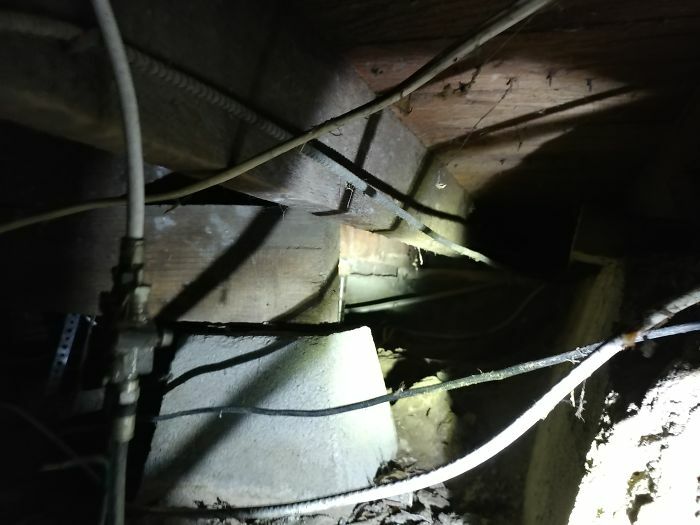 The crawl space access is all sorts of ****** up. 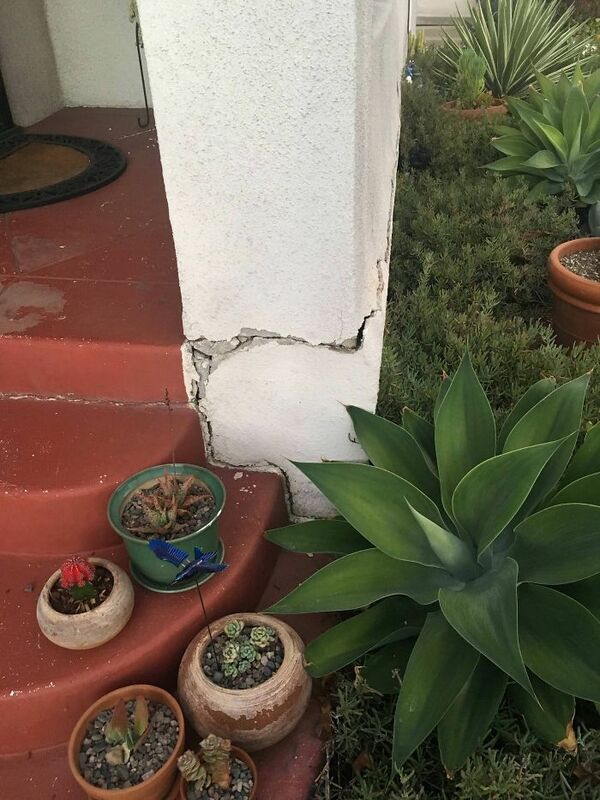 Here’s the real damage. 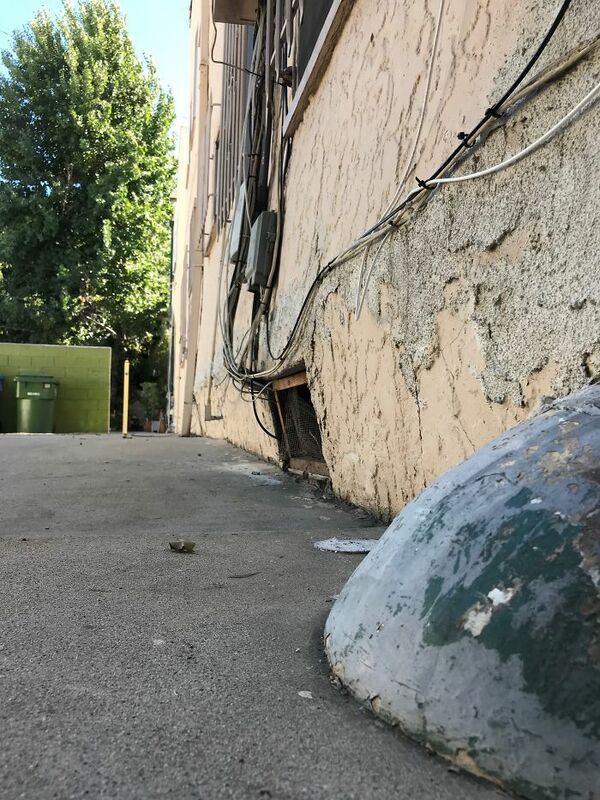 A rotating concrete foundation with a complete absence of re-bar (reinforcement steel). 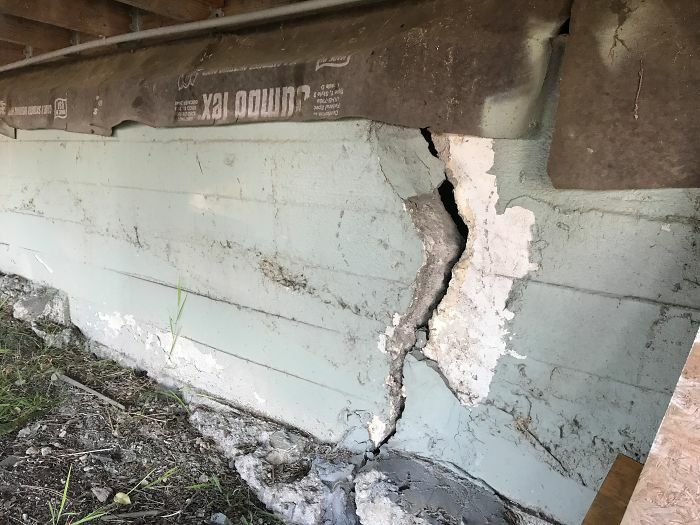 Not only is the concrete rotating; it’s sinking, cracked on both ends and could easily cause the house to fall at any time. 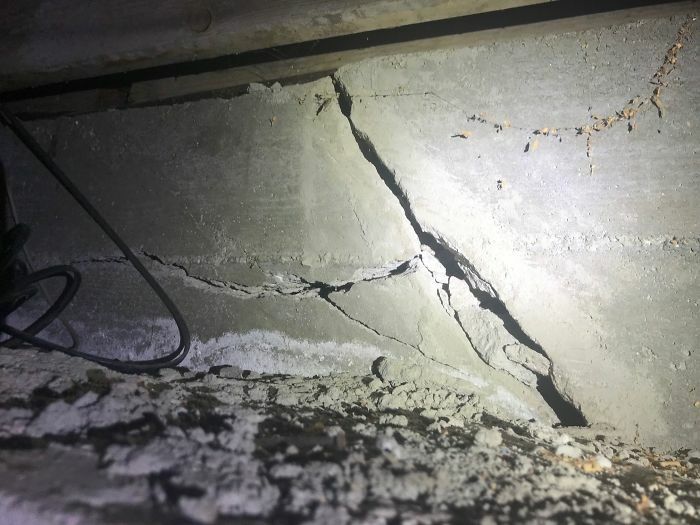 It’s cracked on both ends. 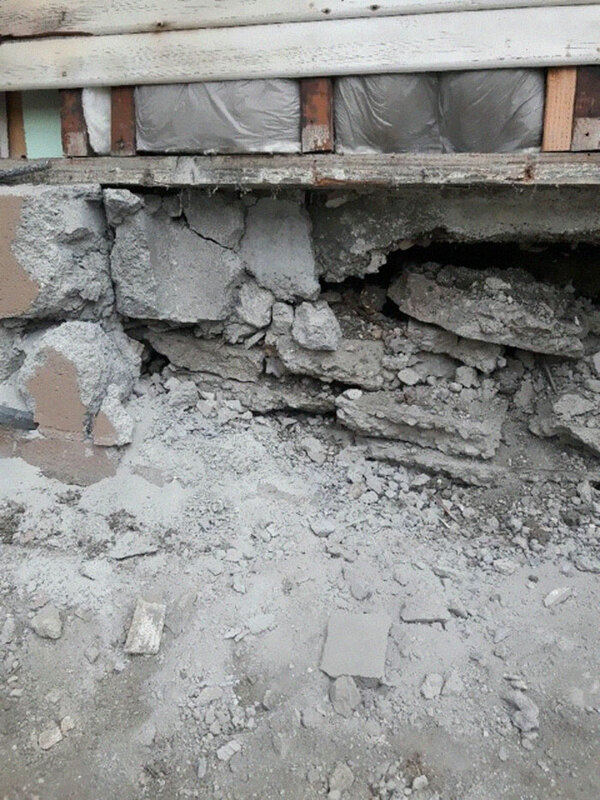 The mud sill was doubled as a part of a lifting process. It basically did nothing but cause more pressure down. t may look somewhat stable..but touching it with a hammer would turn it to dust. 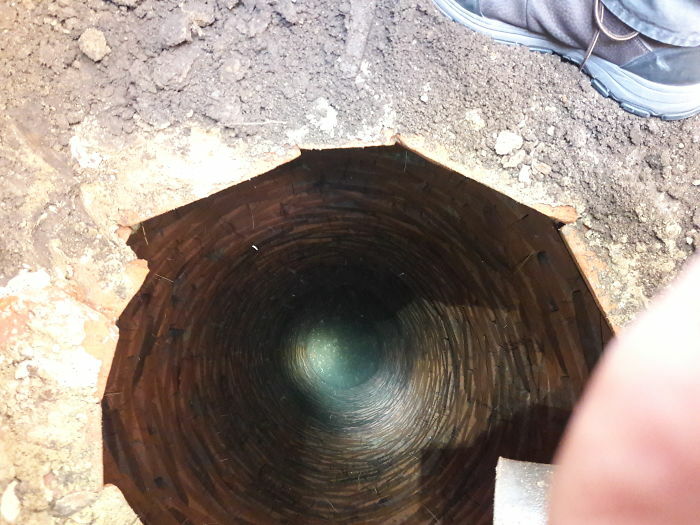 Also, the pipe on the ground broke in half when we moved it. 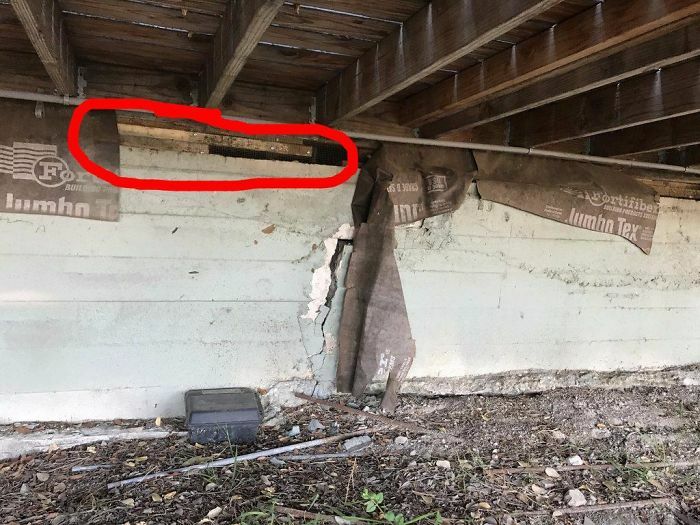 Not sure if you can see this one that well but the piece of wood on the left is horizontal. 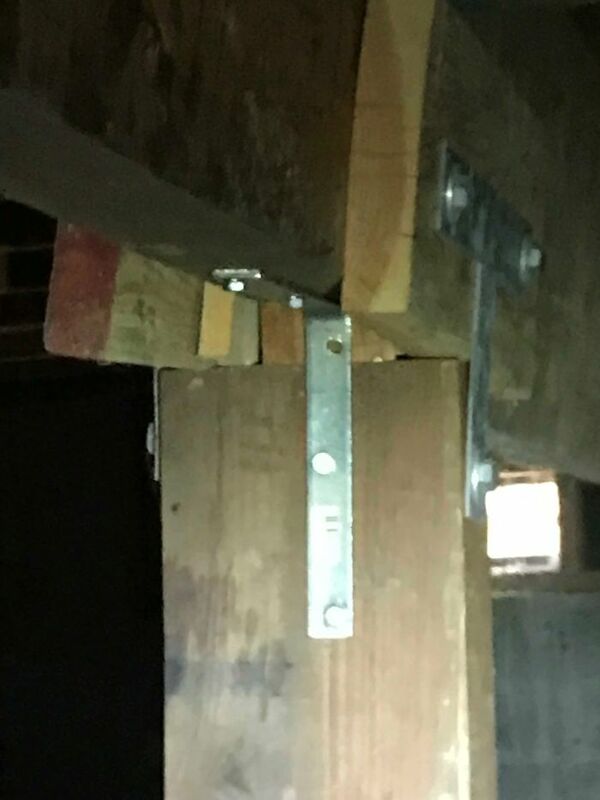 It’s suppose to be upright and attached to that support beam. 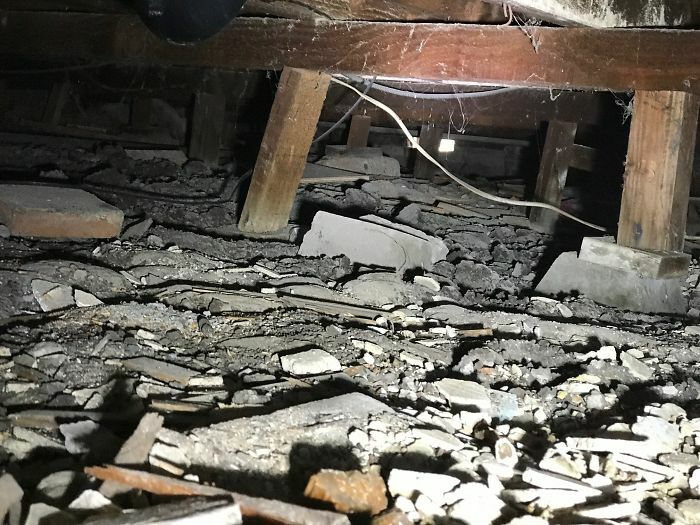 The floor was sinking a good foot. 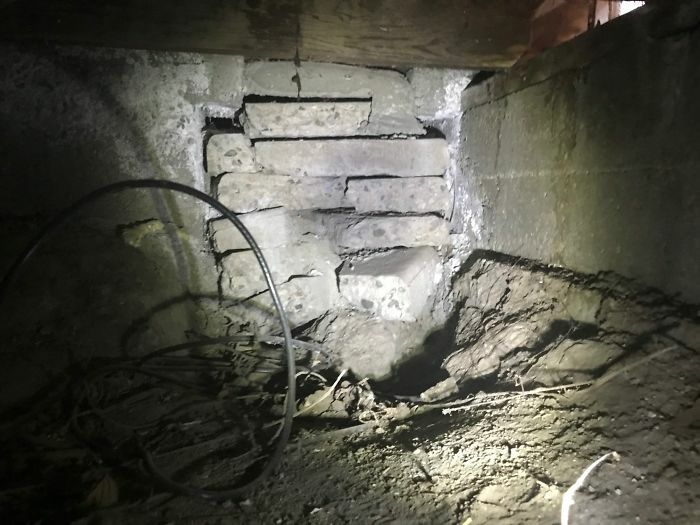 Not sure if I posted this before but this is an old drain well. 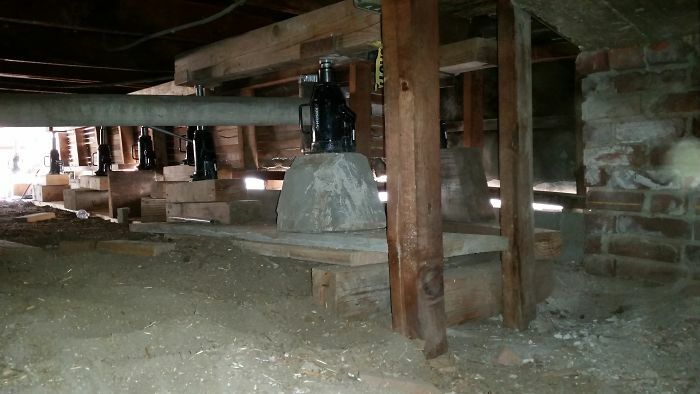 An archaic form of “draining” or storing water. 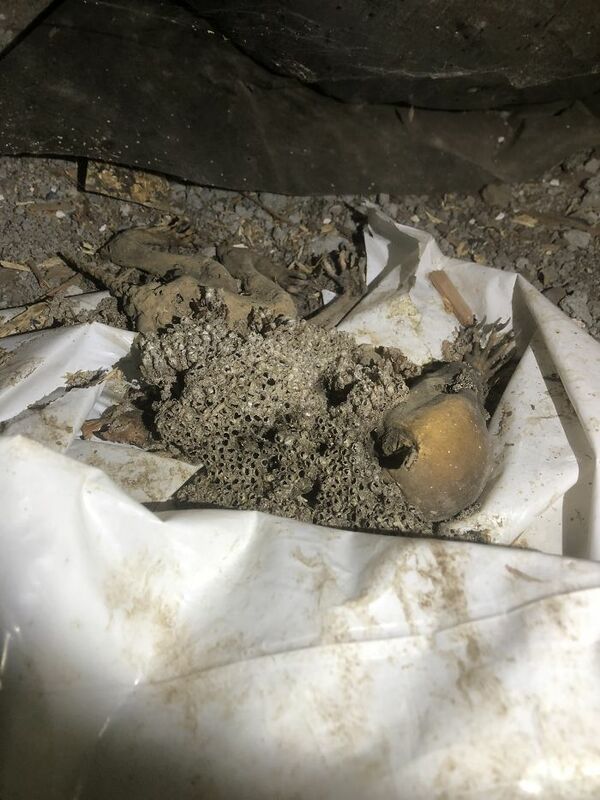 This was found under a huge concrete footing. 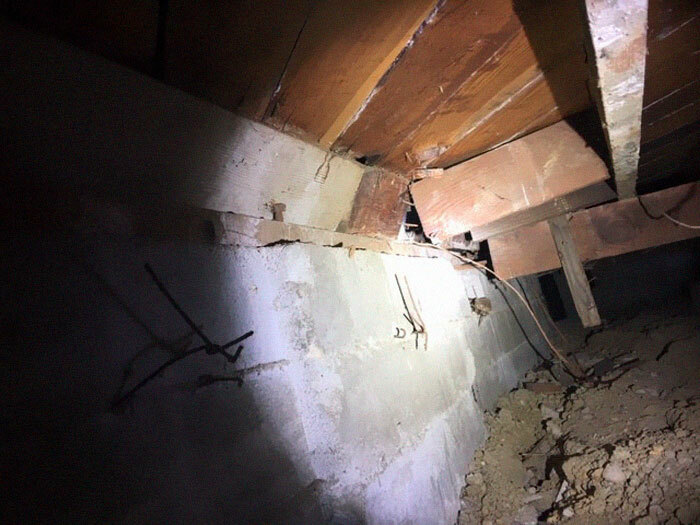 Luckily, we brought an exorcist to scare whatever demon was residing down below. So from here we see there is a slope starting from the right and going 15 feet to left. 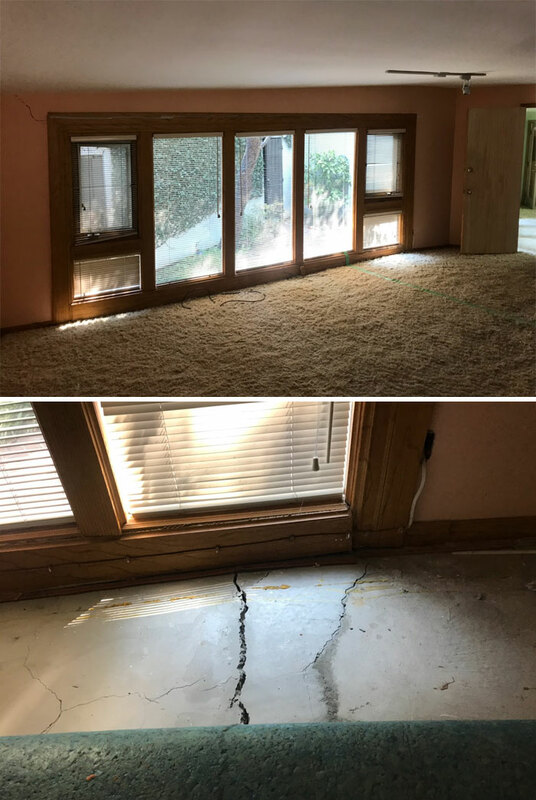 After peeling back the carpet, we discovered a massive slab crack. To the right of the crack we see another crack that’s been patched. 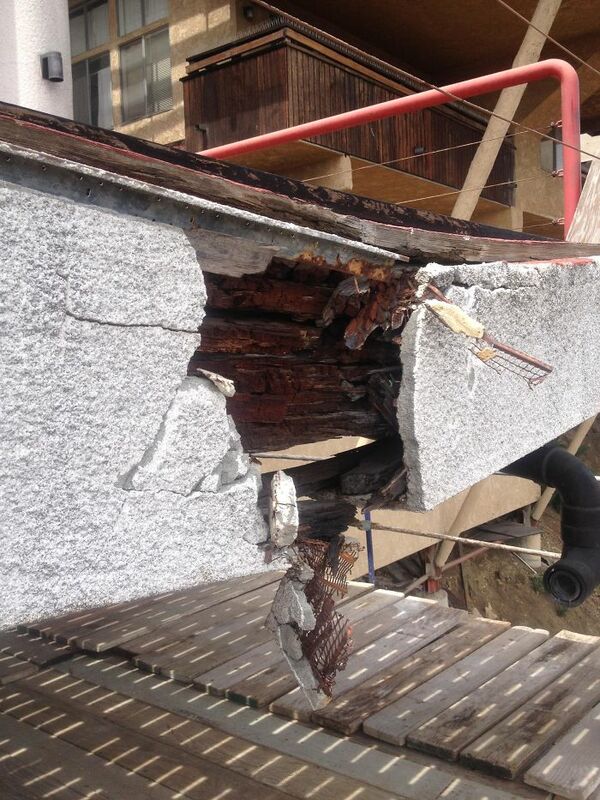 The left side of the house was completely sinking a total of 18 inches from the point of the crack. 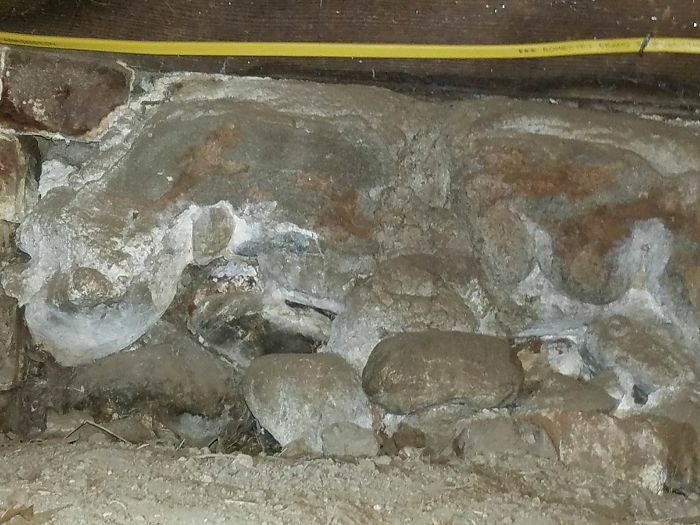 One of the worst slab conditions we’ve seen so far in LA. 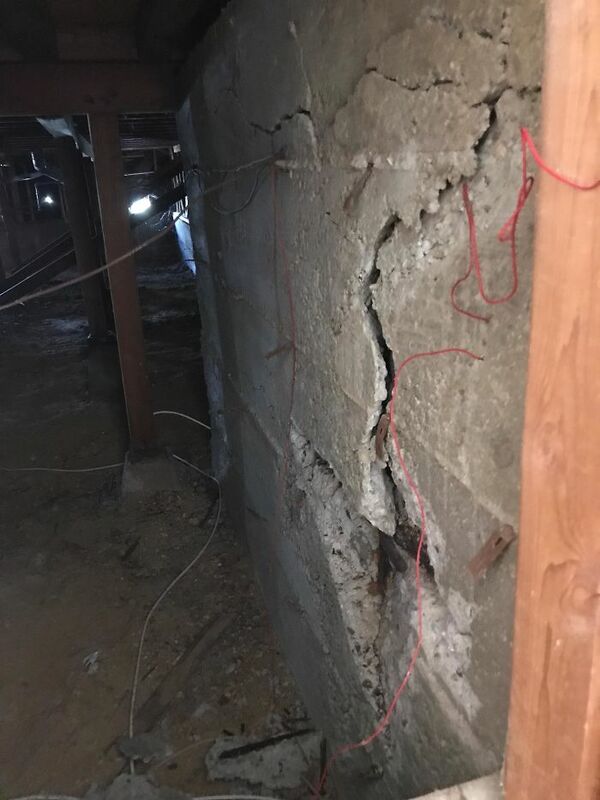 The result of slab jacking 6 inches. 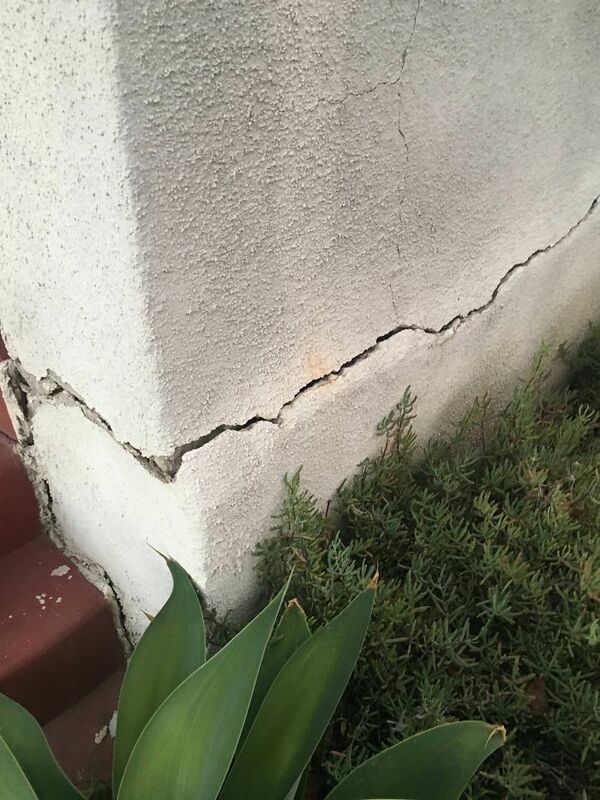 That crack in between the tiered stem wall is dropping about 2 inches. The cripple wall to the left can’t breath! 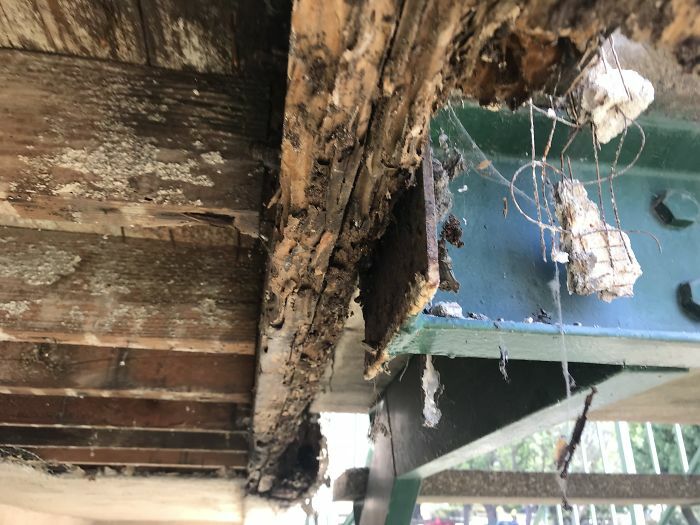 At this point it’s not worth repairing. 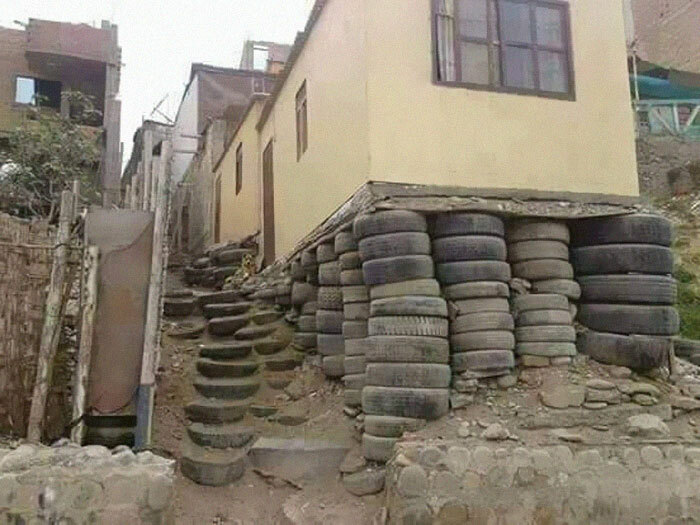 Just replace the foundation. 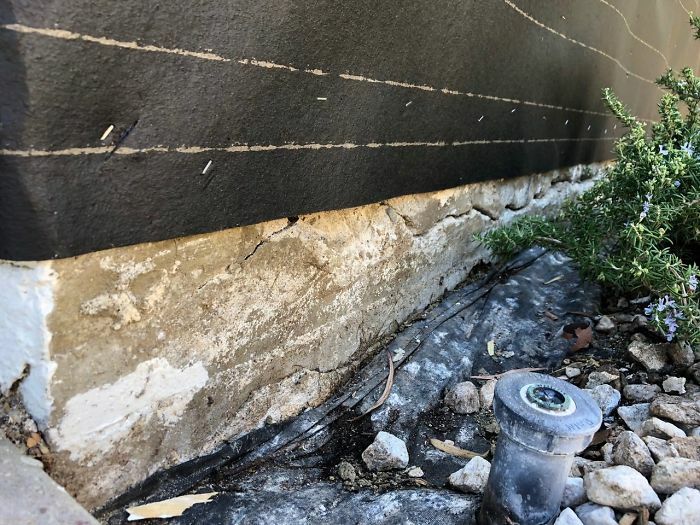 Being serious, this is a bad slope issues, mainly due to poor drainage and downspouts pouring right out near the base of the foundation. 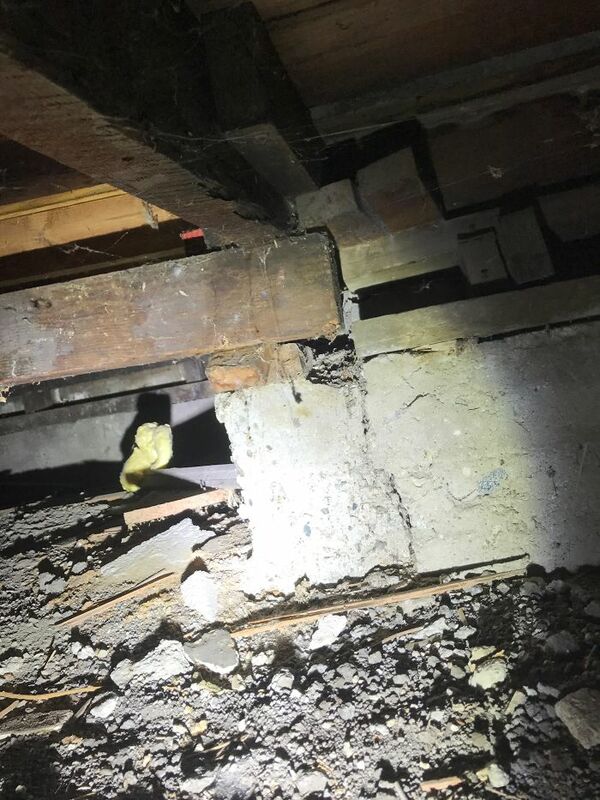 Caused a lot of wood rot and joists to start bowing. 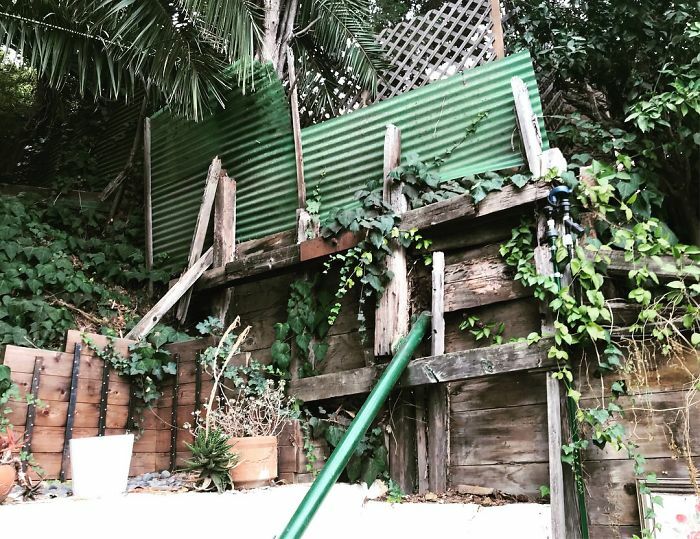 Let’s play a game of Jenga in the back yard. This is a ridiculous spalling issue. 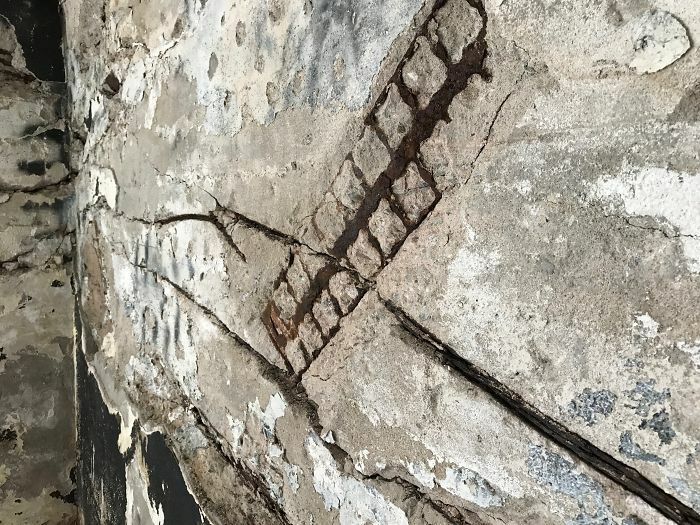 It’s as if they threw in small pieces of re-bar while the concrete was hardening. 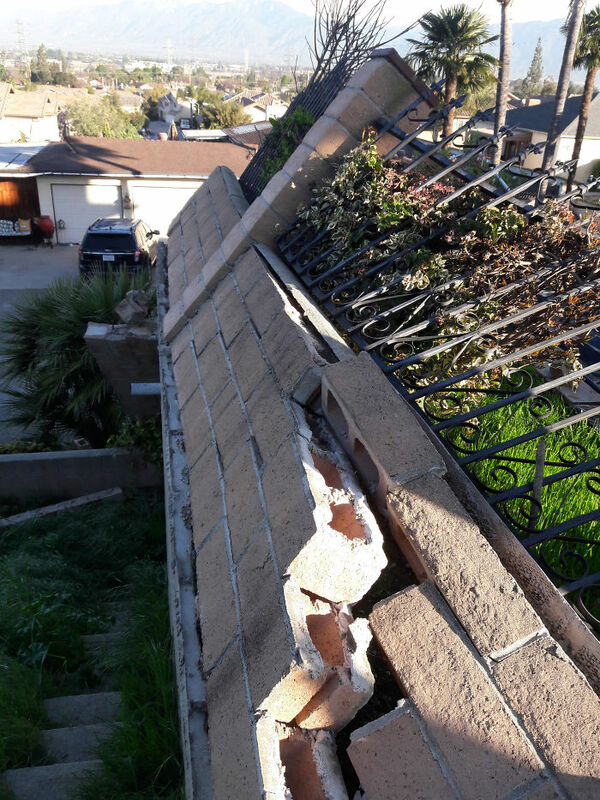 Seems as if it did more damage than not. 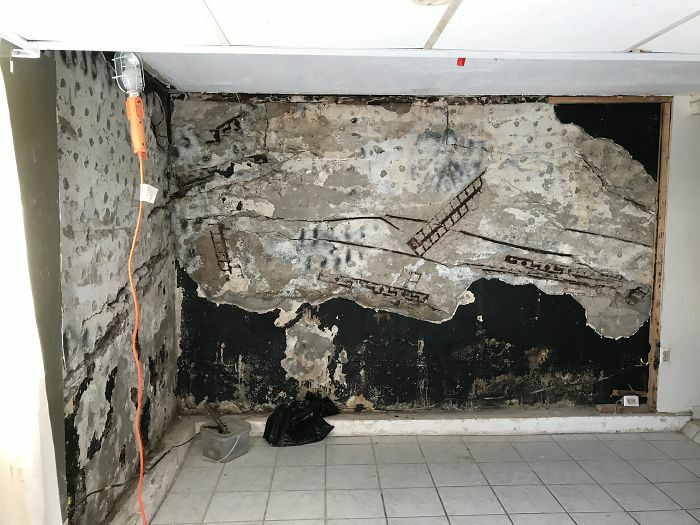 Those walls are coming out for sure. 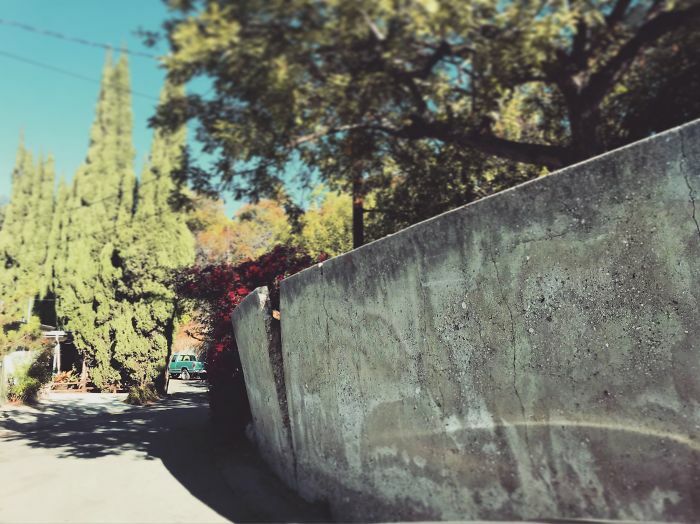 It’s safe to say this is the most interesting wall we’ve ever seen. Of course they were backwards. Had they been front facing, I believe it would have been a bit more obvious they were washing machines. 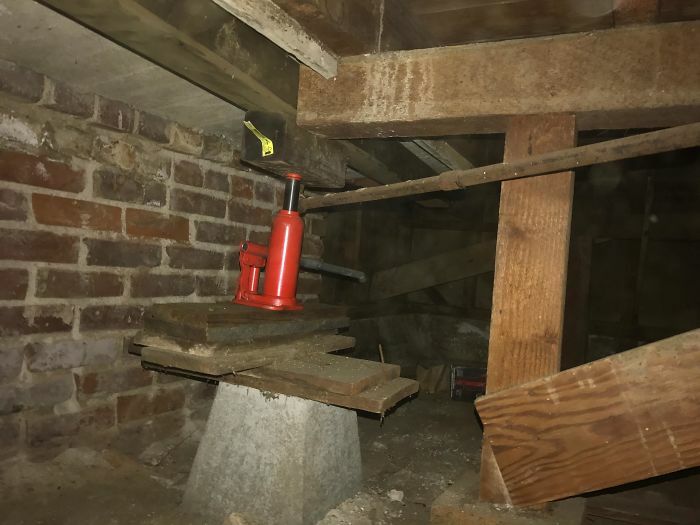 Well, it does the job but it’s not strapped and it could cause future damage. This speaks for itself. If you’re wondering about the filter, I lost the original. All I have is our Instagram photo. 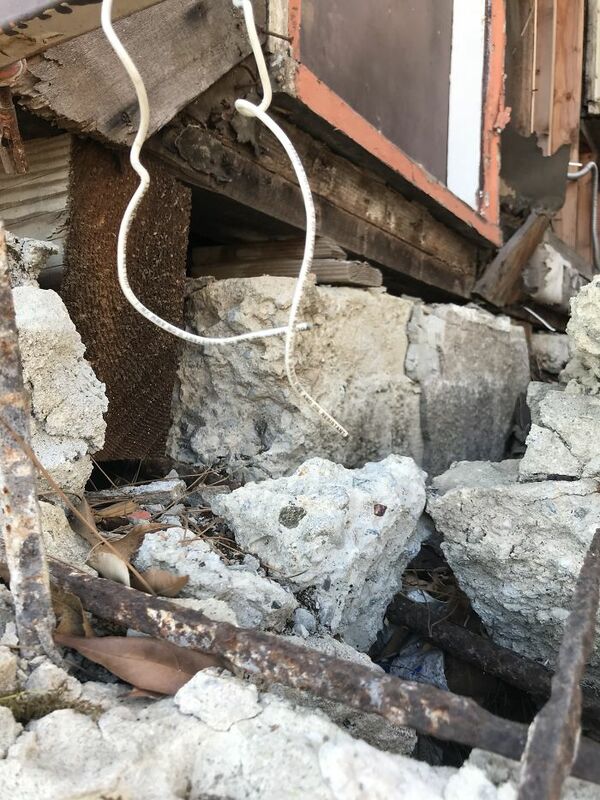 There’s no fixing this. Replacement is imminent! I guess you could say it was…pier pressure. 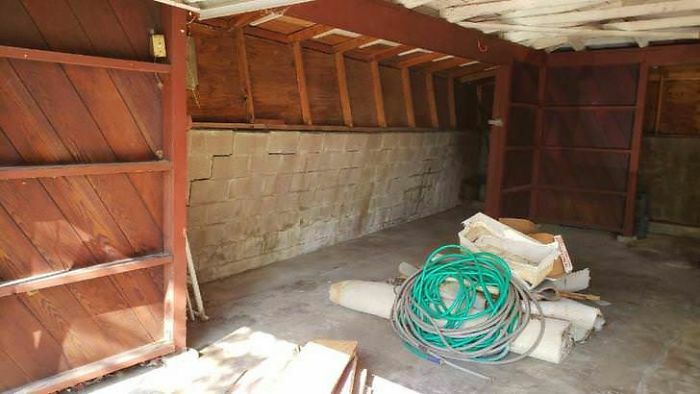 A pier made with brick & mortar…No Bueno! 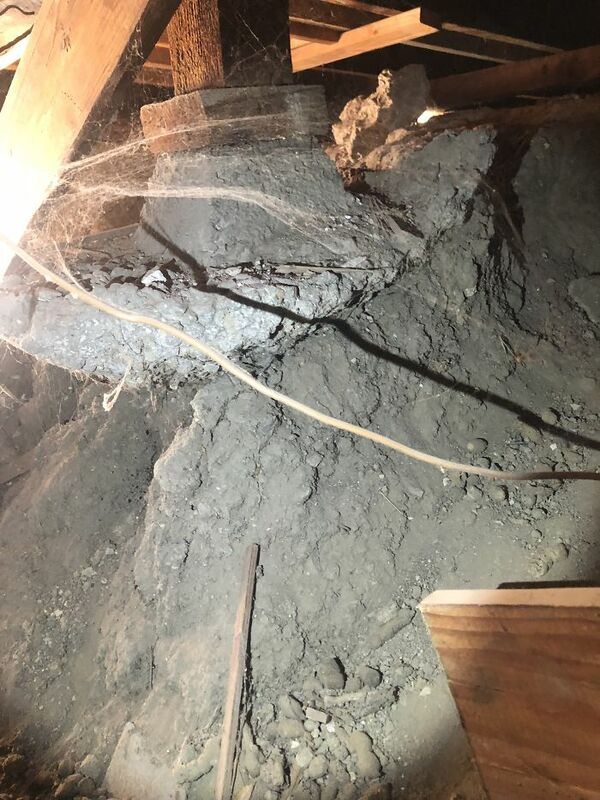 Yes, that might cause a few issues. 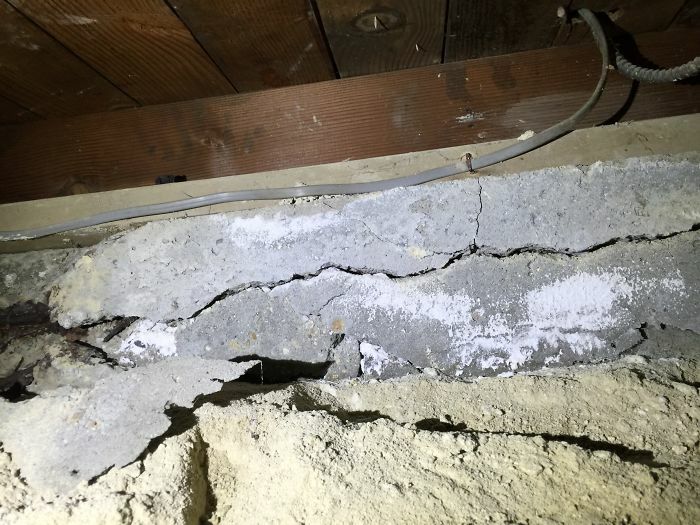 If you open up a wall and the concrete crumbles out like this…you might have some foundation issues. An obvious issue. 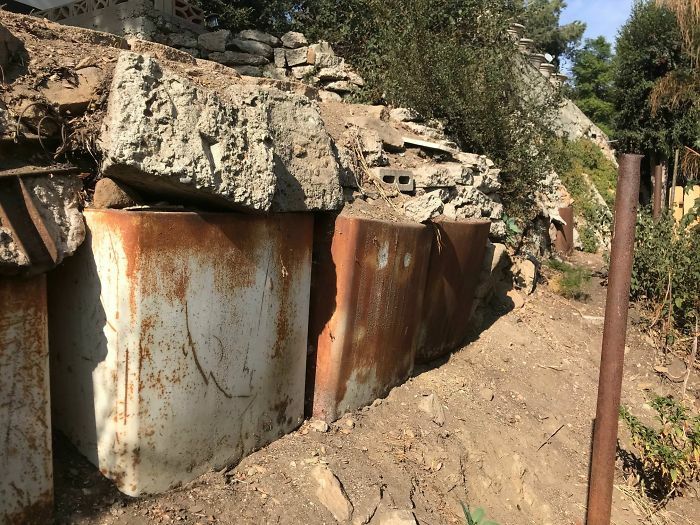 The foundation and existing wall failing and sliding down the hillside. 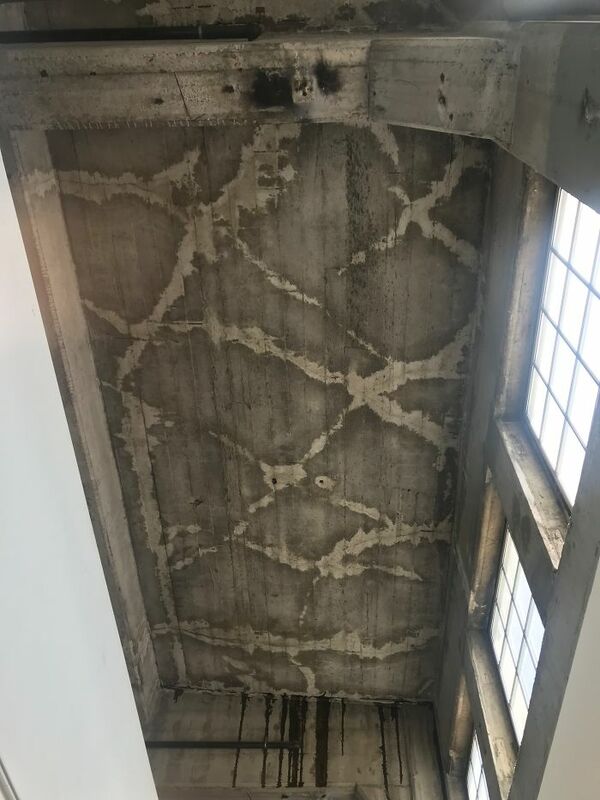 This may look like a cool, industrial ceiling pattern in a DTLA villa, but it’s actually water intrusion coming through the cracks above. 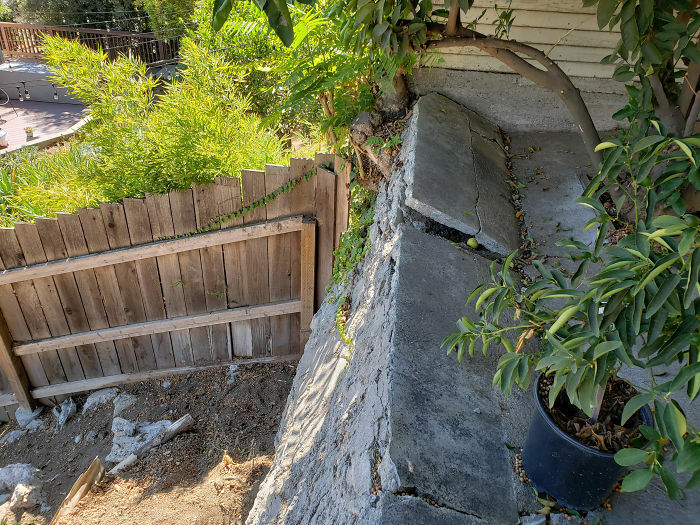 They might want to add a “Do not park next to this obviously failing retaining wall because it might fall on your car in the night and we’re not paying for it” sign. 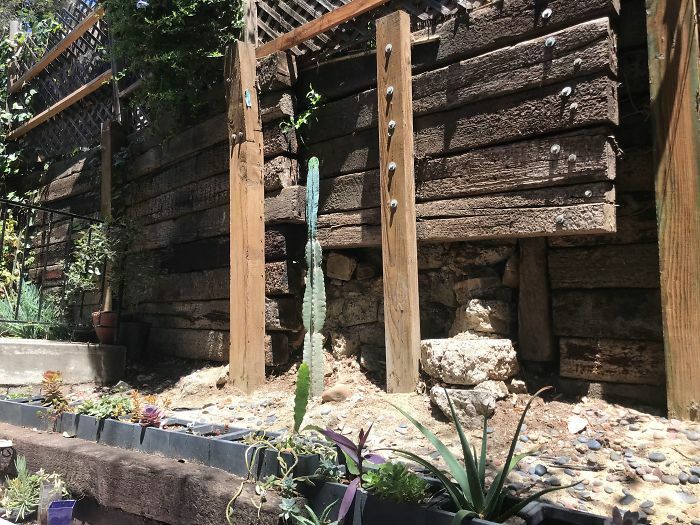 A railroad-tie retaining wall that was simply not holding up. 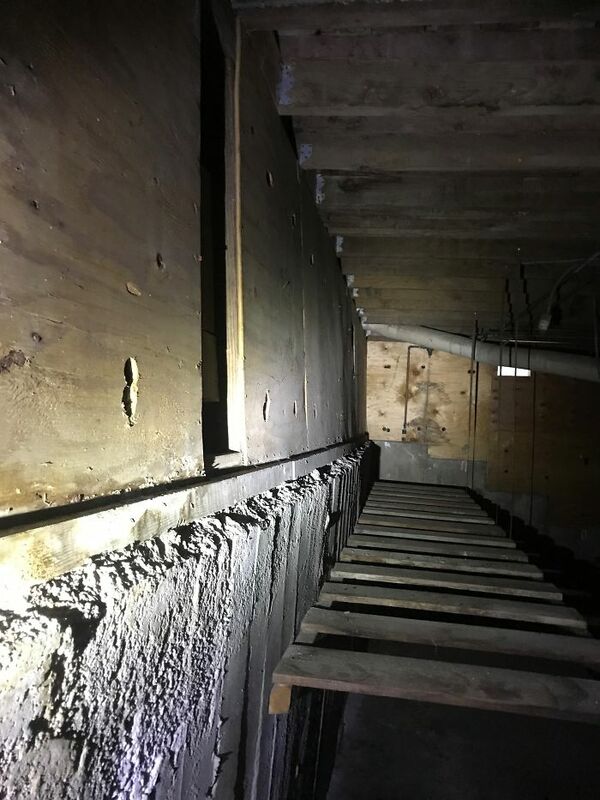 Efforts were made to “retrofit” the wall but it was only months, if not weeks from failing. 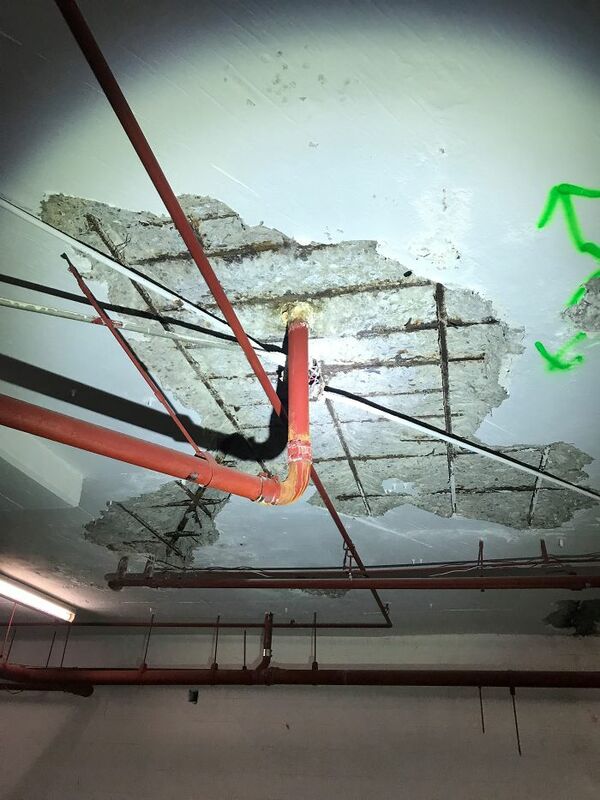 Industrial concrete building with some bad water intrusion. 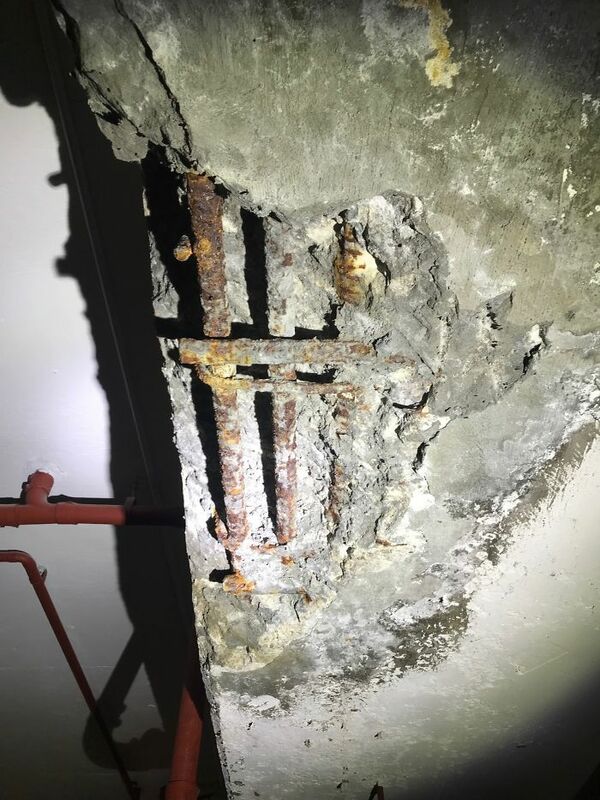 Caused the steel inside the concrete to rust and break off. 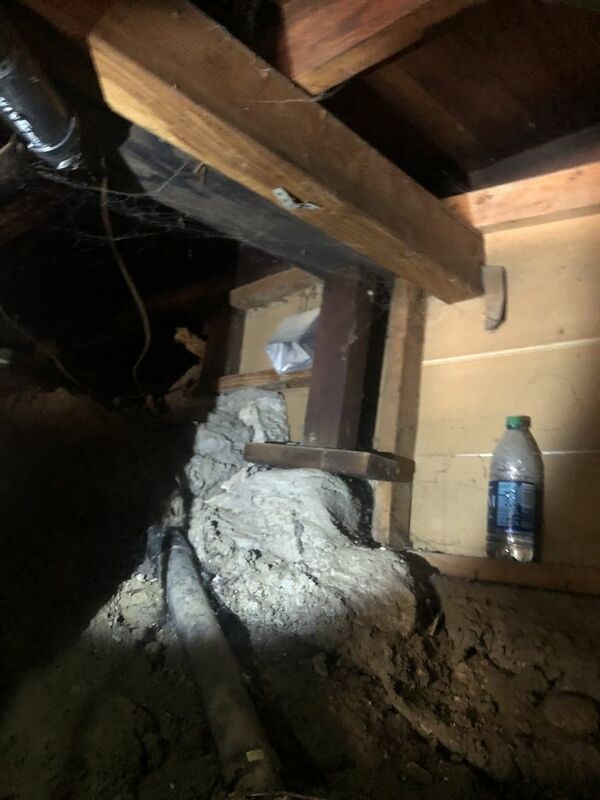 A spider made this crack it’s home and now we can’t do the work. We don’t want to tear a spider family apart like that. This is my favorite of today’s post. 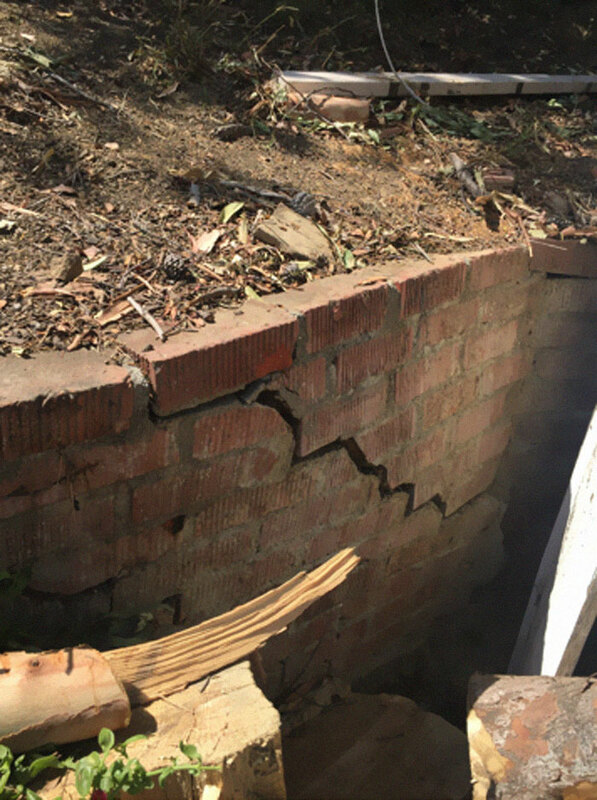 This is a brick foundation that completely toppled over in the night. 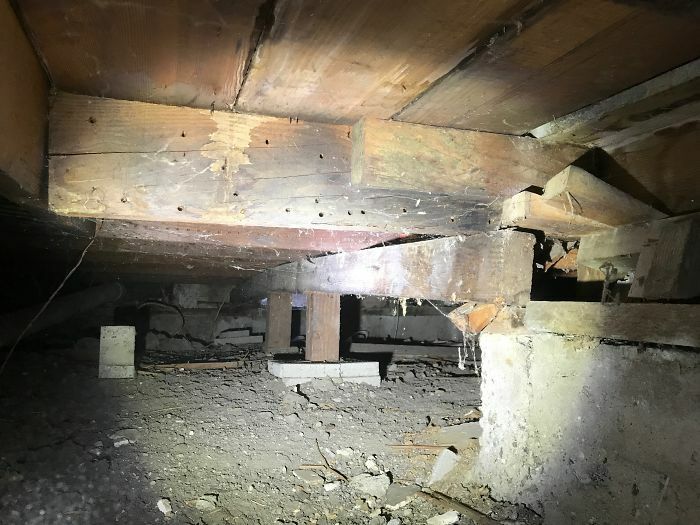 We were called out to do emergency shoring (Support lumber) to keep the house from collapsing down. 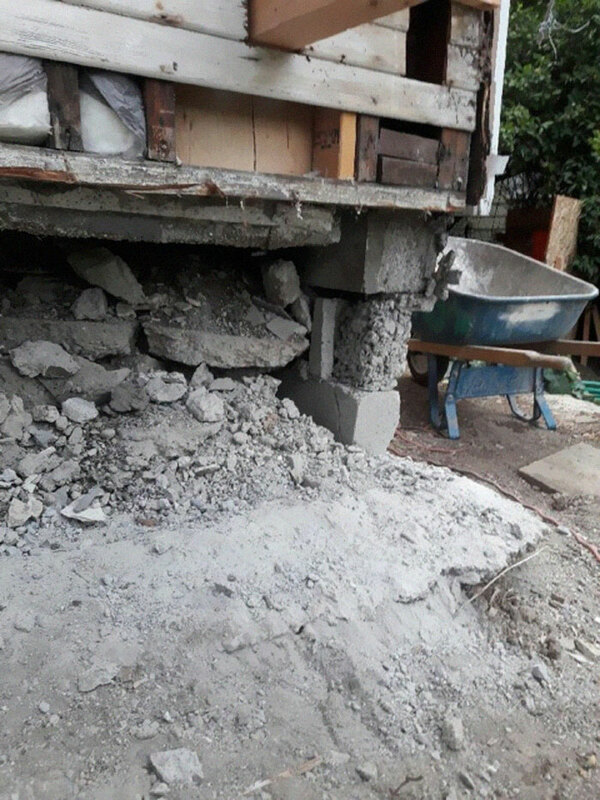 We’re adding brand new concrete foundations to both side’s of the home. CLOSE CALL! And there it is. 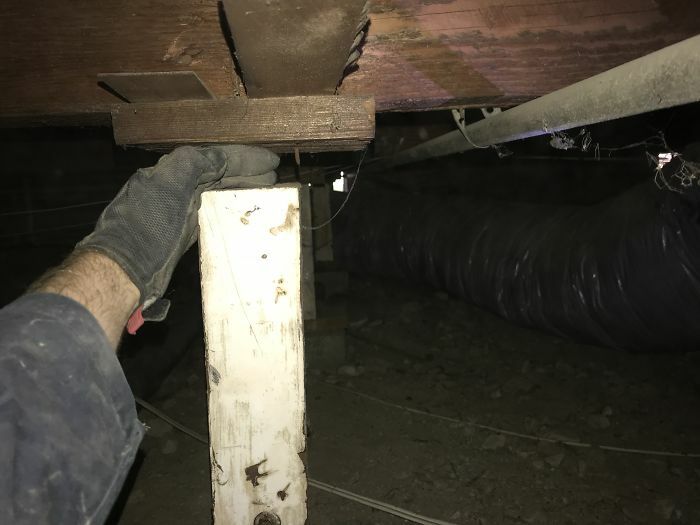 Looks safe right? 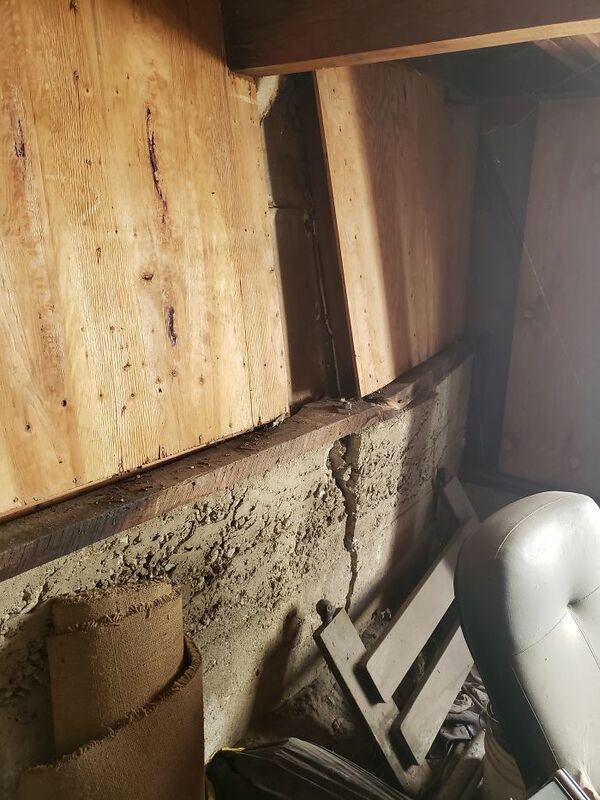 This was the end product of a lot of water intrusion. 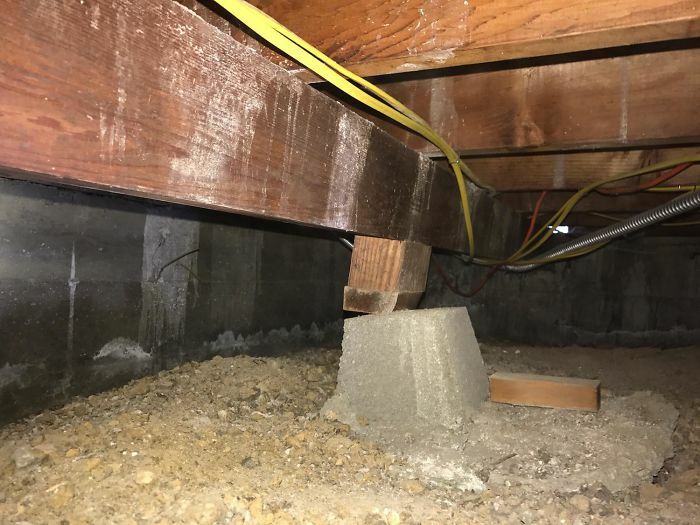 A poor excuse for a solid foundation. 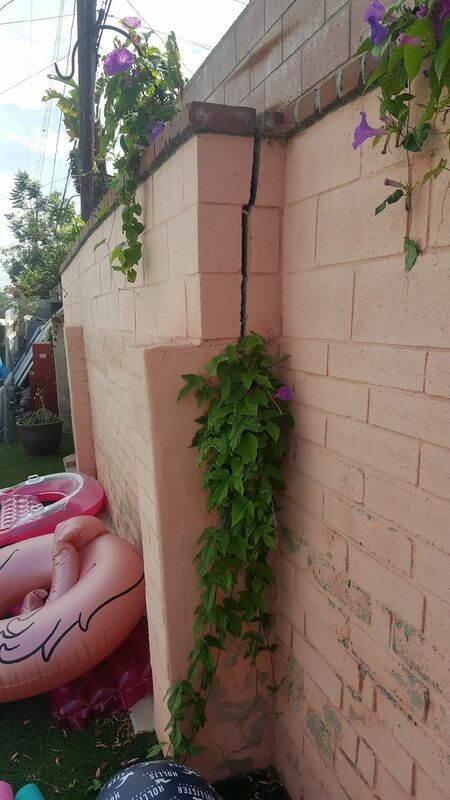 I think you should be concerned when you can fit your arm in the crack….. Don’t make jokes, I’m serious. 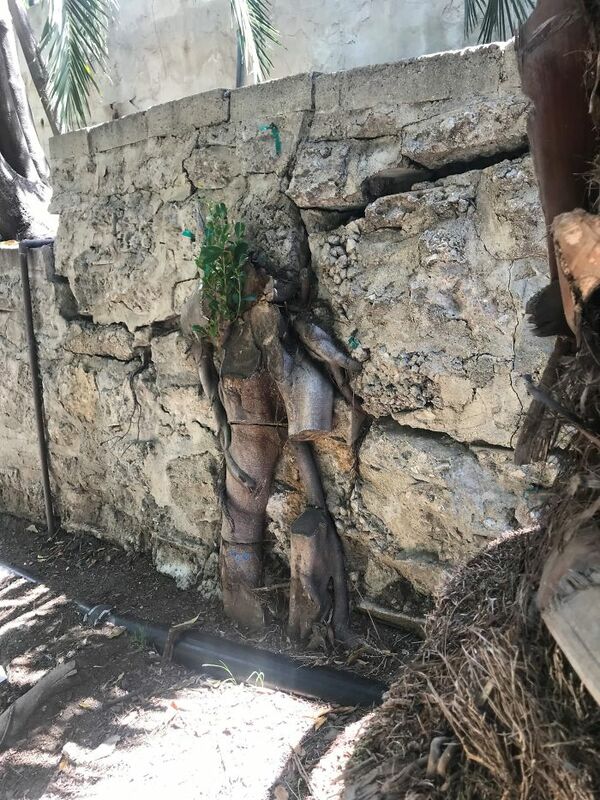 This is more of an art piece that was built into the foundation. 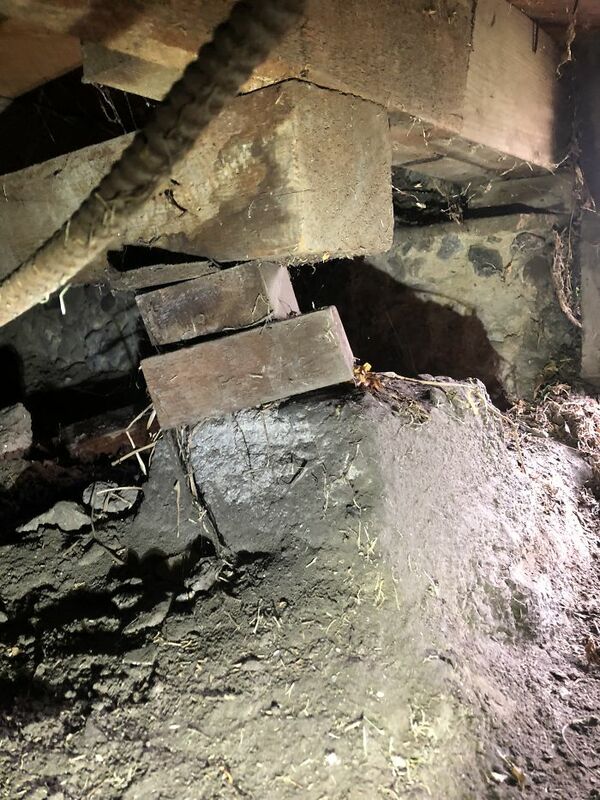 There’s rock, a cinder block, 2×4’s and a metal plate, all tied into the foundation. Beautiful, elegant, illegal. 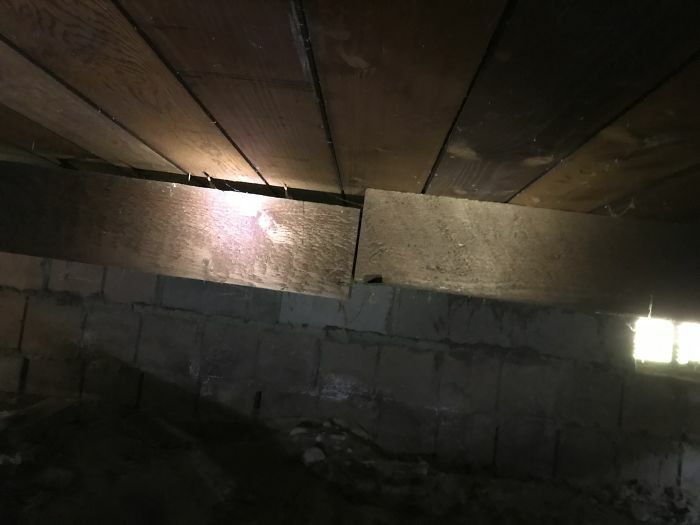 This is a beam. 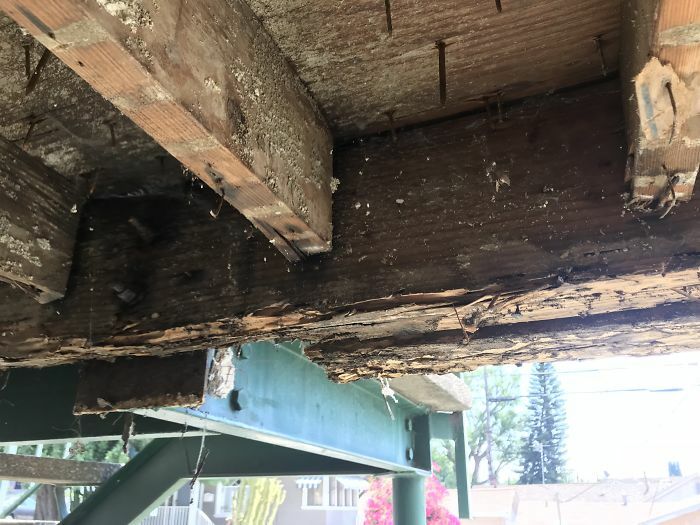 A DIY glulam beam. 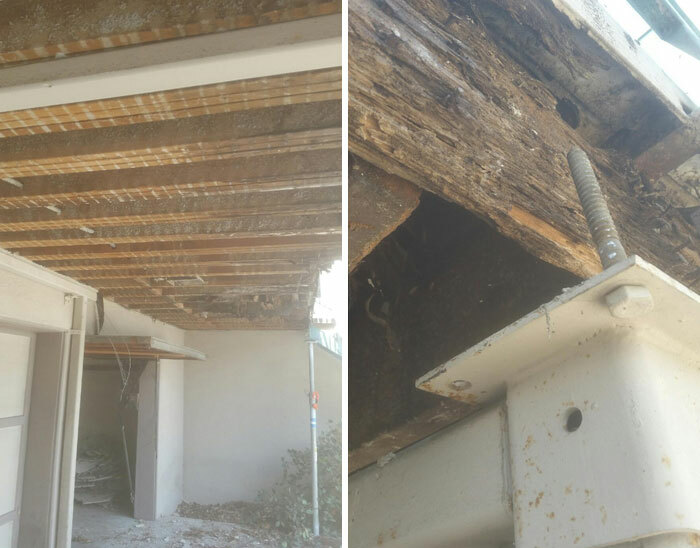 A glulam beam is laminated peace of wood made up of other layers that are glued together. 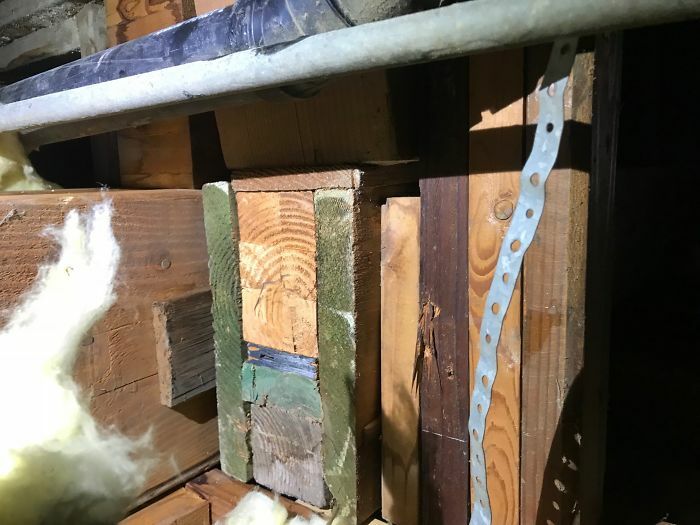 There’s 8 different pieces of lumber all glued together here. 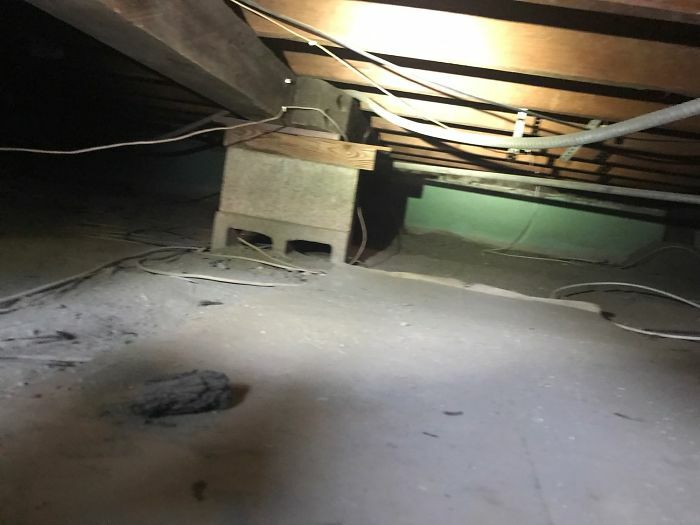 Not very stable and definitely not safe. This is actually the door leading to Narnia. 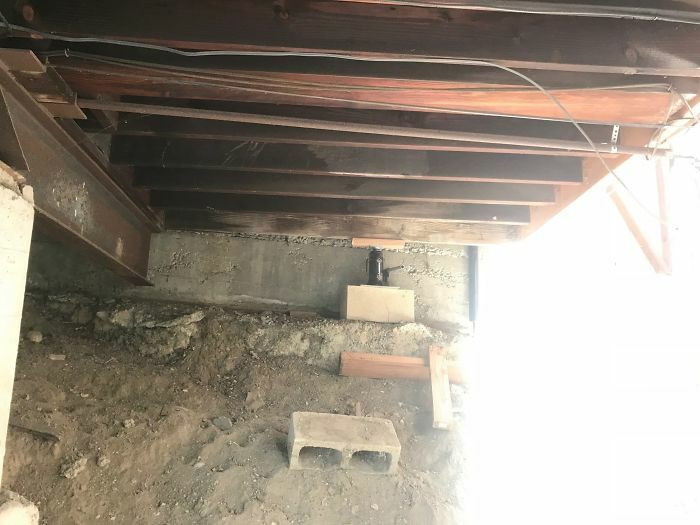 It just so happens that it’s under a house in Pasadena, CA. 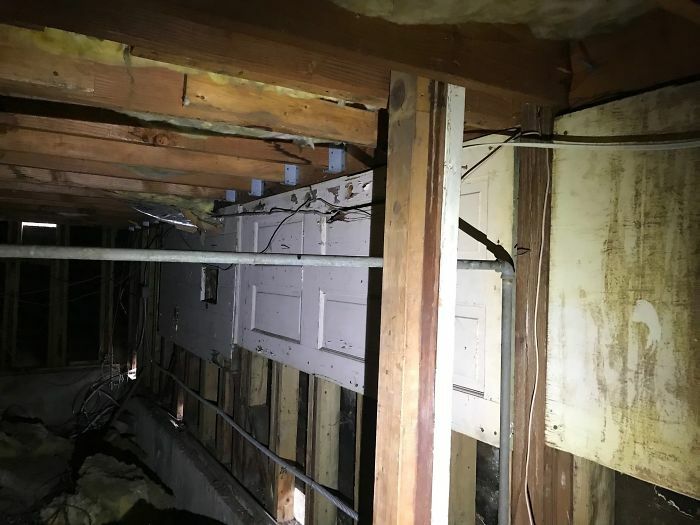 Seriously though, they used this as a sort of “shear wall” for additional strength. 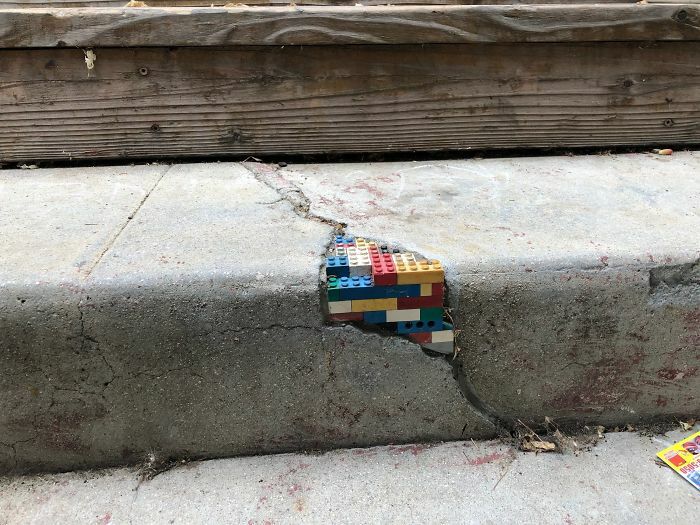 Again, an obvious DIY job. Not the craziest thing I’ve posted, but needs addressing none the less. 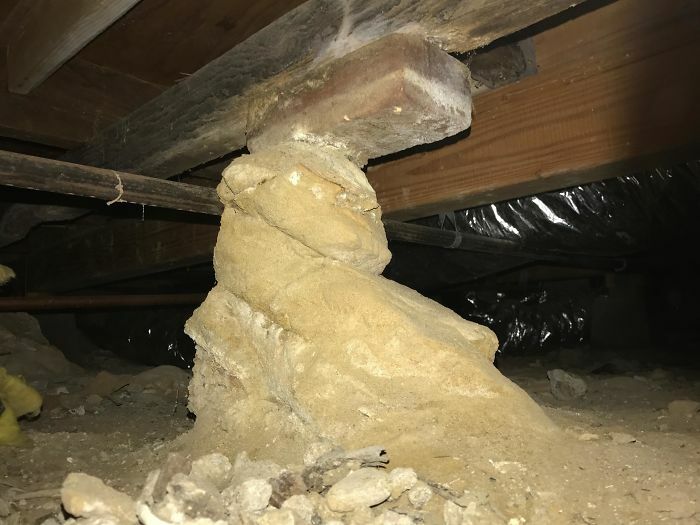 Stones and dust holding up a post under a home. They did it right in the 1920’s. 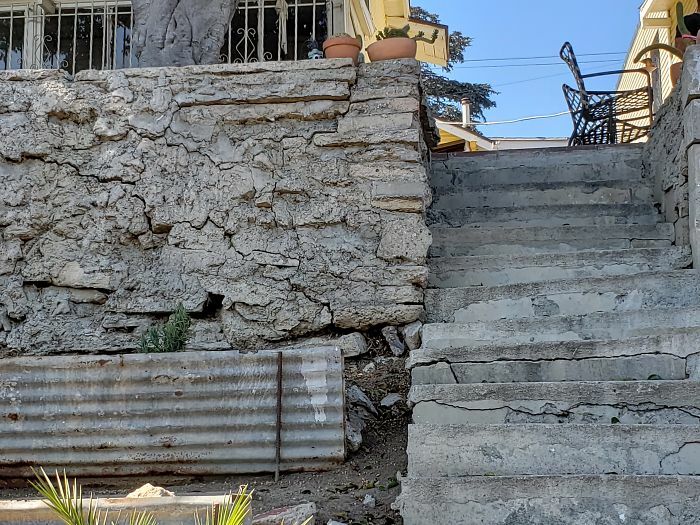 Eagle Rock hillside has some sketchy stairs and retaining walls. 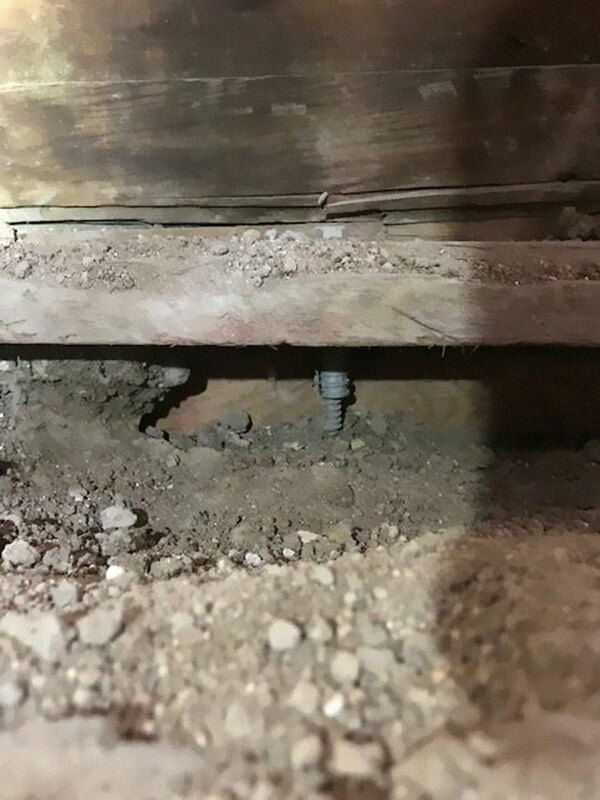 That bolt/screw you see is supposed to be holding down the framing into concrete. 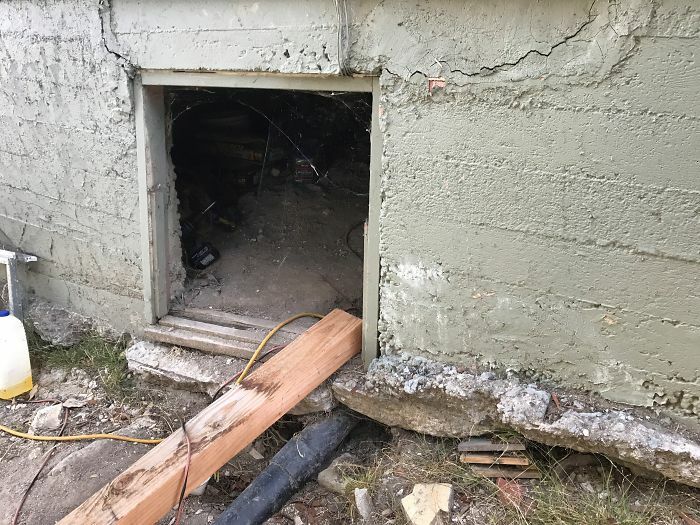 The concrete foundation has eroded almost completely. 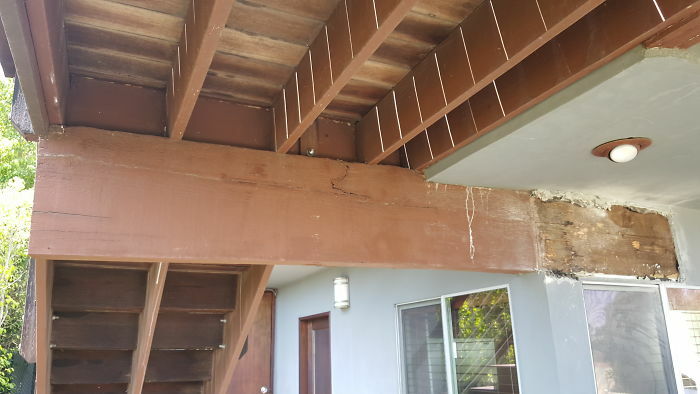 This is a deck that extended past the garage doors below it. 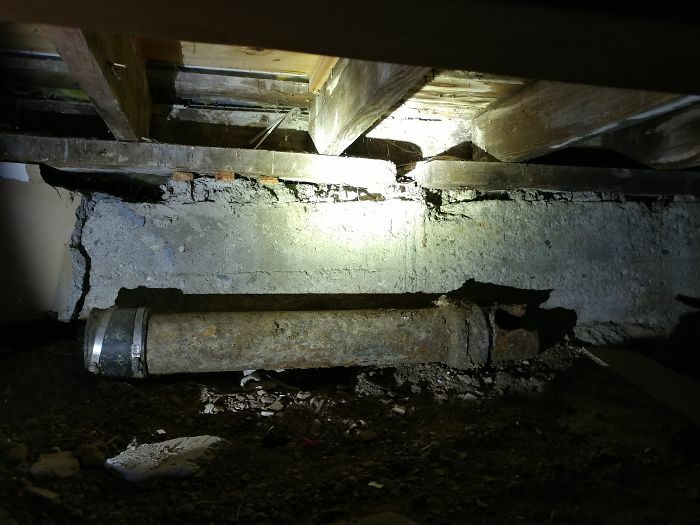 Needless to say, it had some insane wood-rot underneath! 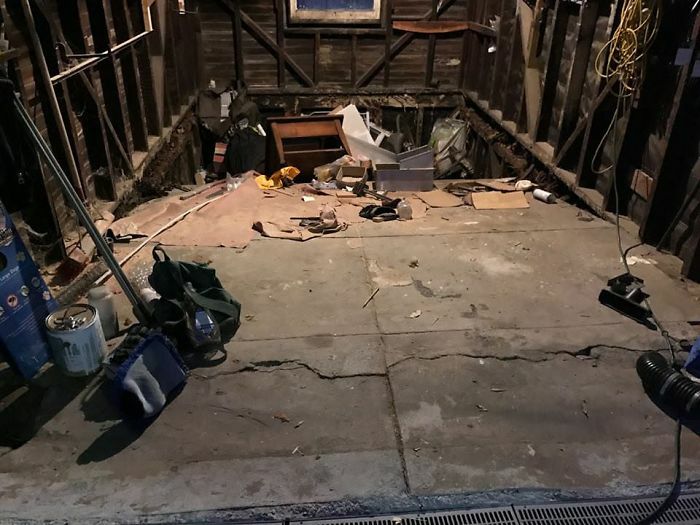 In the photo to the right, you can see the once sturdy deck was held together by a massive framing bolt. Now it’s free floating. 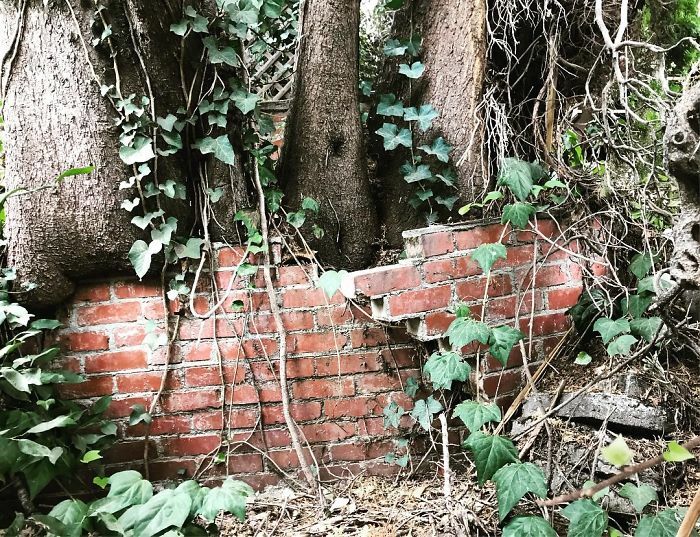 This is a brick retaining wall that has been failing over the past 20 years. 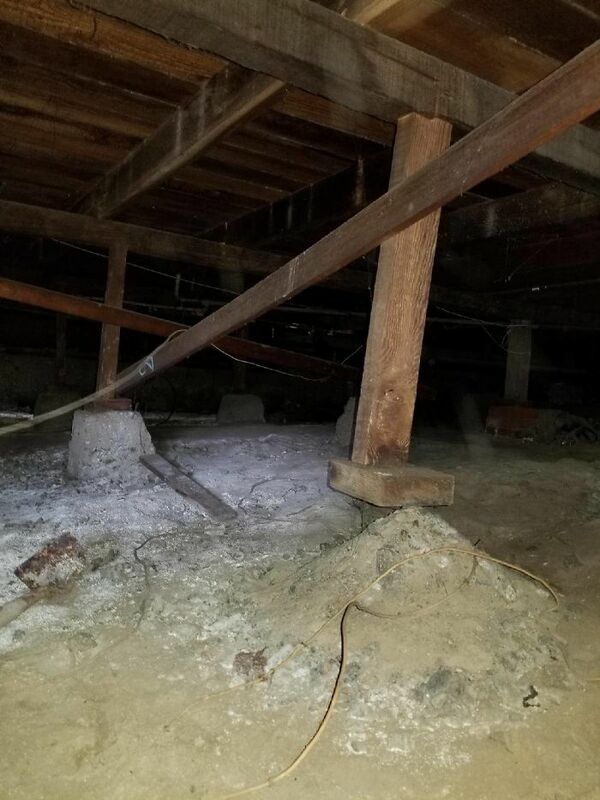 It leads right up to the house and would surely turn to dust in the case of an earthquake. 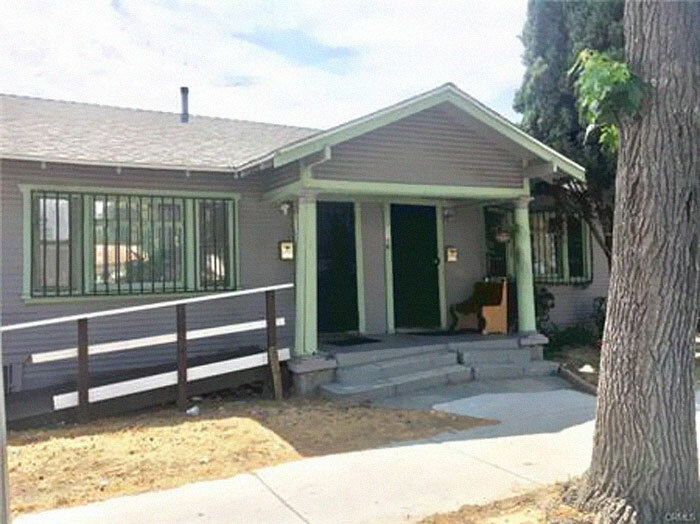 Same property, different issue. Who can name at least 5 issues within this photo? 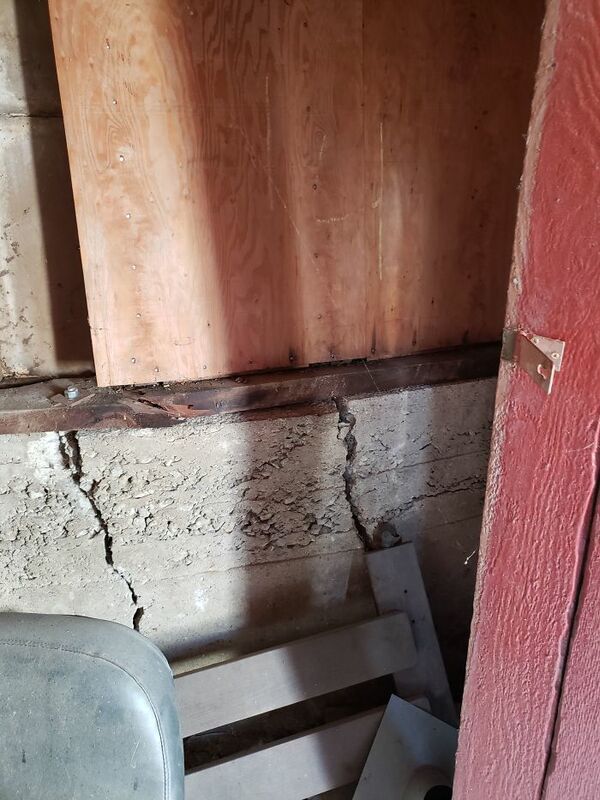 Same property except somehow it has gotten worse. 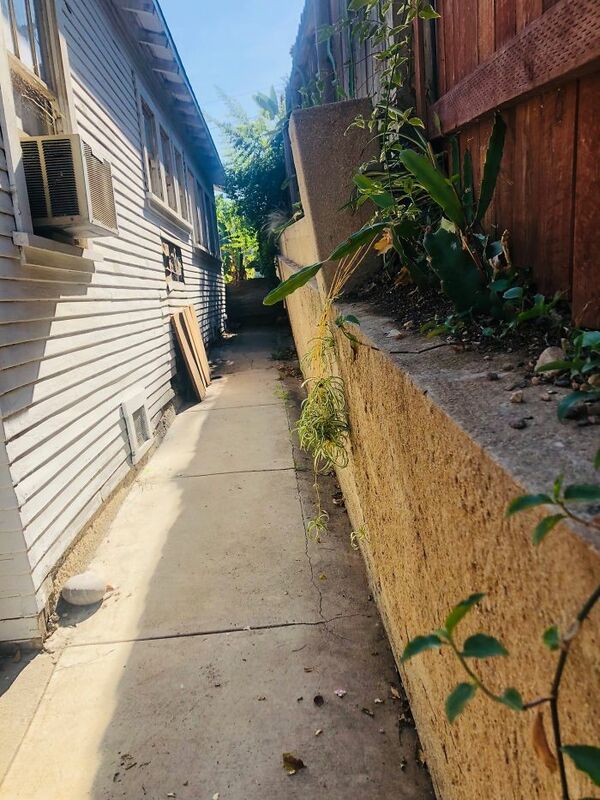 It’s quite obvious this is a non-permitted area will multiple issues. 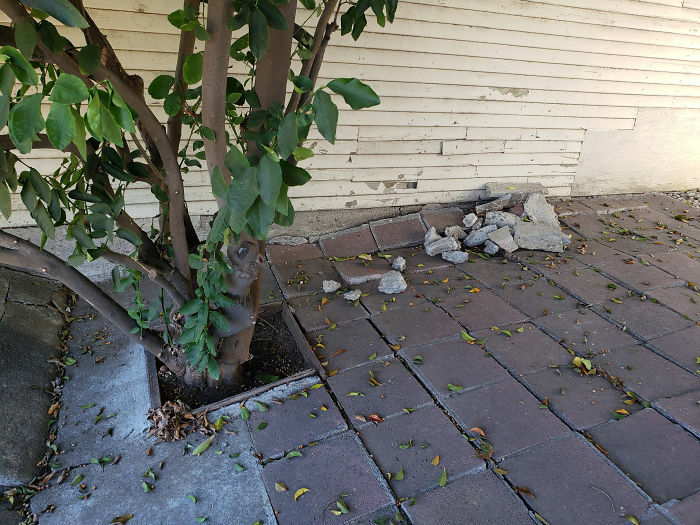 Brick garden wall is failing, brick and masonry wall is failing, material strewn around the yard, broken irrigation, and a sign that really helps people only in the back yard. 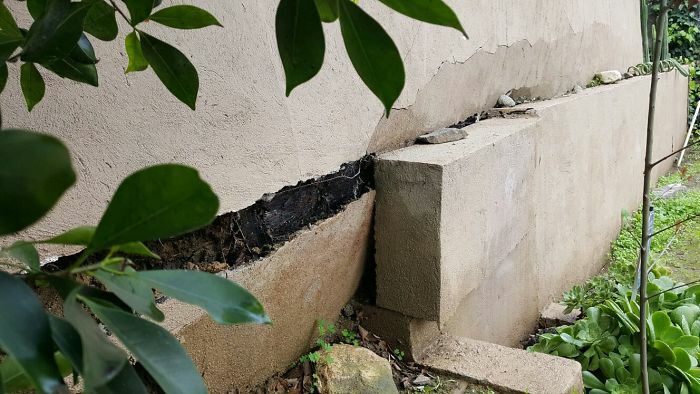 This homeowner thought it was a good idea to undermine the foundation and put in a few masonry blocks underneath. 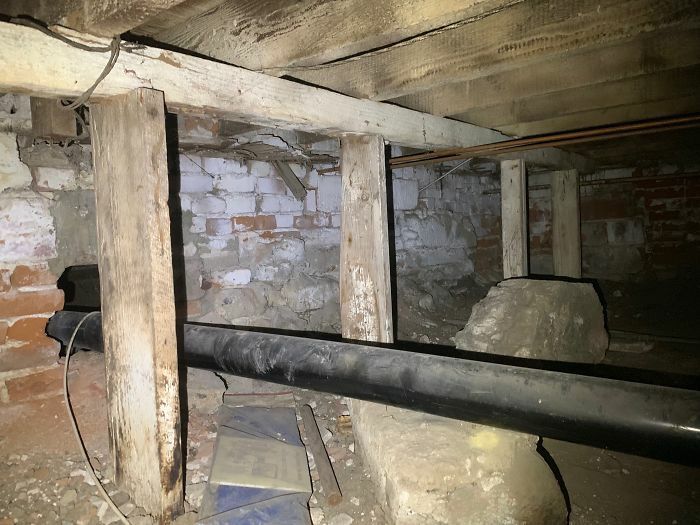 This was discovered by the city somehow. Tisk tisk. 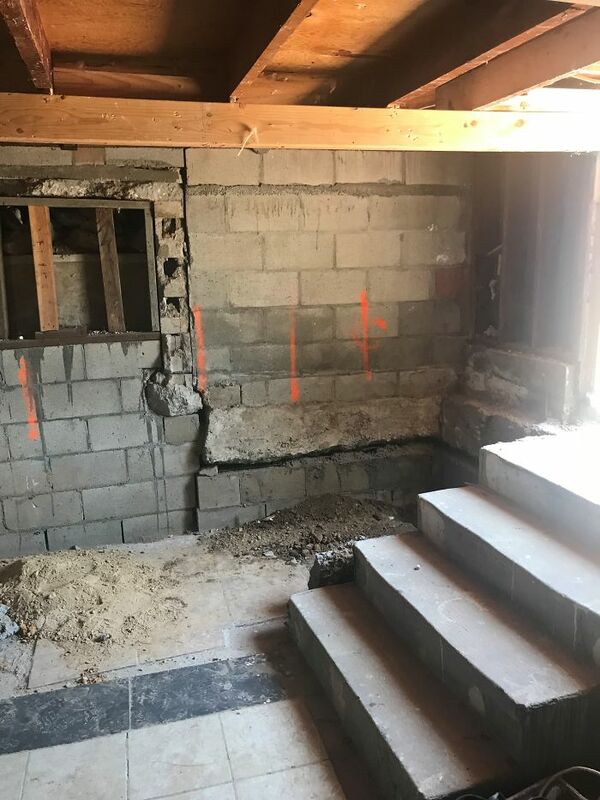 We are doing an entire sister foundation (built-in foundation right next to the existing) and I will be sure to share when we are done. 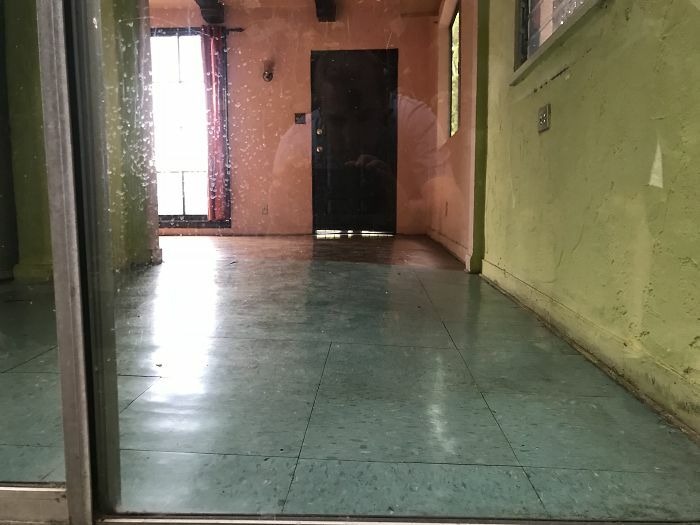 Sorry for the bad quality photo, but this is a one-story brick warehouse from 1947. 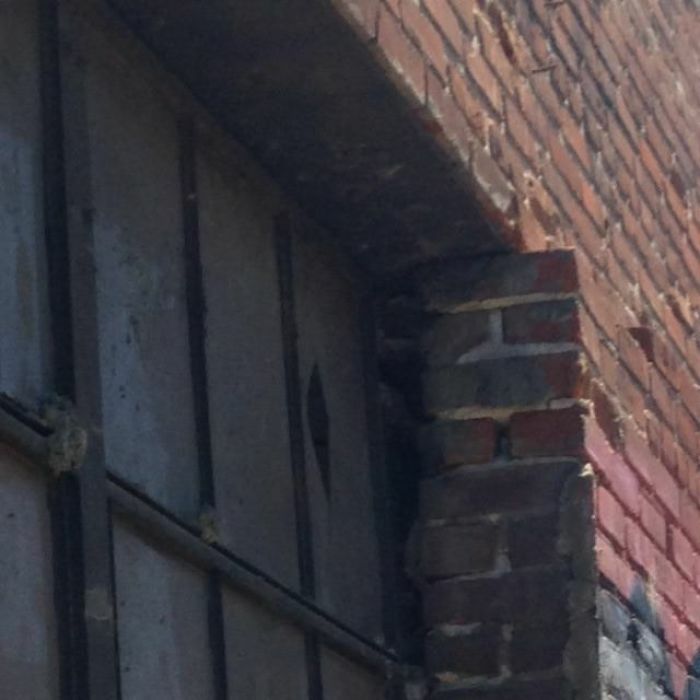 The lower half of the brick wall is completely tilted and days away from falling apart. 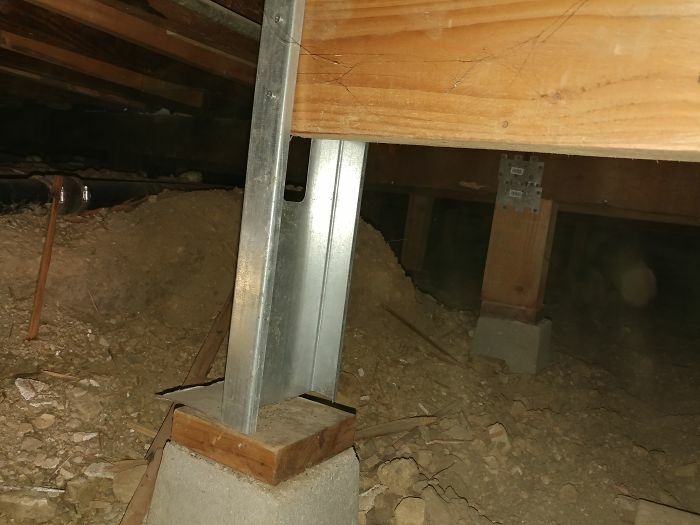 There were about 7 of these DIY posts under the home. 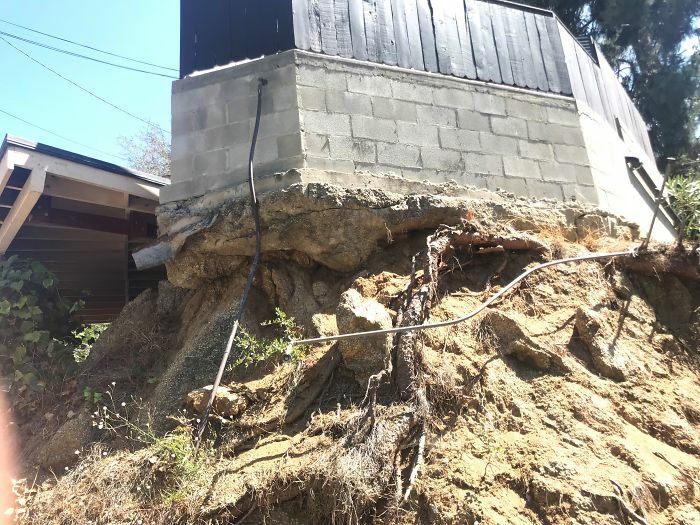 The owners were wondering why the property was sloping so much. This is why! You can’t really see it much in the photo, but the wall to the left is completely bowing inward. 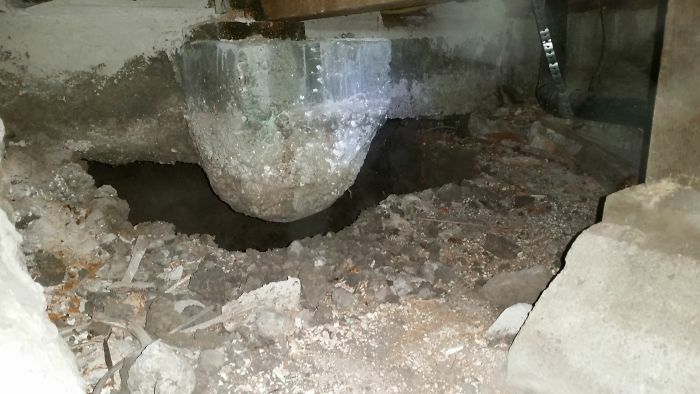 It was not bolted and the concrete foundation was sinking in. This is that same yard from the top. 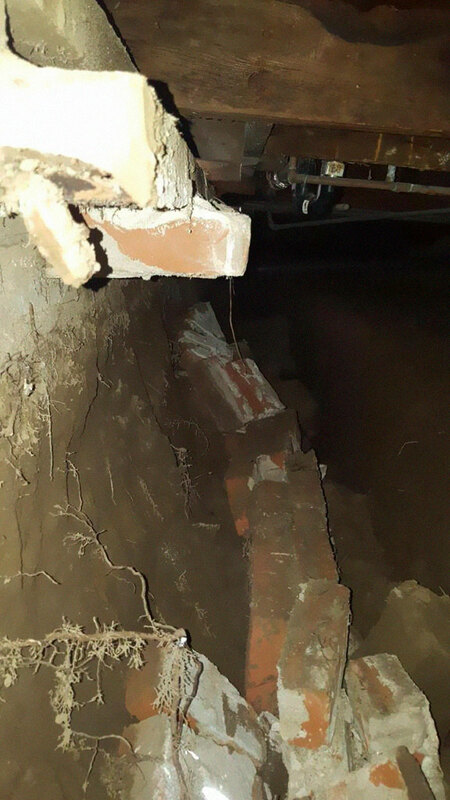 Another shot of the brick retaining wall that is evidently failing. This is the house equivalent of breaking your femur bone. 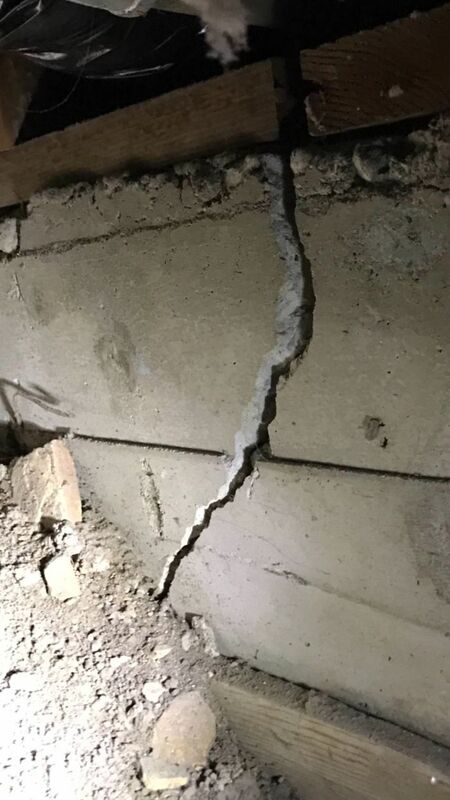 This is a very large crack in the foundation that is causing some settling, displacement and bowing of the wall above. 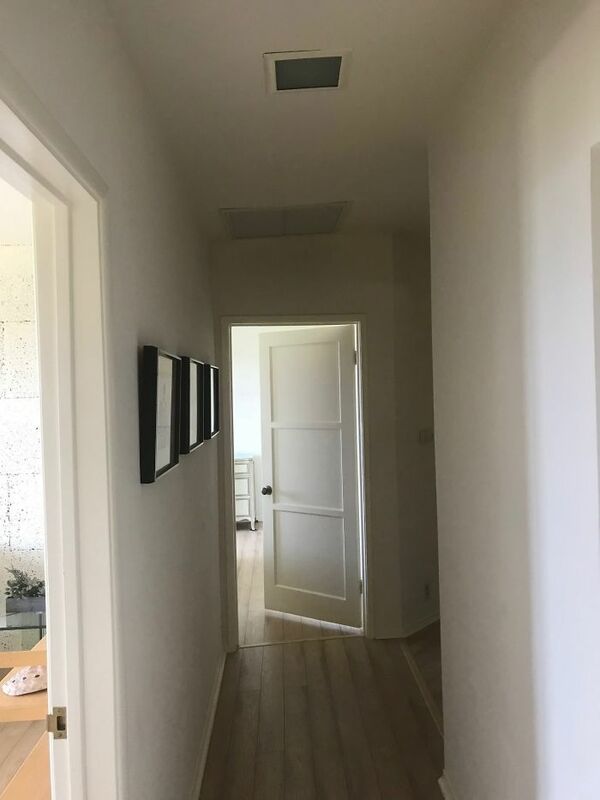 Here’s a better angle on the photos above. 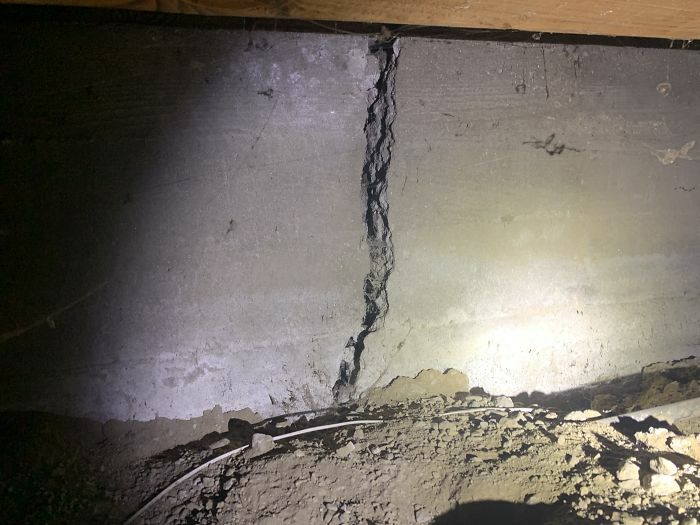 You can see how the mudsil (2×4 bolted to concrete foundation) is cracked in half and coming inward. No good. 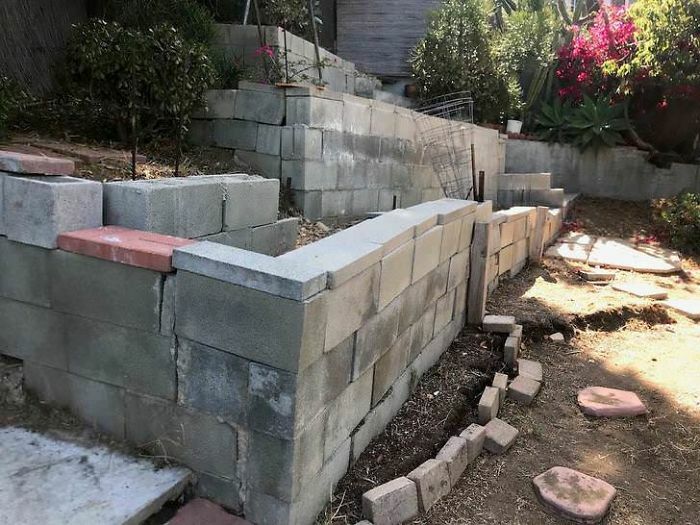 Another backyard that is full of non-permitted walls. Also, a massive tripping hazard. 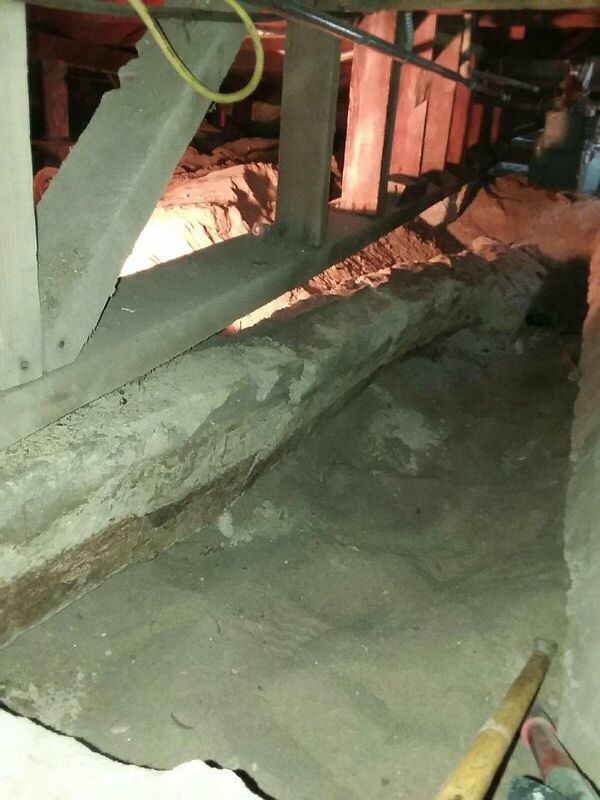 This photo doesn’t do it justice but that wooden support girder is tilting a good 2 inches toward the slope. The post it’s resting on is leaning outward and sinking back. 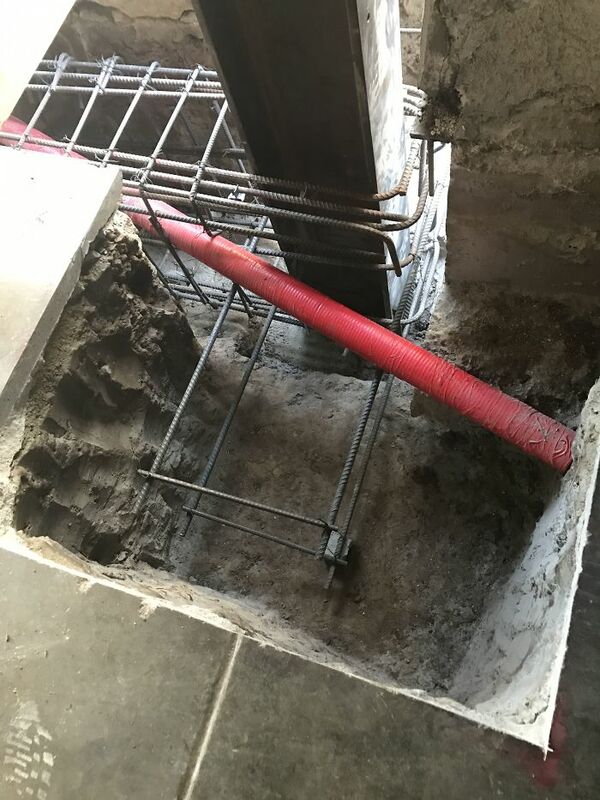 Replacing that post and re-securing the connections is the way to go. 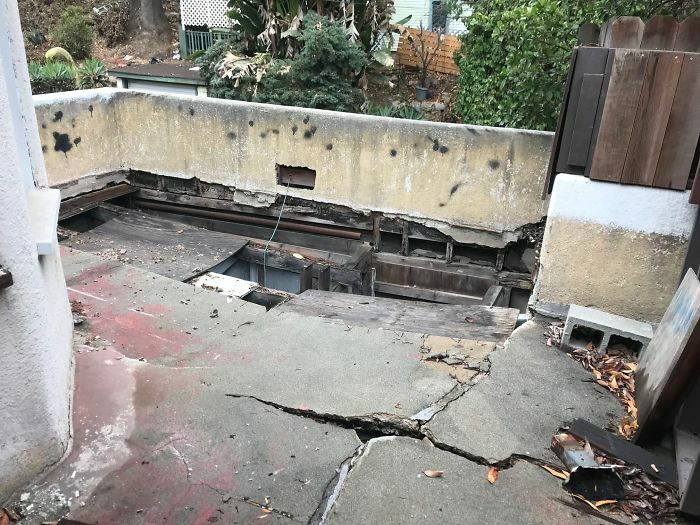 No imminent danger, but that deck could have fallen over time. Also posted this about a month ago but was randomly deleted last week and thought I would share it again. 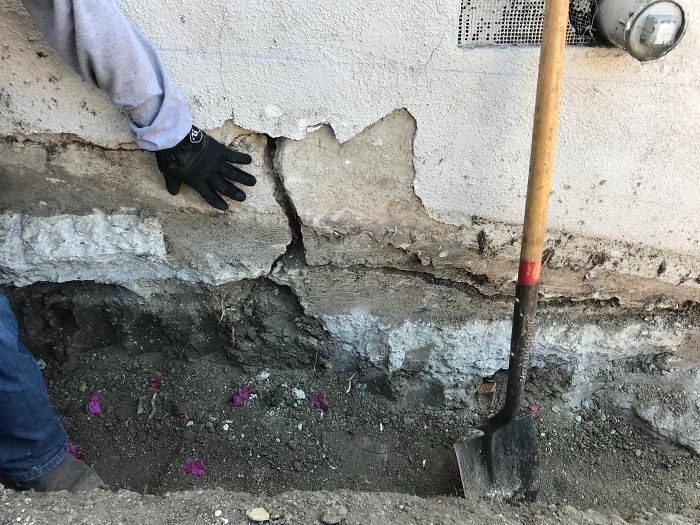 This is an exposed, exterior footing on an old 1910 property in LA. 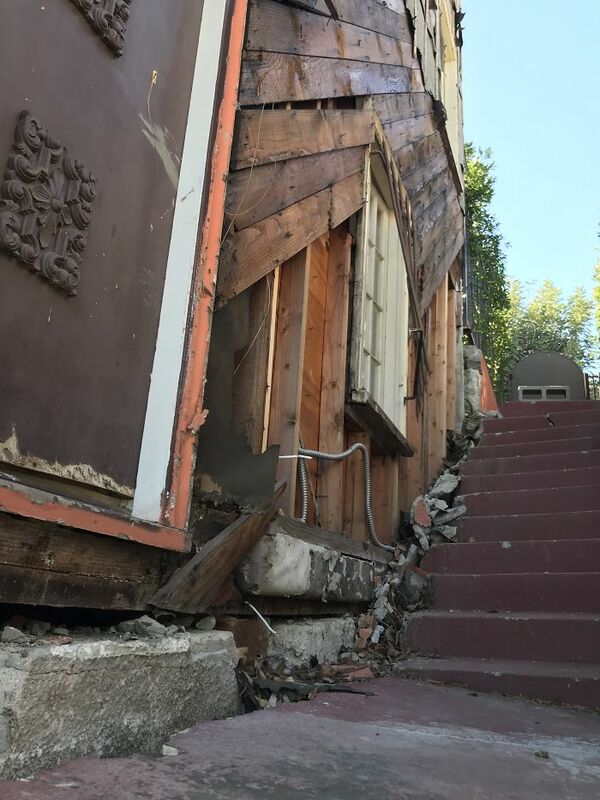 The house is basically tilting downward, away from the rest of the property. 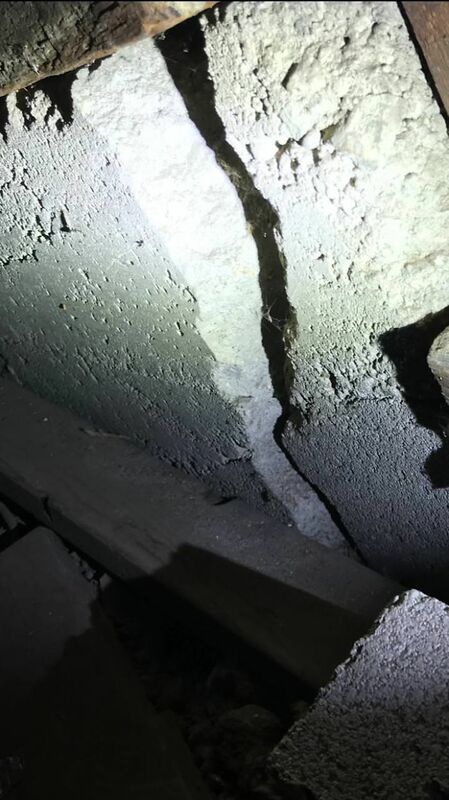 Displacement with a crack like this is a big problem. 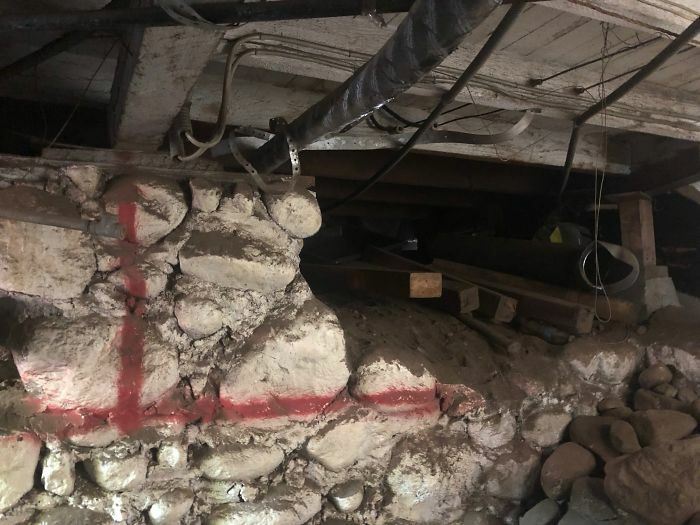 This was the “foundation” of an old school built in the early 1900’s. 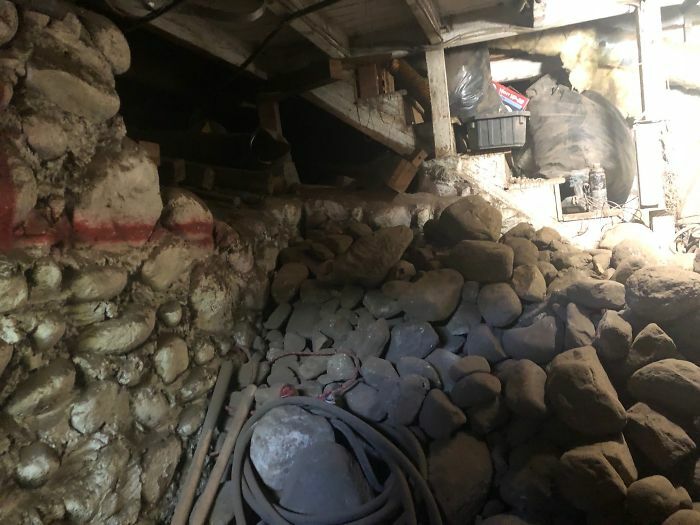 Completely made up of rock and rubble, this would in no way survive an earthquake. 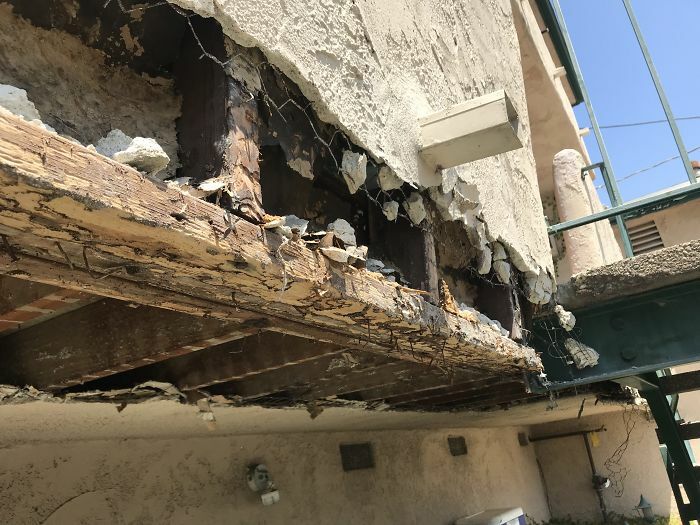 We’re redoing the entire foundation. 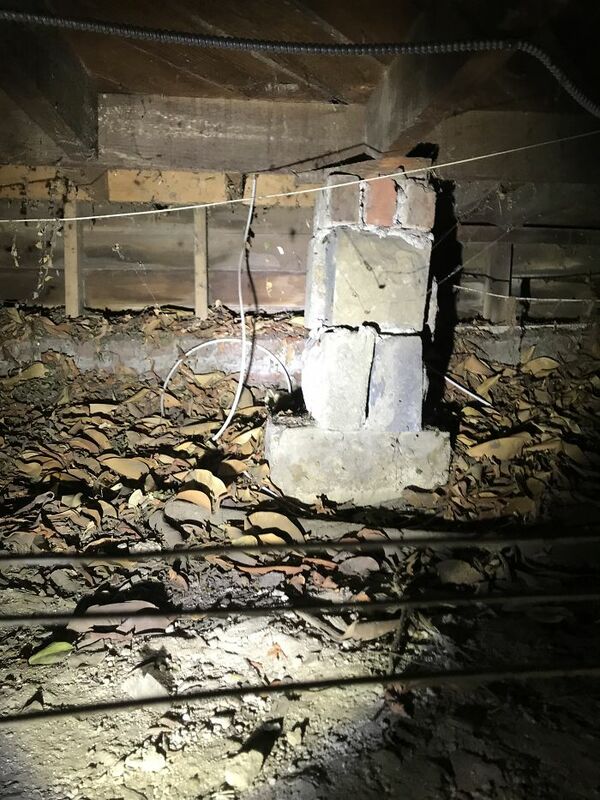 A foundation made of rock and an old chimney made of un-reinforced masonry brick. 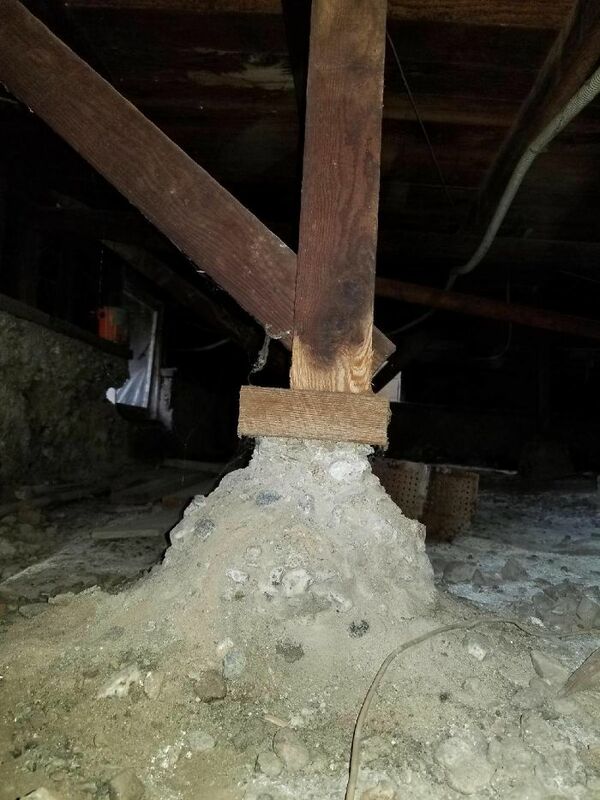 A collapse just waiting to happen. Don’t let the paint fool you, those stones are as unstable as the 1940’s stock market. 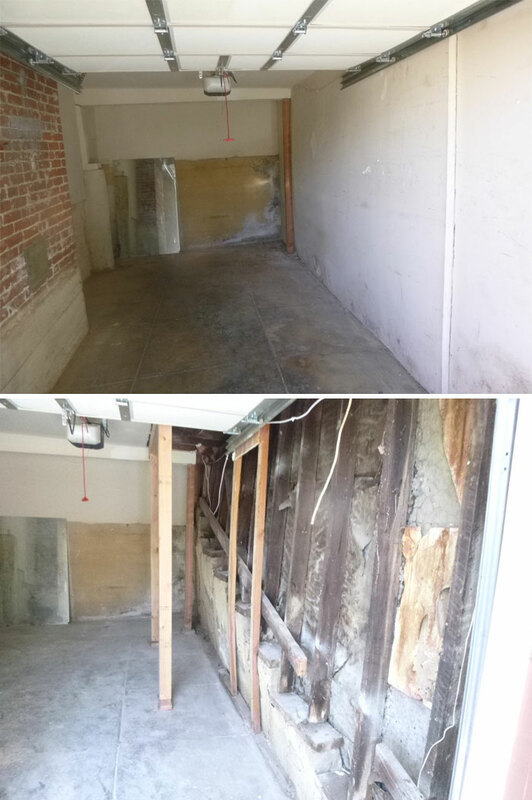 I will be sure to share some undated photos when the job is completed! 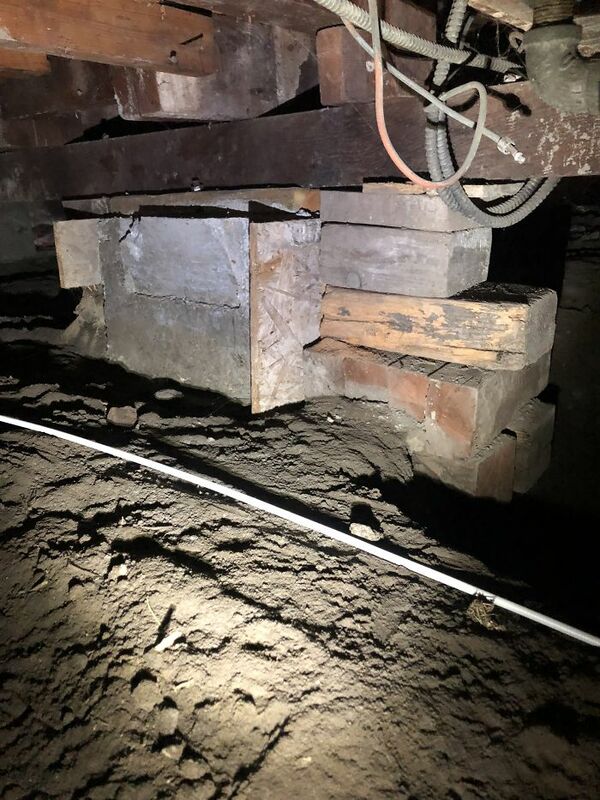 This was underneath a 1920’s home in East Los Angeles. 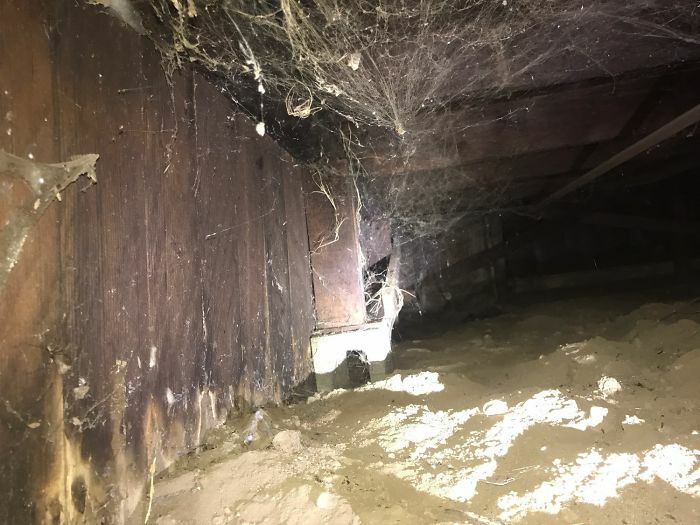 A black widow’s paradise. 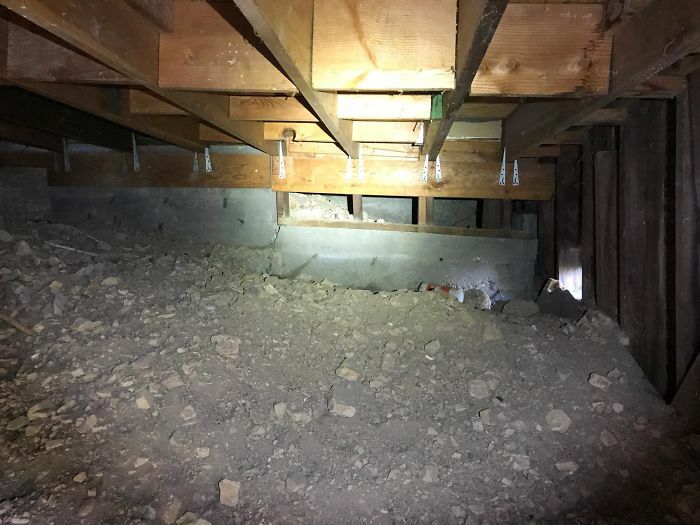 There was some pretty bad wood rot from an ongoing leak and the property was not seismically retrofitted. 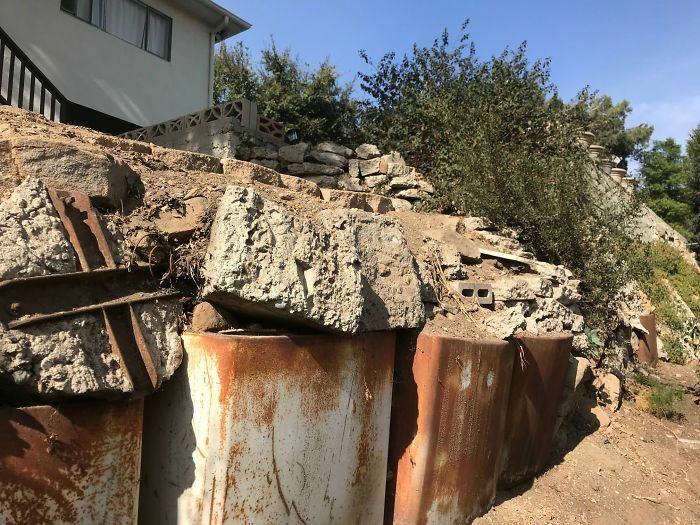 In addition to the knee-high rubble piles, DIY post like this one never suffice for earthquake protection. 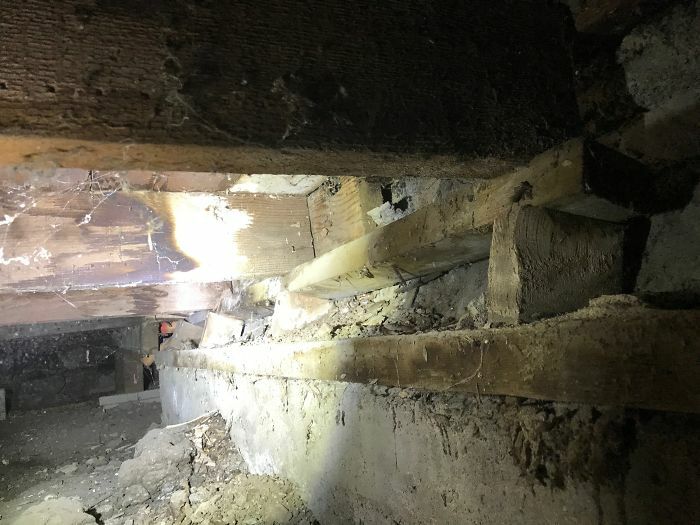 Though the I-beam on the left seems stable, all that is holding up that right side is that little car jack. 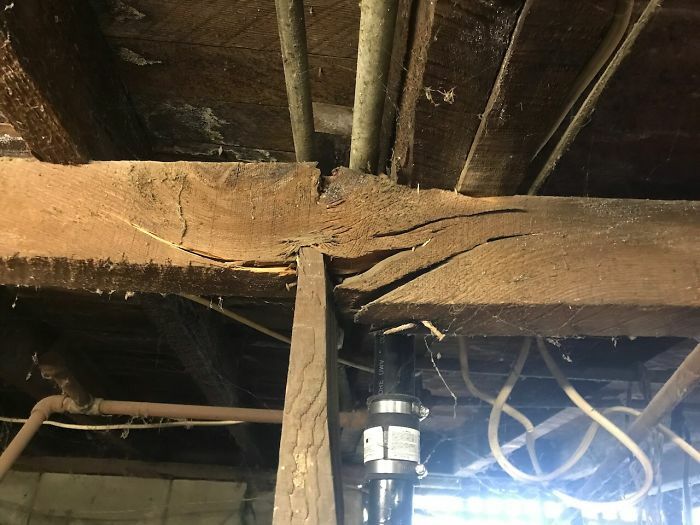 It seems to be holding up fine but..for how long? 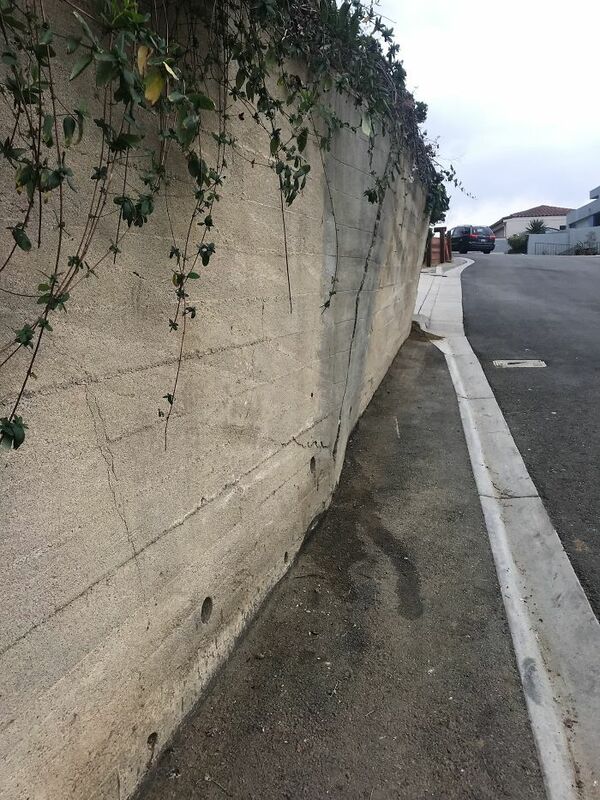 This was a massive 30′ retaining wall in the back of a few properties. 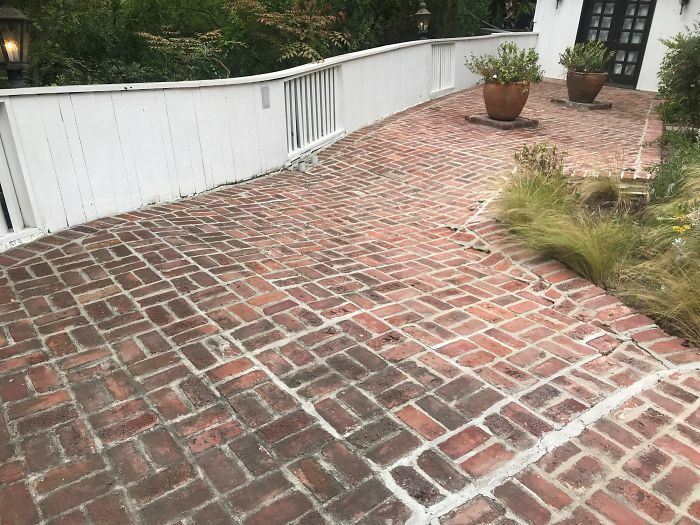 There’s nothing really “wrong” with it, other than it’s clearly uneven at most points and it seems to have been un-permitted. A pool at the bottom right clearly indicates the real reason the wall is there; cliff diving practice. 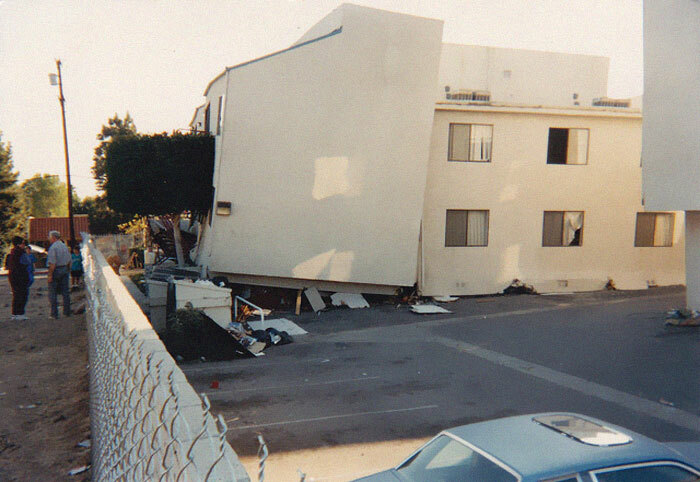 A lot of buildings in the 1994 Northridge earthquake simply collapsed, crushing cars and whatever else was unfortunate enough to be caught underneath. This is a great example of how the column/post in the middle did not suffice as far as it holding up the units above. Bend, snap and crunch. The exact process. 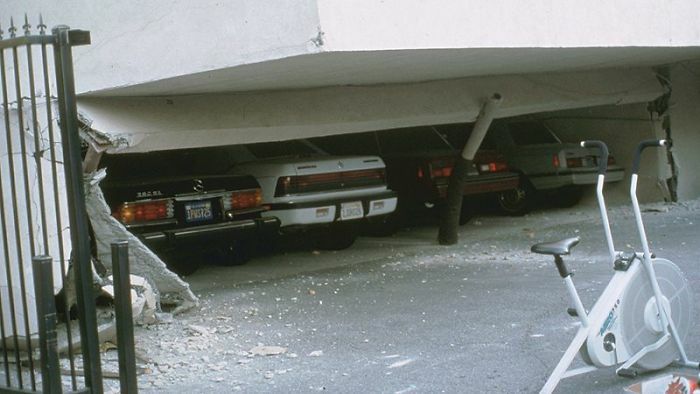 Here, you can see both sides of the property have collapsed and crushed the cars below. 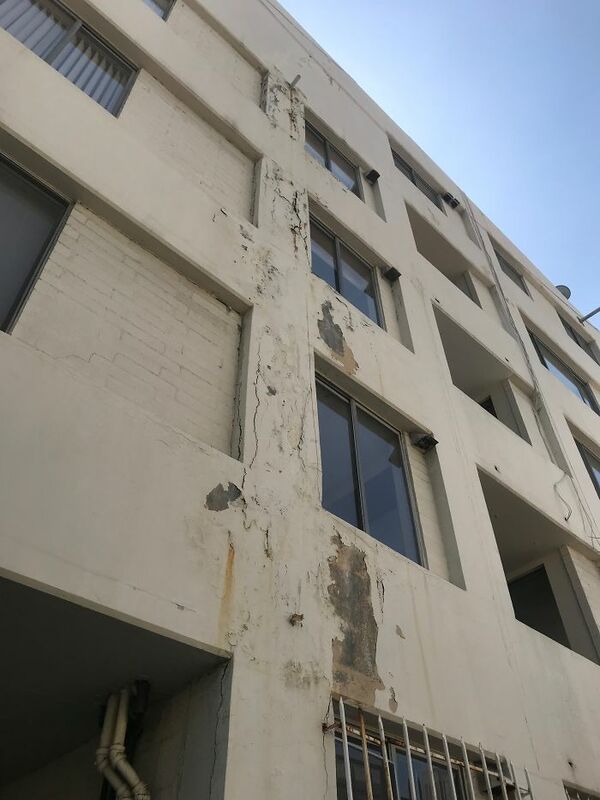 This was an inspection of a soft story building in Los Angeles. 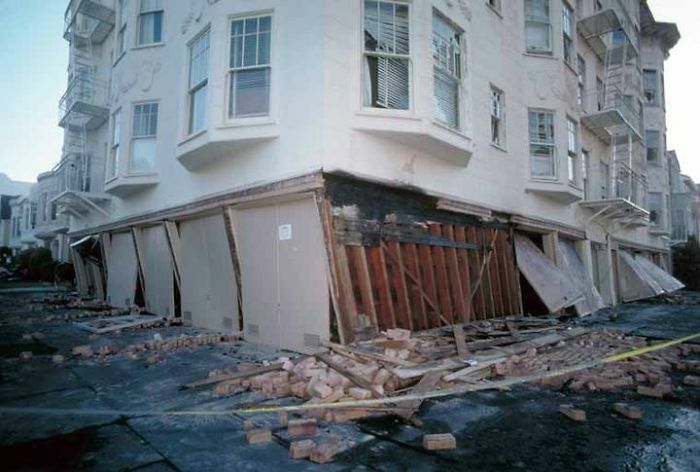 These buildings are under a mandatory ordinance for earthquake retrofitting. 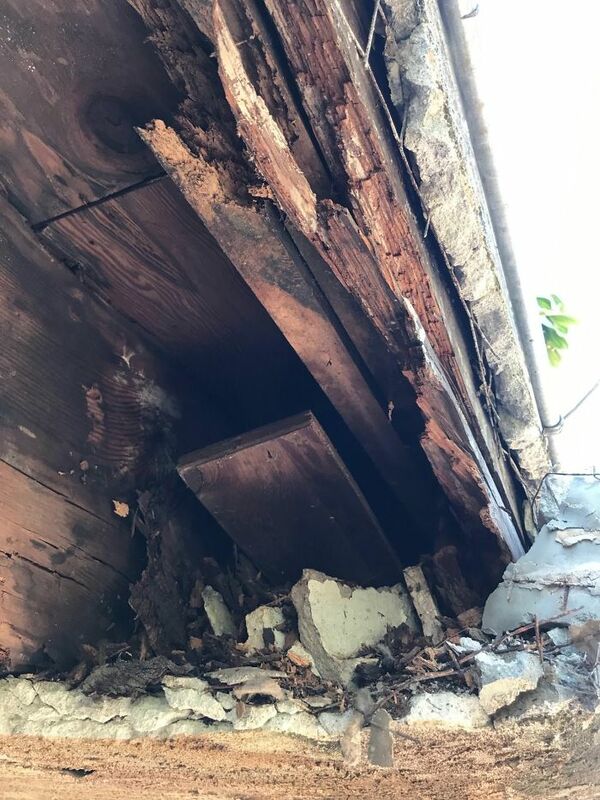 While on the “discovery period” for this project, it was discovered that there was awful wood-rot and rusting of the bolts and straps. 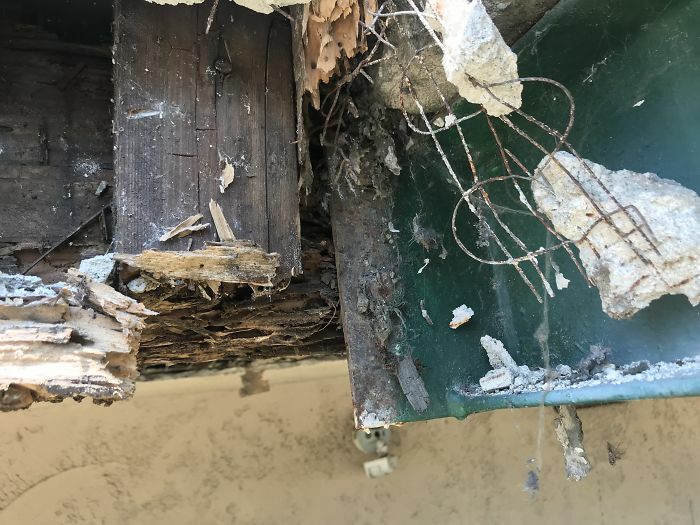 Here, you can see how badly decayed this wood member is. 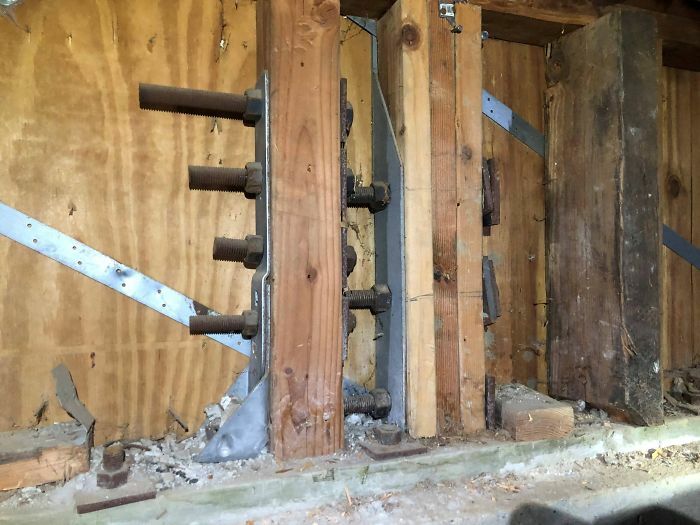 The bolts are rusting and pretty close to ripping away from the wood. 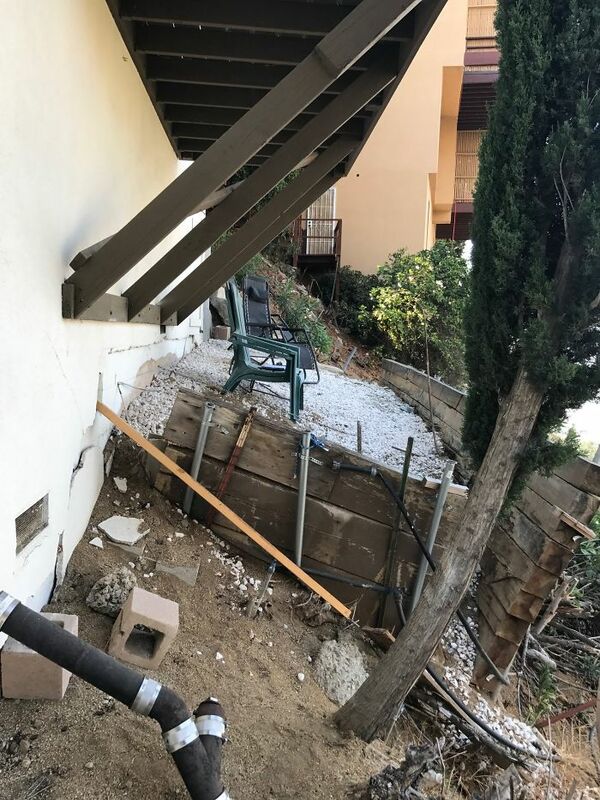 Those two bolts in the middle-left of the screen are the only thing securing the walkway/stairs to the bottom structure. 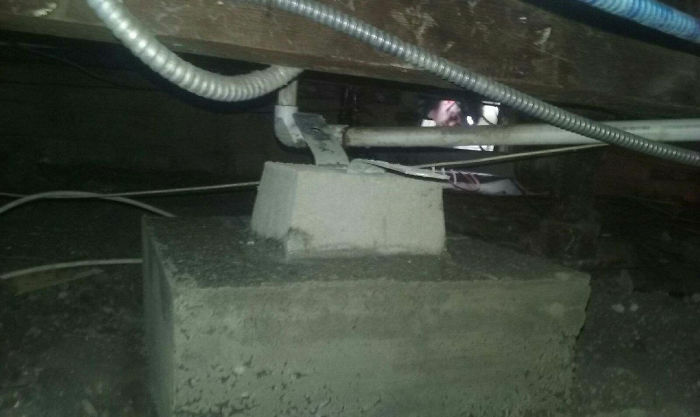 Luckily the concrete at the top of the stair set is doweled together, but that doesn’t make the situation any safer. 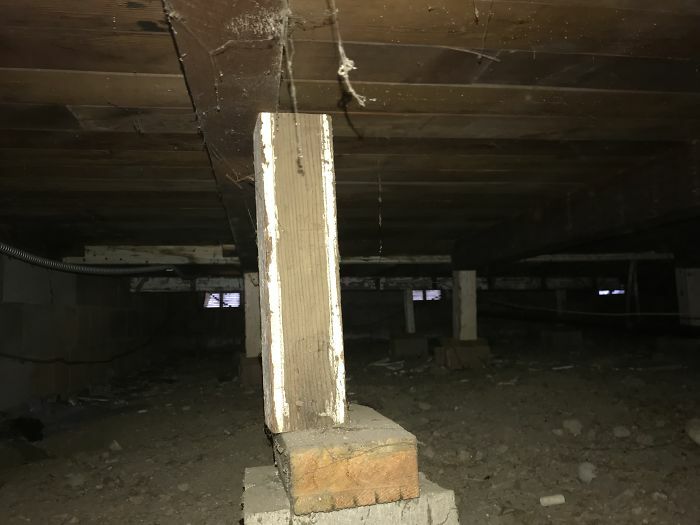 I know I wouldn’t want to live in a unit that had this as one of the main supports. 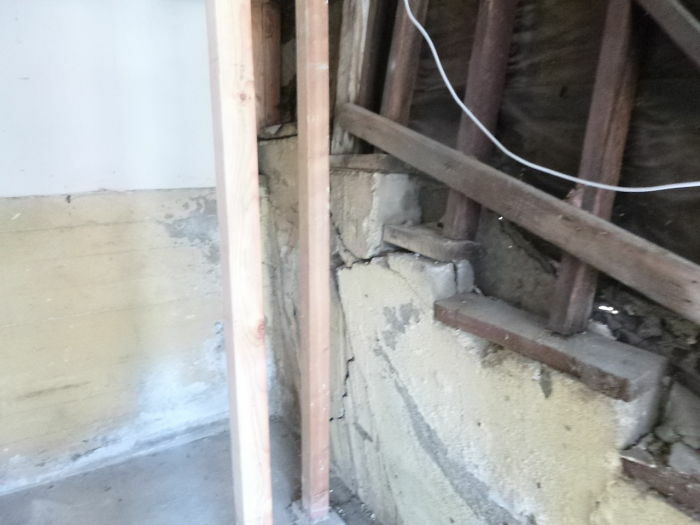 We’ll be demoing that whole side of framing and jacking up the stair way. 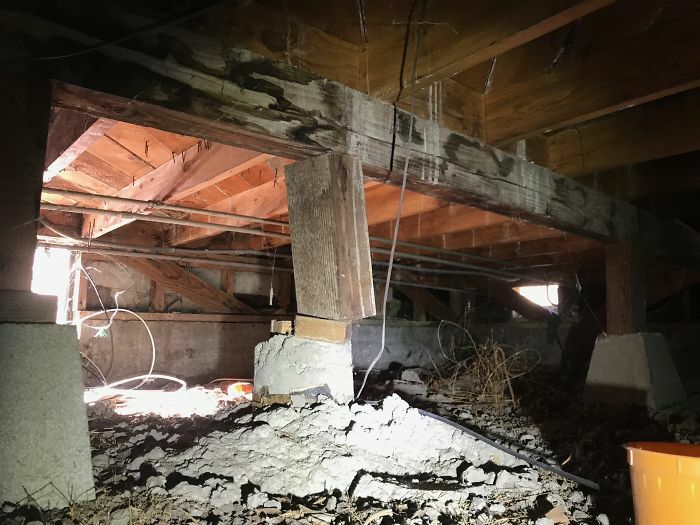 The retrofit will consist of many steel columns and new below-grade beams with steel reinforcement. 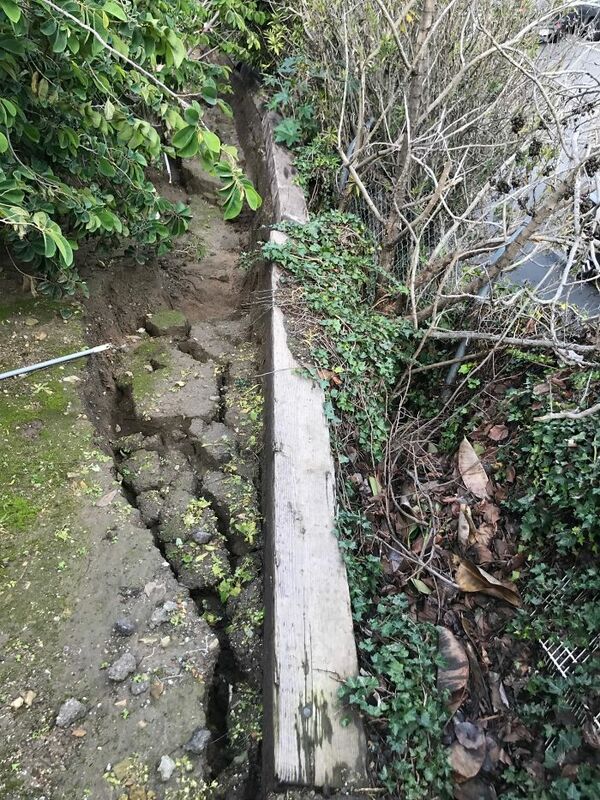 This was a failed retaining wall that we’re fixing up. 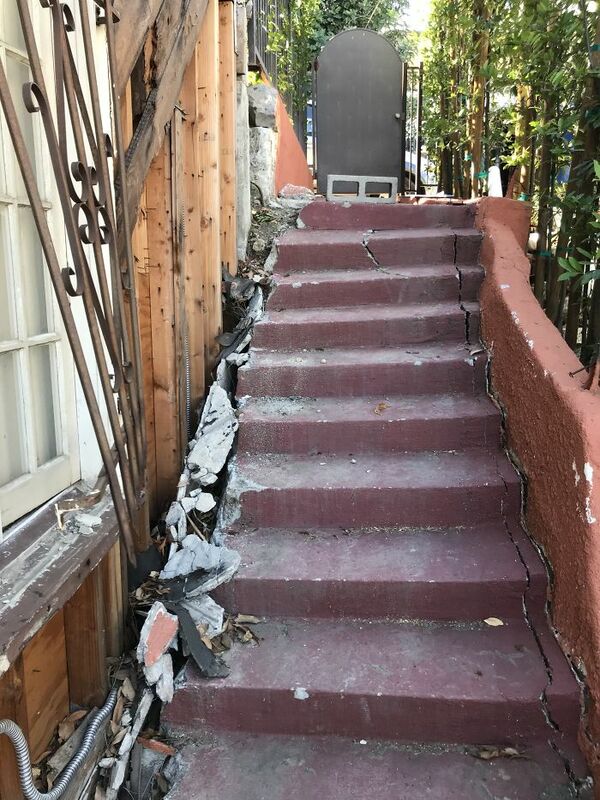 It actually wraps around the front (which you’ll see below) and the pressure underneath and farther up the hill caused it to fall over and collapse into the street and into the neighbors yard. 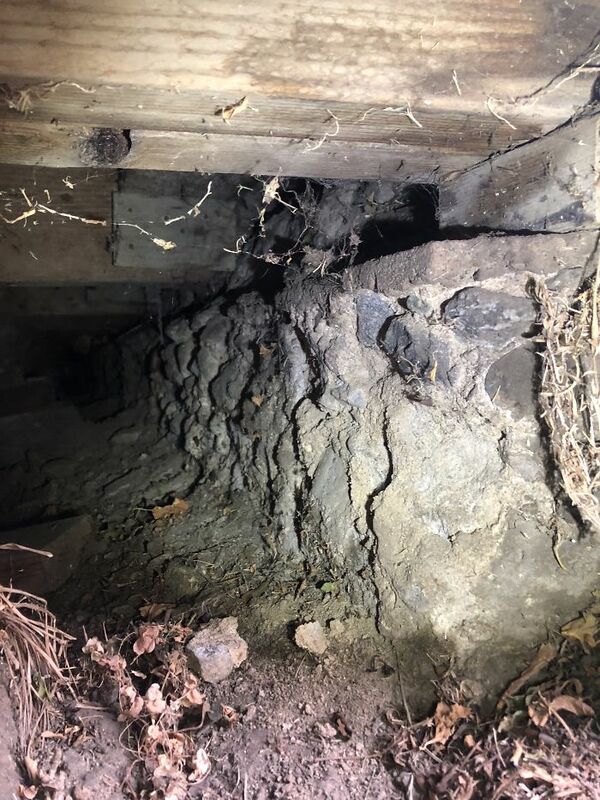 What occurred was called a “surcharge” and it’s when the pressure from the structure puts too much tension into the surrounding soil that it slowly gets pushed outwards. 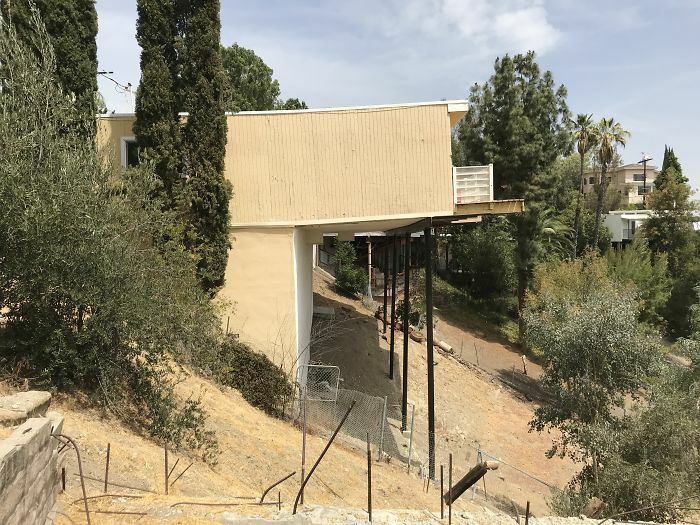 Here it was further up the hill and on the side of the property. 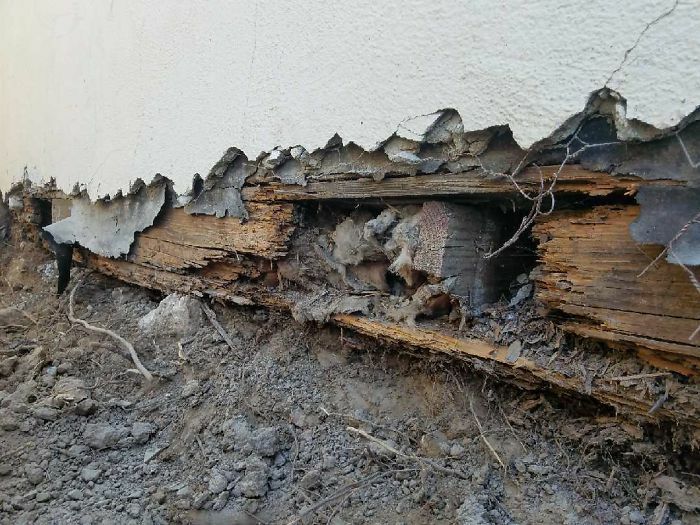 This can also be caused by water saturation and poor drainage. This is actually a project that we took on and it’s almost done. 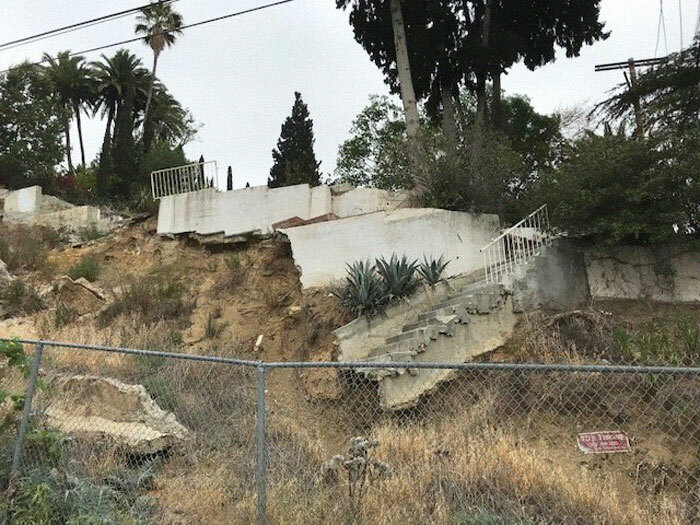 This is a VERY steep hillside up in Hollywood that was collapsing and continuously falling and creating more damage to the hillside. 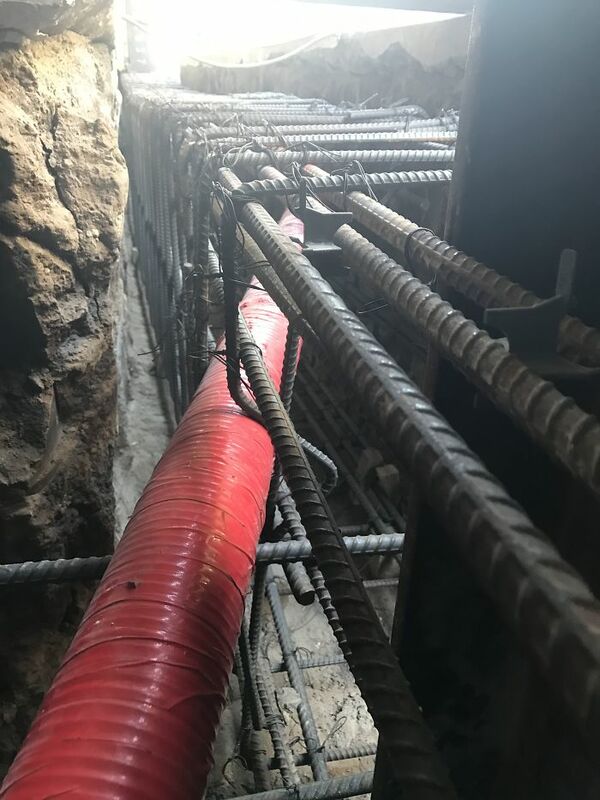 We drilled piles down about 30 feet to bedrock for stabilization and added a new retaining wall system for the upper tier. 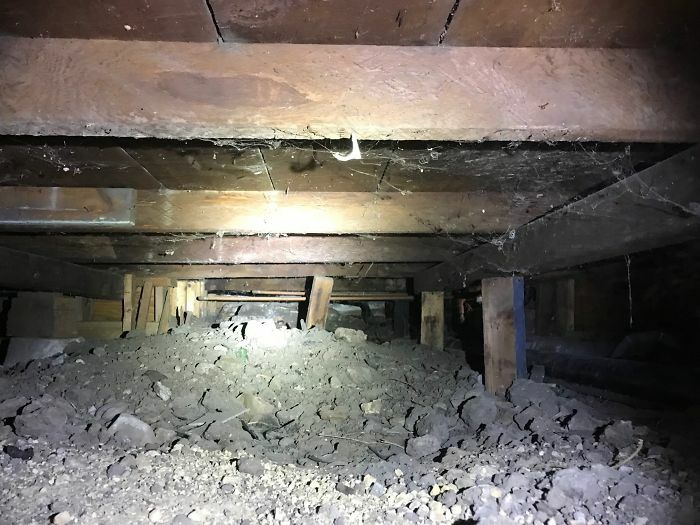 Occasionally, we go out to a property before we do the work for a ‘discovery period” where it is known what is happening but we must find it and expose it for repairs. 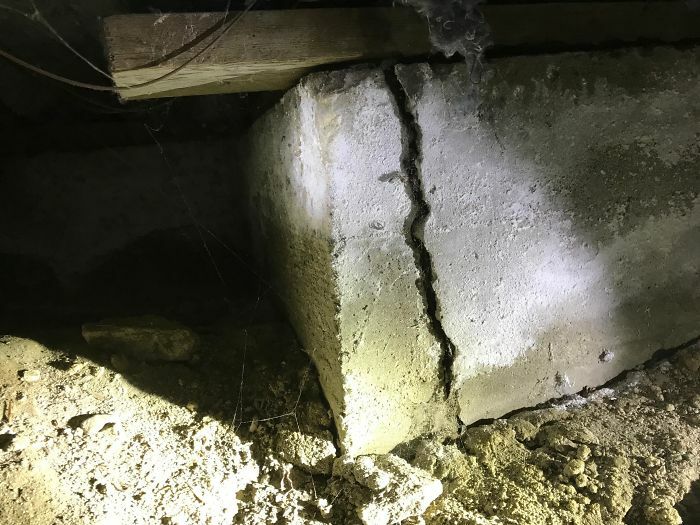 That was the case with this massive foundation crack. 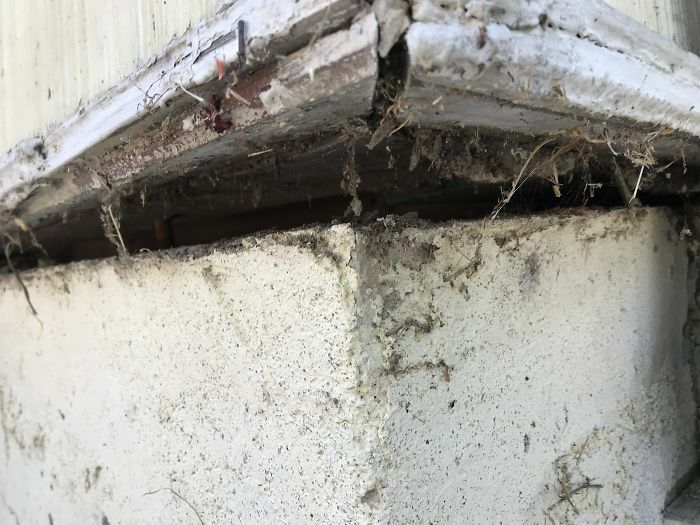 The stucco on the outside was fine, but once it was removed, we found our problem. 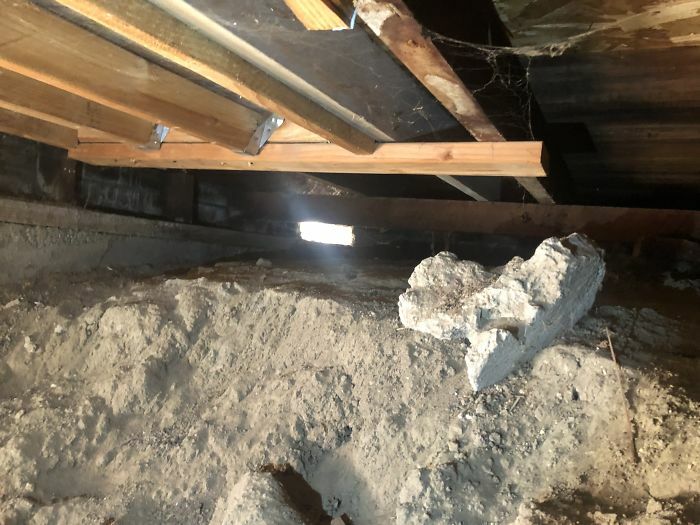 And for those who I know are going to ask, the crawlspace was inaccessible due to asbestos and minimal working space, that’s why it was done from the exterior! I posted this separately but thought it would be a good first photo this week. 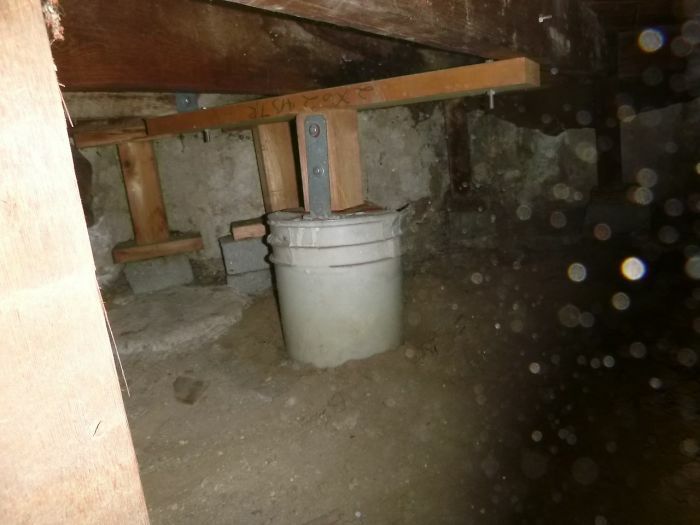 For those wondering, it’s a bucket filled with sand, not concrete, used as a concrete pier. Code? Nope. 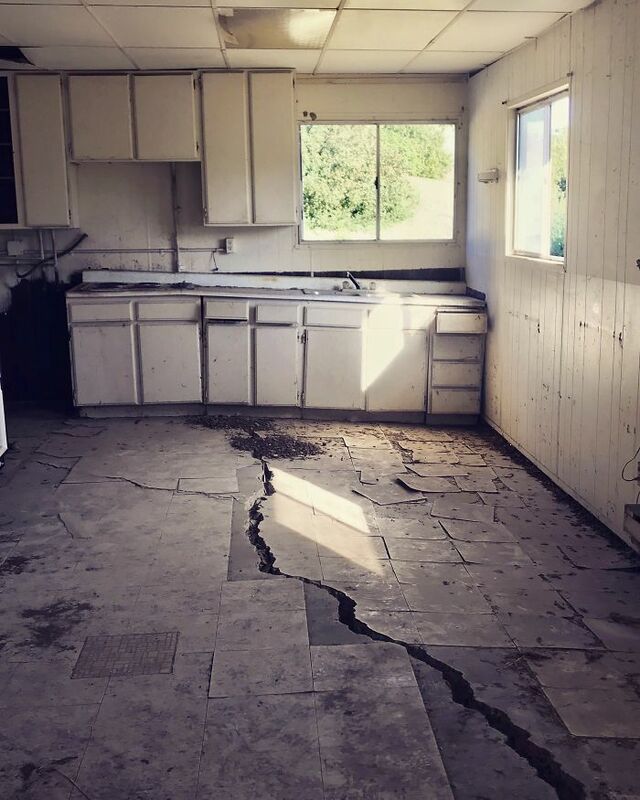 Aesthetic? Nope. Funny? Yep. 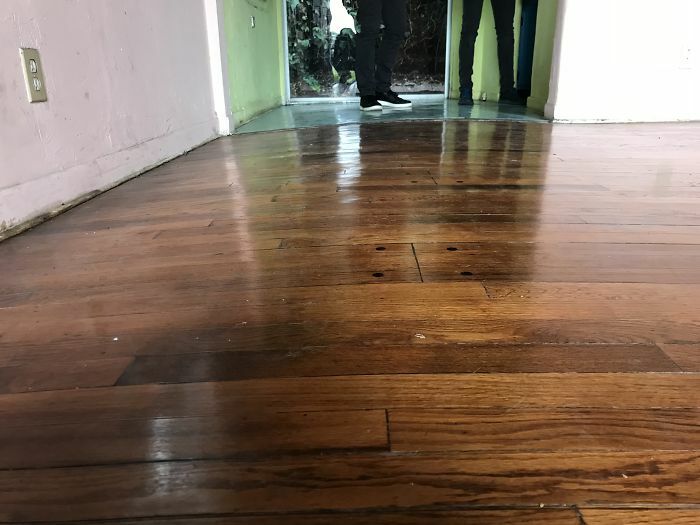 The floors in this house were slowly sloping away from the center of the home. 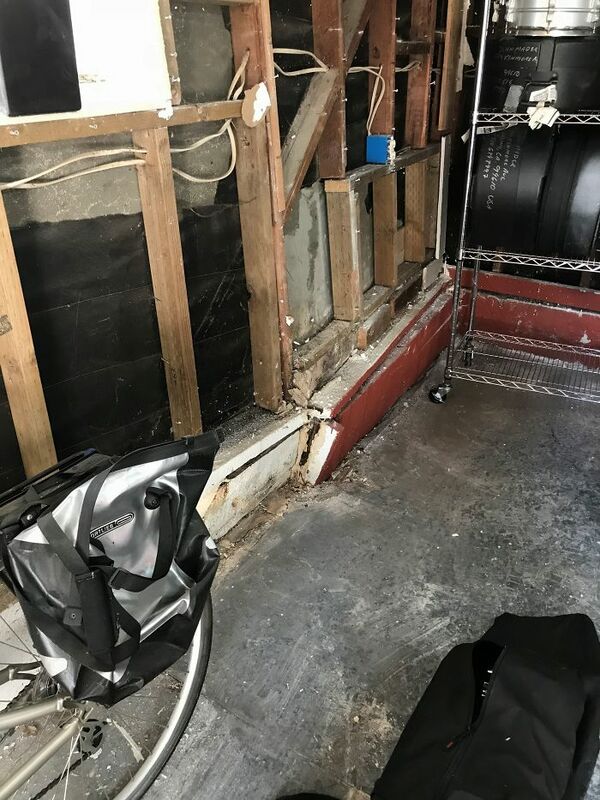 The owners had to rip open the carpet and call us out for an evaluation of the slab. 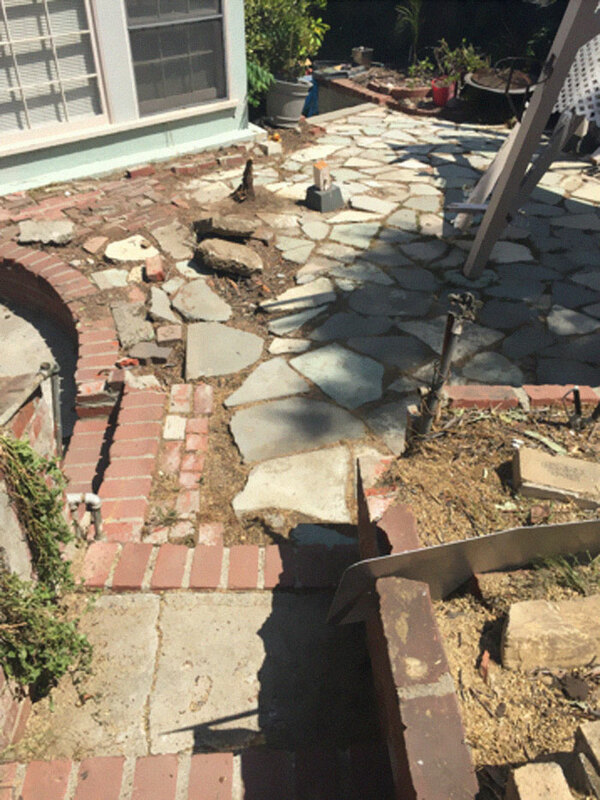 Not much to evaluate…we’ll be replacing the entire slab. 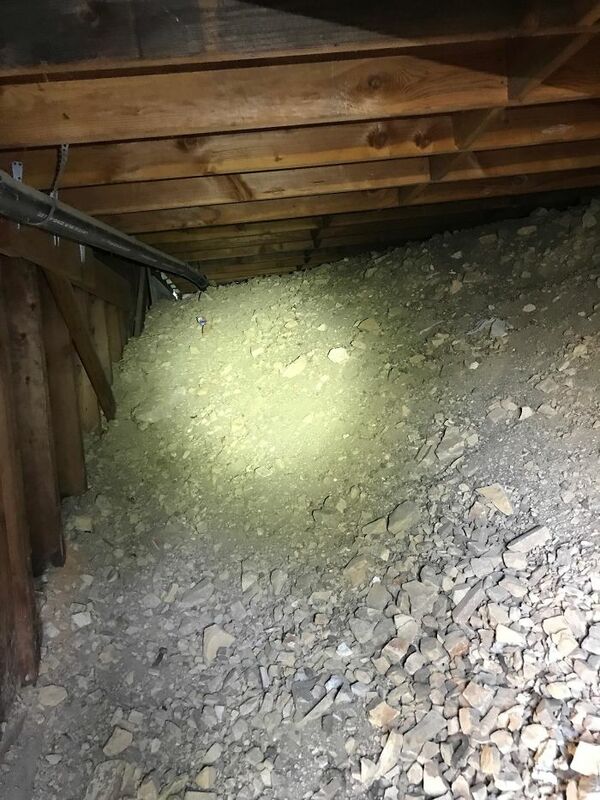 Same property as the above photo, except this one was in the garage. 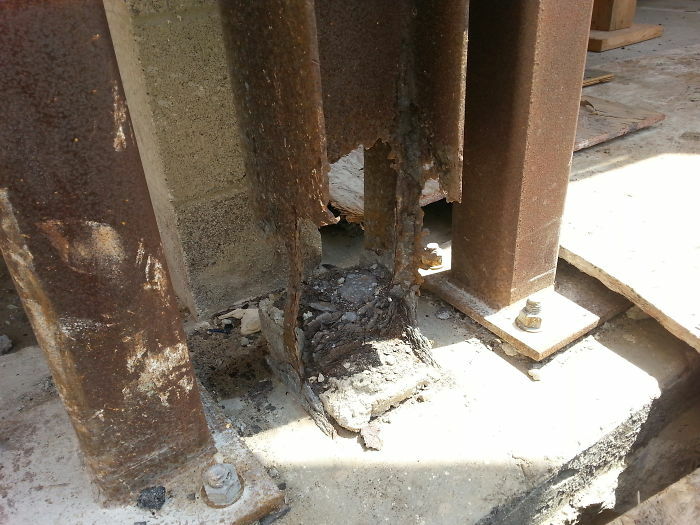 A steel stud used as a post for girder support. 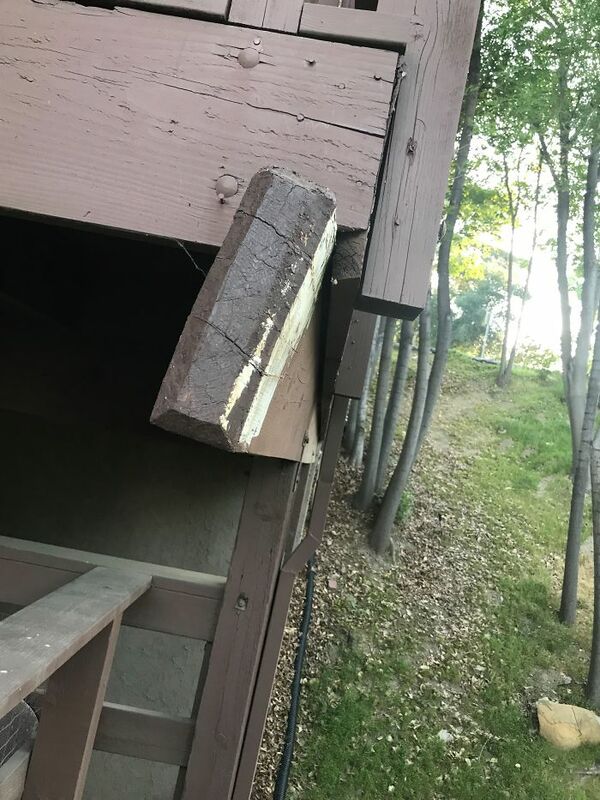 Structurally, it could probably hold up fairly well compared to the post behind it, but it’s definitely not code. 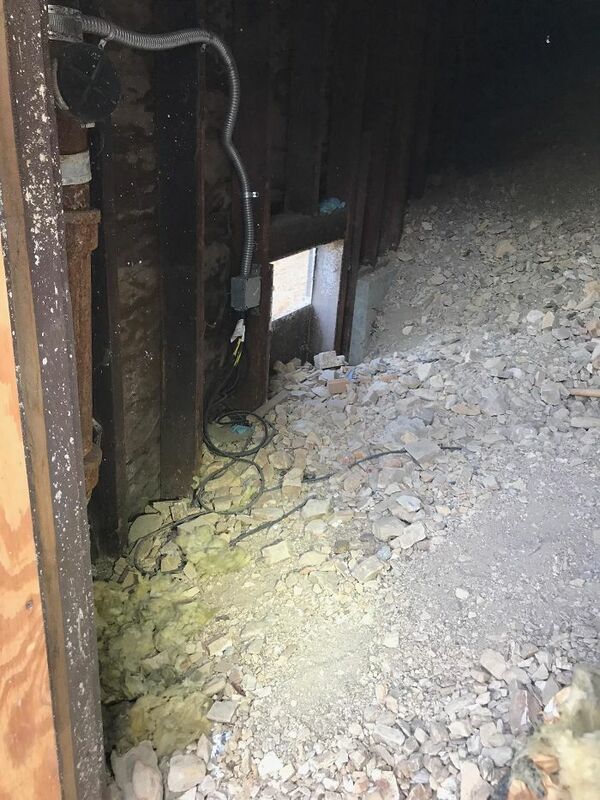 Just don’t stick your hand in there…the house could bite. You don’t have to be an expert to see there’s an issue here. 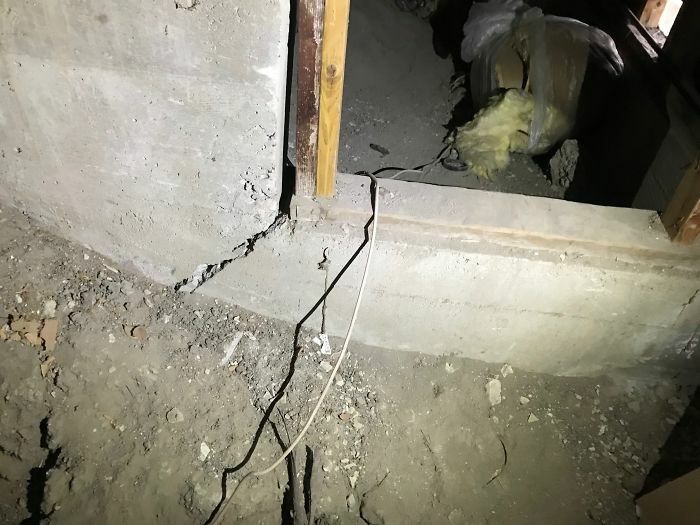 The foundation and framing connection ( cripple wall) is buckling out toward the driveway. 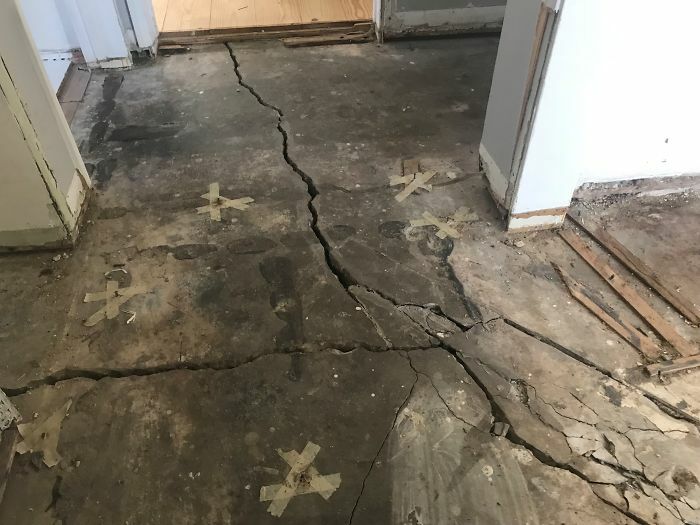 This is causing sloping floors, interior and exterior cracking and sticking doors. 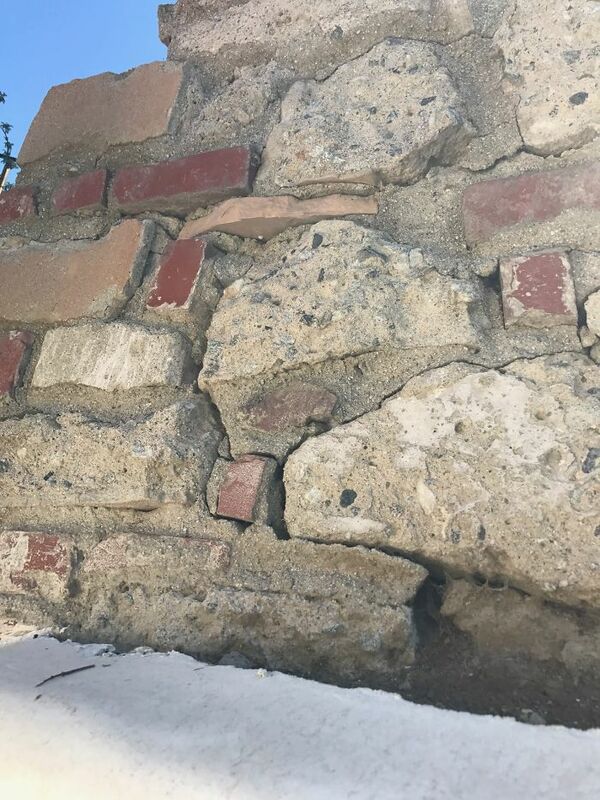 This is a retaining wall that has a very odd crack going straight through the center of the masonry blocks. it seems nature has won this battle against man. 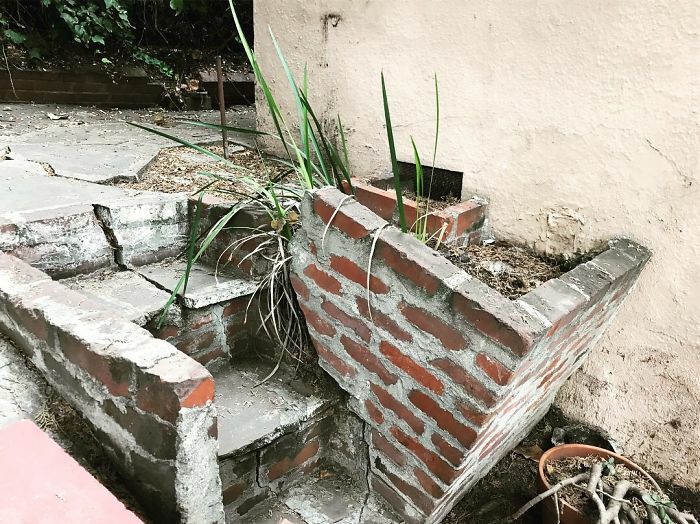 At least the plants are healthy and safe. 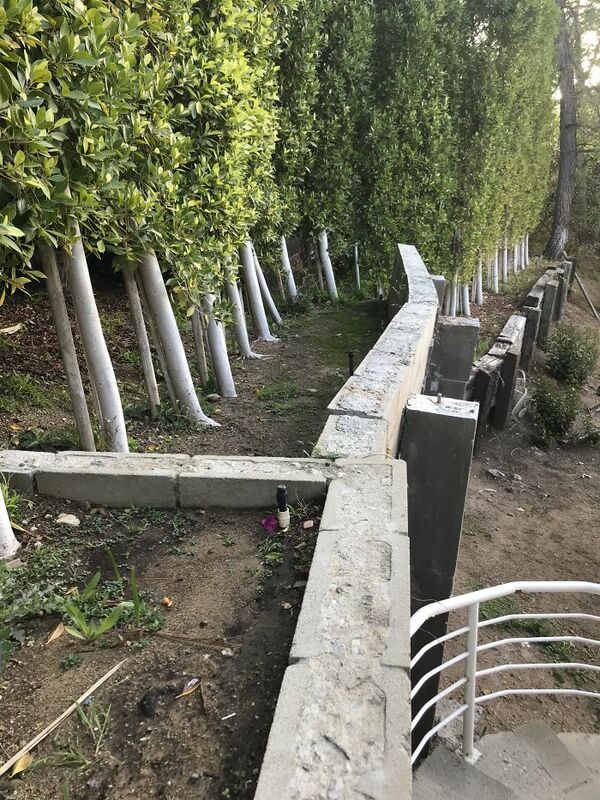 This is a “retaining wall” in the back yard of a Los Angeles property we inspected. 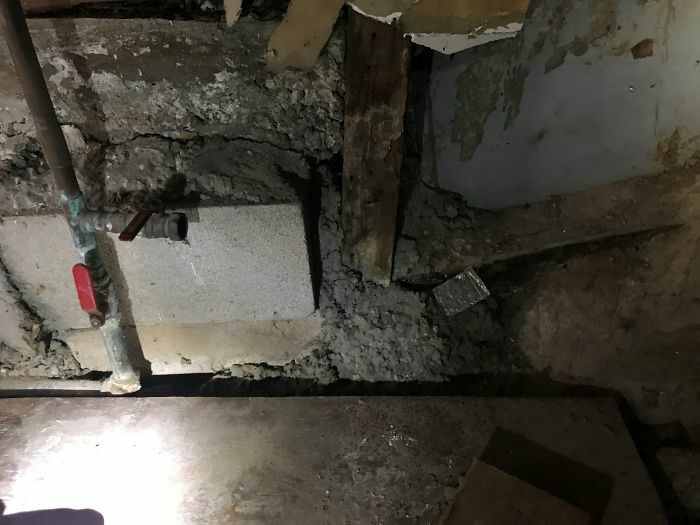 We’re in contract to replace it completely. 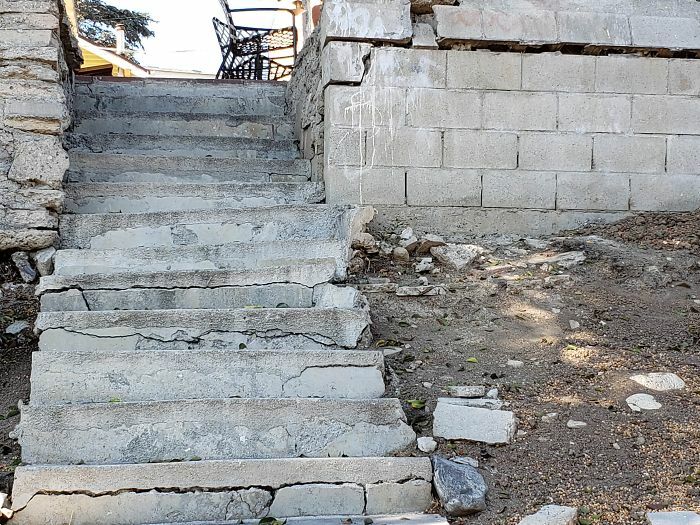 The stairs are crumbling to bits, the wall to the right is, well, not doing so well and it’s sinking. The portion of the wall to the left of your screen is a complete mess… and that’s an understatement. Made up of stone, mortar and concrete slabs from who knows when. 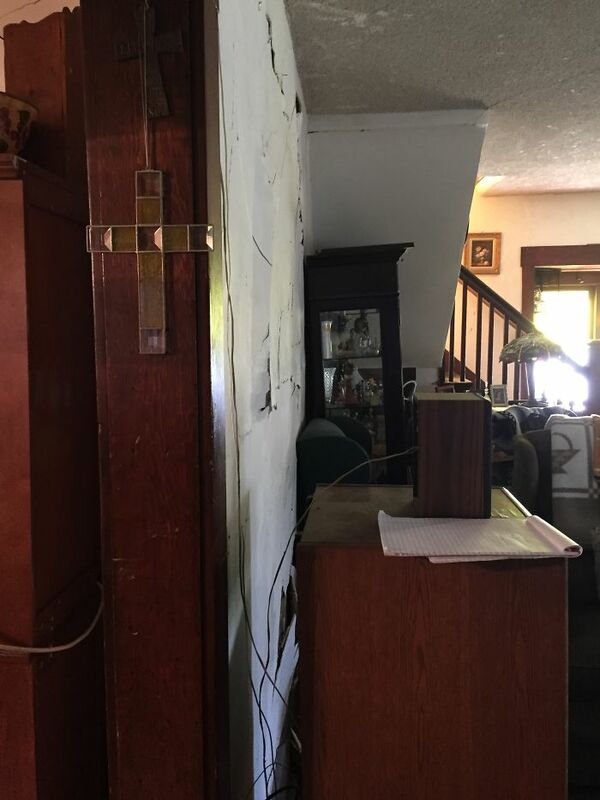 The wall is being pushed out from the weight of the home. This is commonly referred to as surcharge. 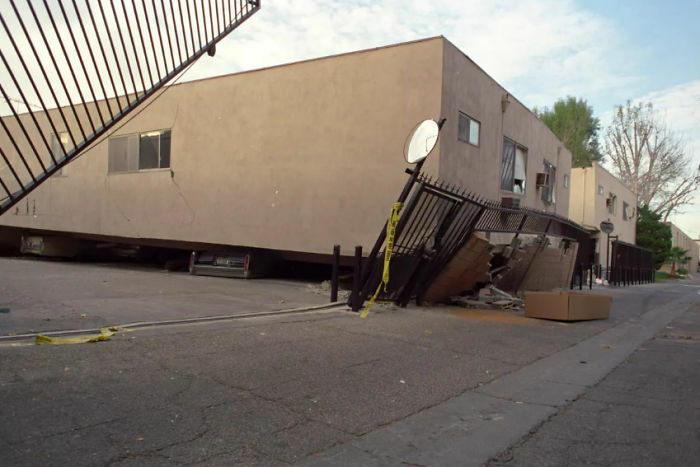 Surcharge is basically when the vertical pressure or load of the property over the ground surface causes the earth to be pushed outwards. 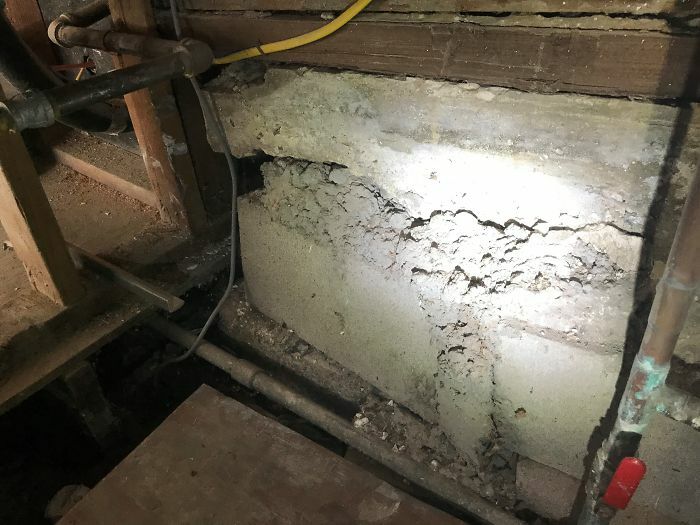 This has caused the flat-work around the home to bubble and come up. 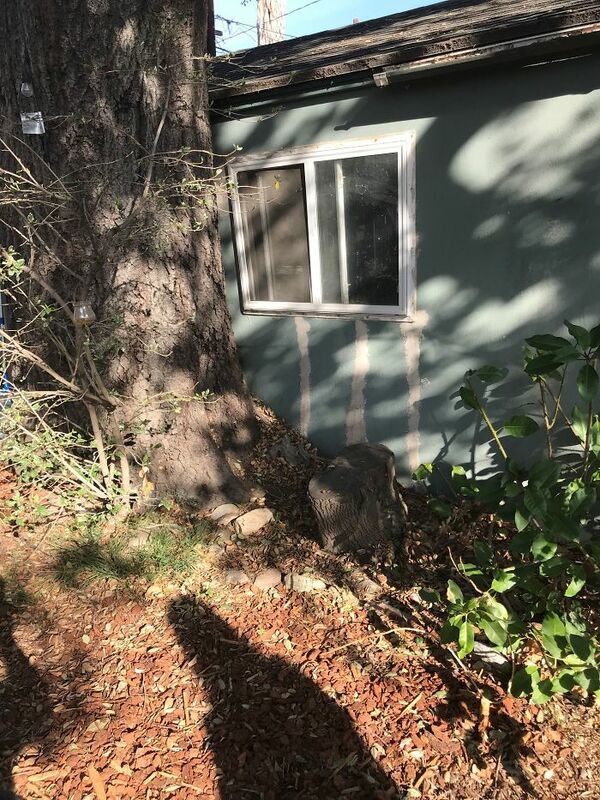 The tree roots don’t help. 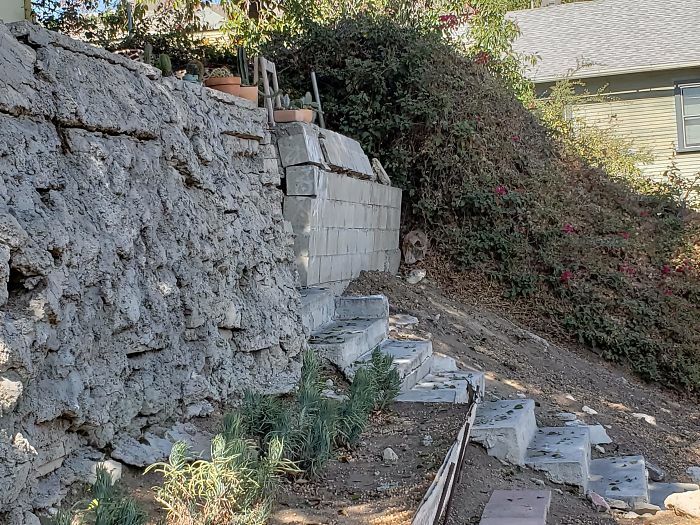 This was a retaining wall that was leaning roughly 20%. About anything under 10% can be fixed in most cases, but something like this would need to be replaced. 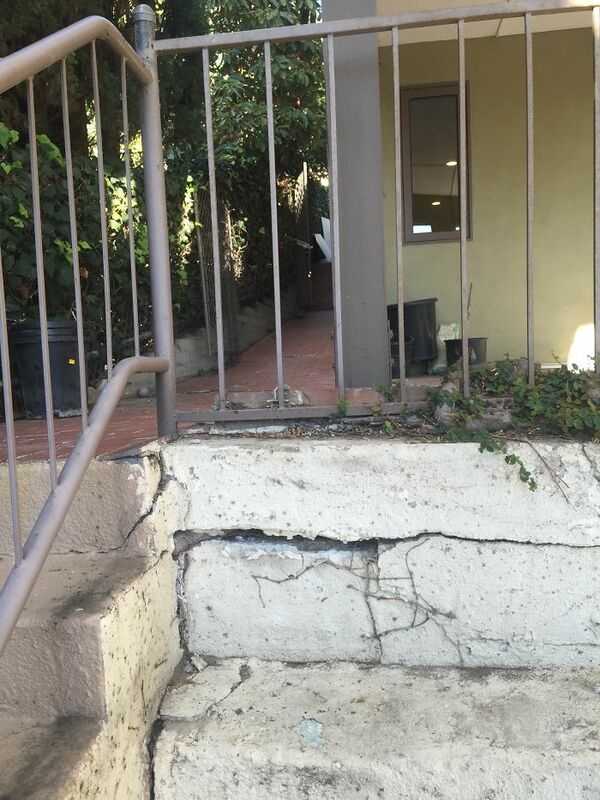 As you can see at the bottom, the concrete walkway is beginning to displace and sink near the footing of the wall. 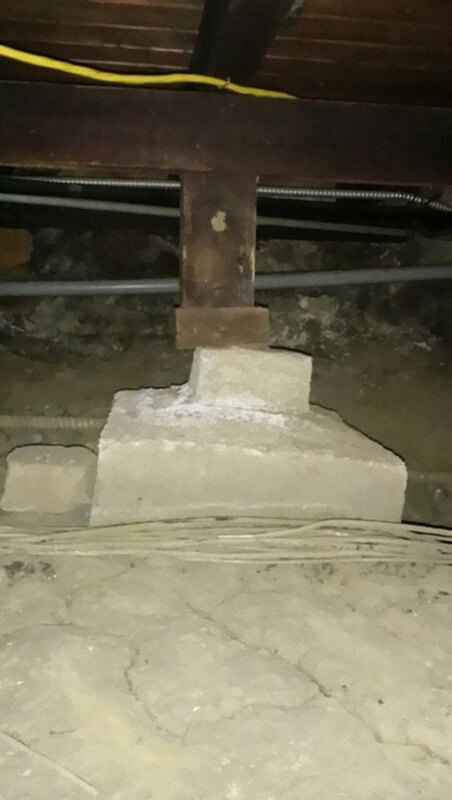 This causes the weight from above to choose a side to put it’s weight down onto. 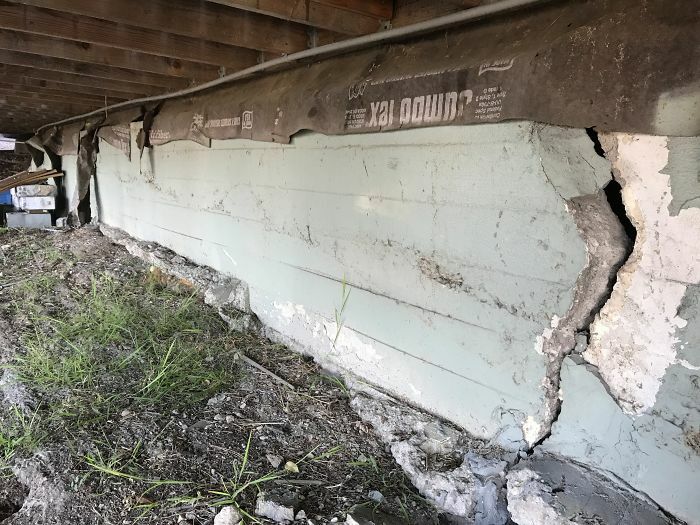 Since there is dirt on the other side, of course the wall starts leaning in, causing this potential wall collapse over the walkway. 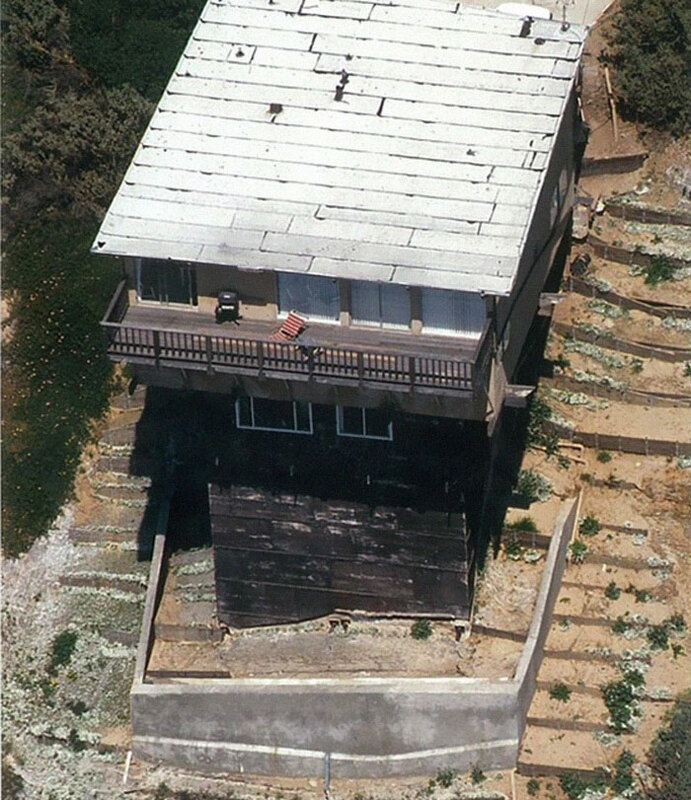 This was a home in the hills of Hollywood that was unfortunately at the top of a landslide. 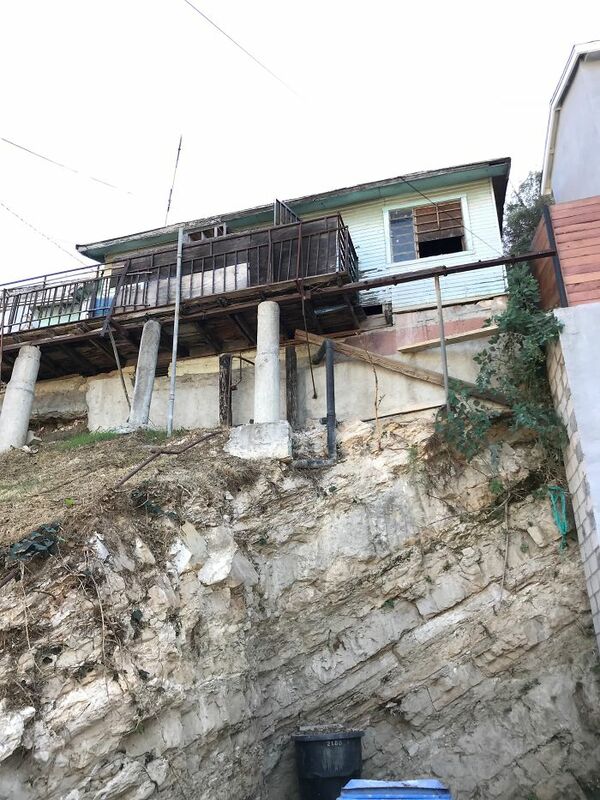 The foundation of the home couldn’t take the tension that was being created while the hillside went down. 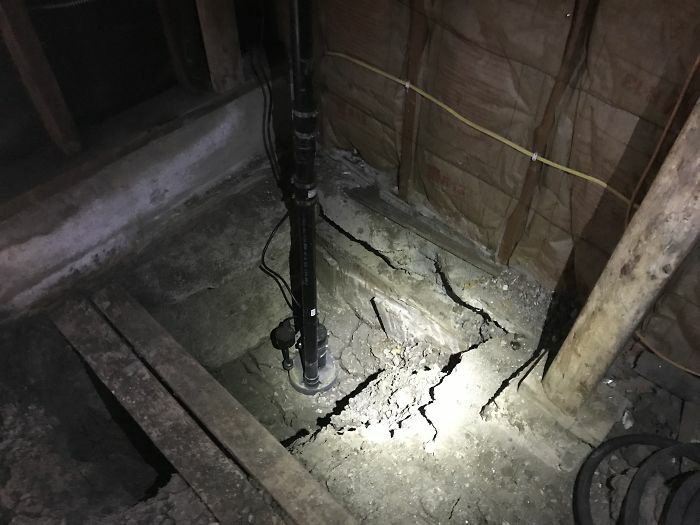 This caused the framing/sub-flooring to almost completely collapse. 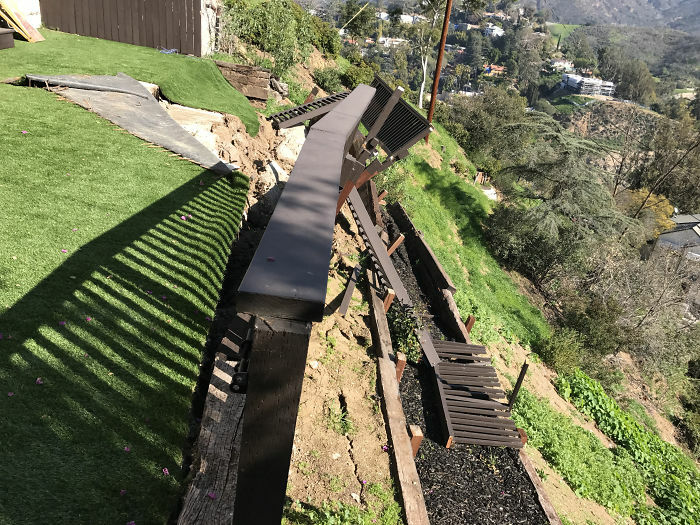 Here’s another picture of the landslide home in the Hollywood hills. 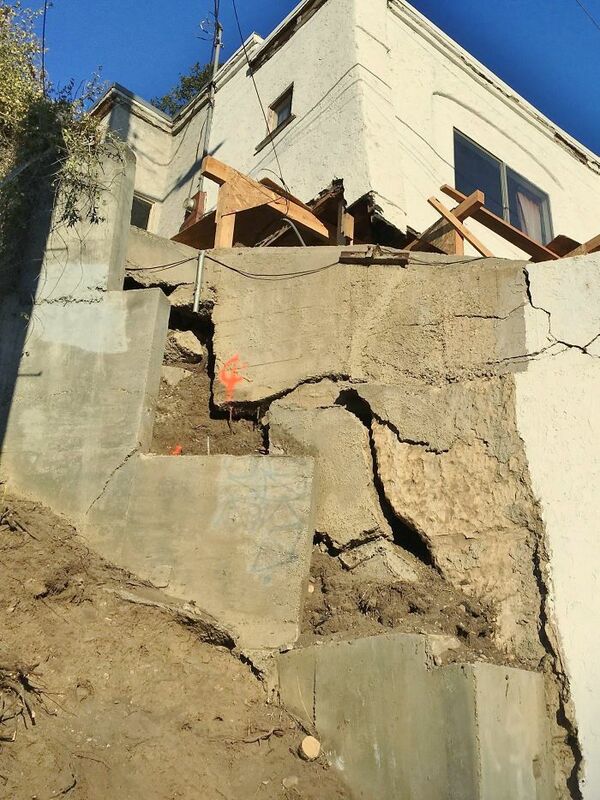 This one gives you a good perspective on the effect the landslide had on the home. 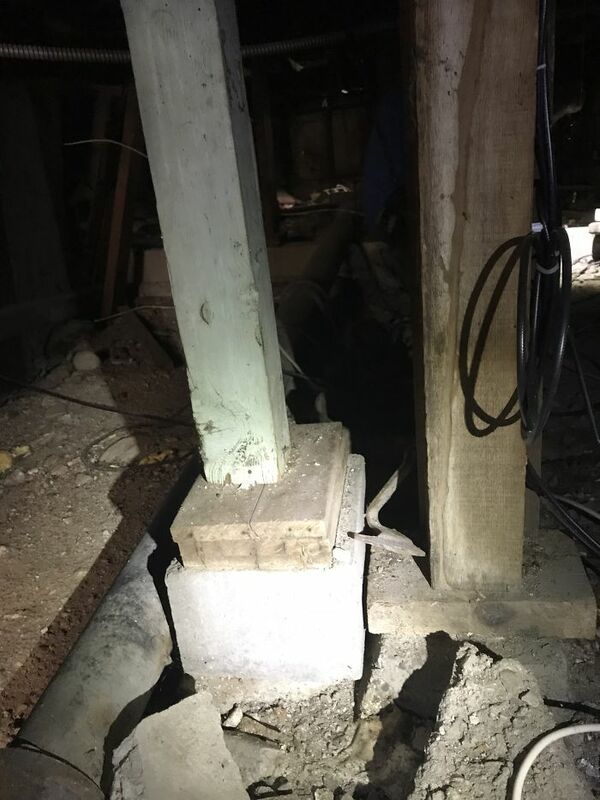 Almost all of the post/piers weren’t braced and this caused the leaning that you’re seeing. 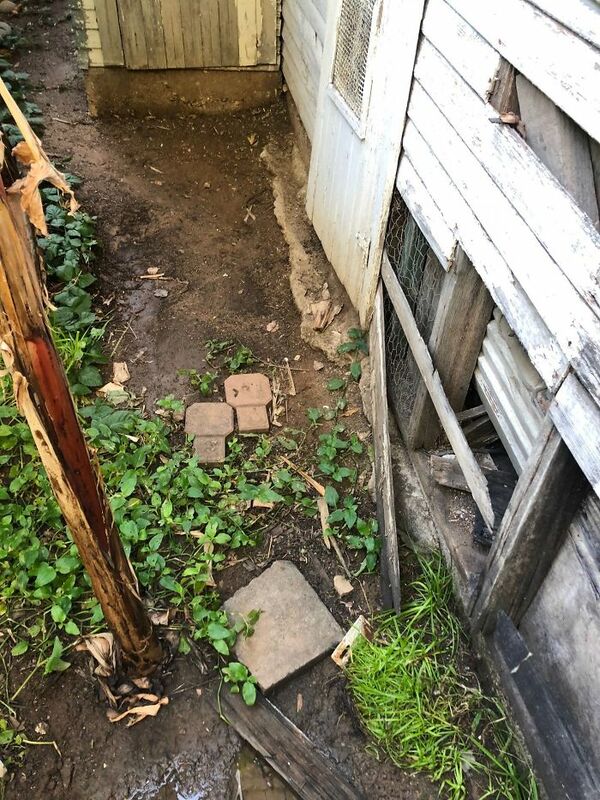 Chicken wire, tin siding, rocks, bricks and burnt wood… I guess the devil needs a home too. 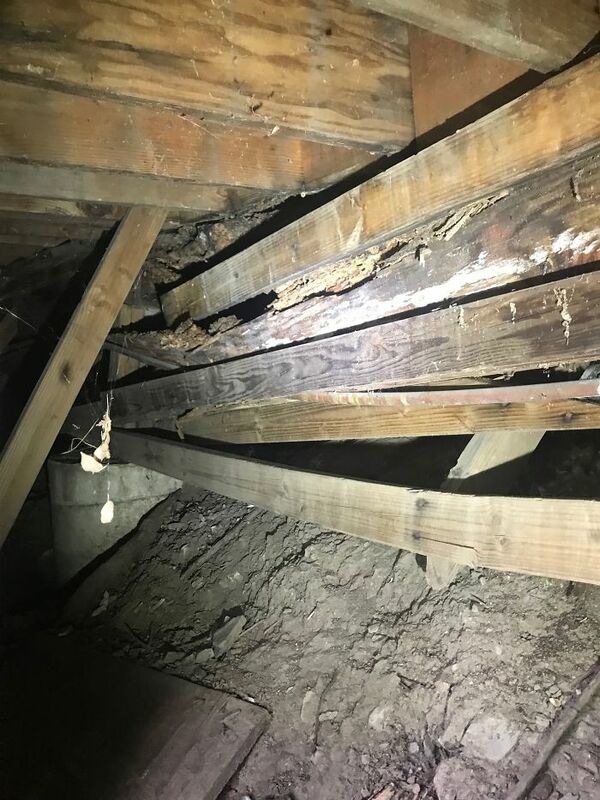 This is the result of an overgrown oak tree that was way too close the structure. 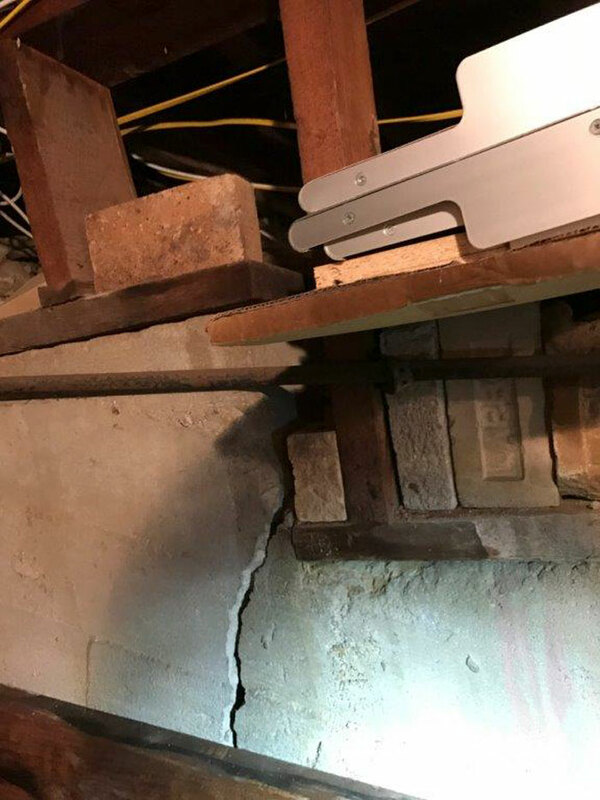 It ended up breaking through the wall and foundation of the garage. 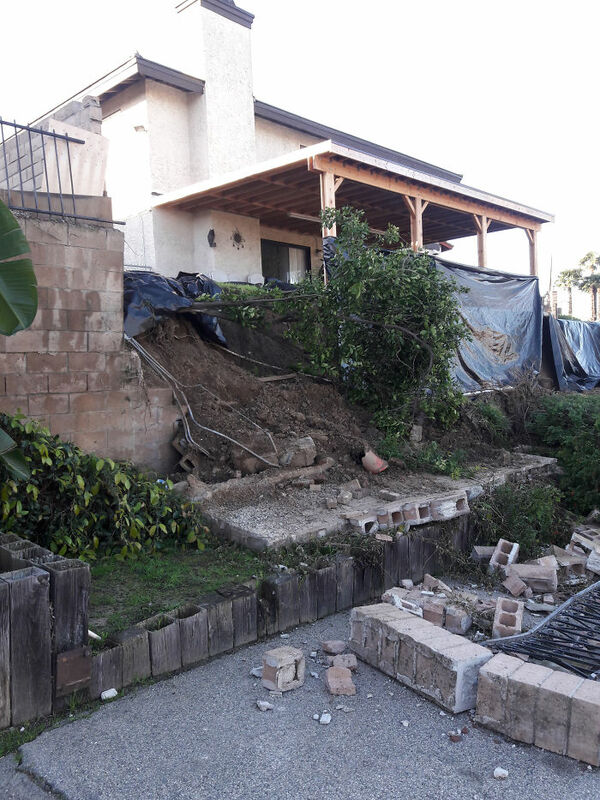 Here’s the massive oak tree that is attacking this man’s home. Unfortunately for him, oak trees such as the one above are protected by the city and can’t be removed/trimmed.